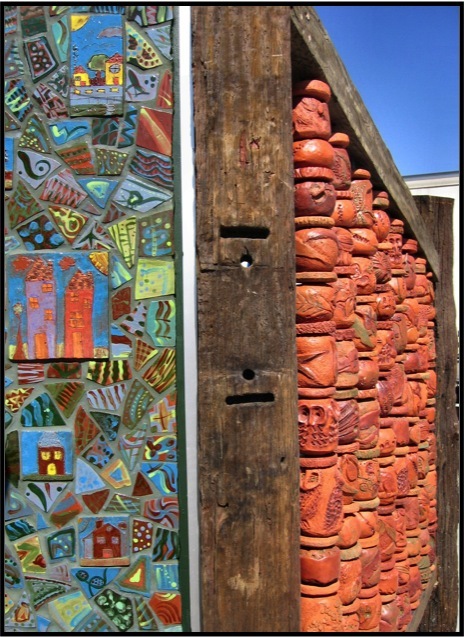 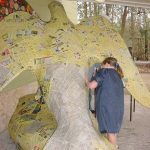 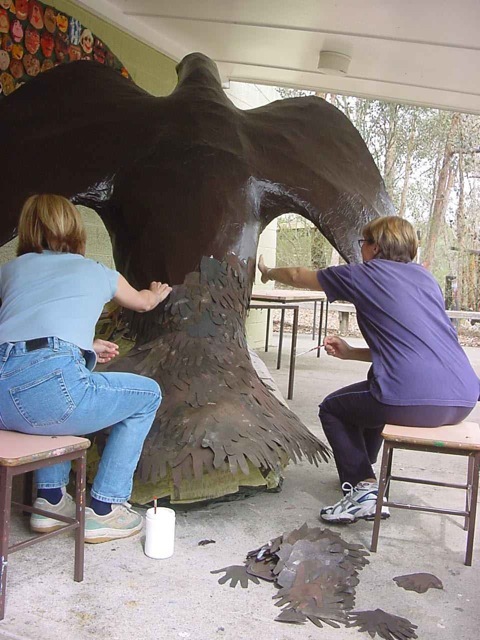 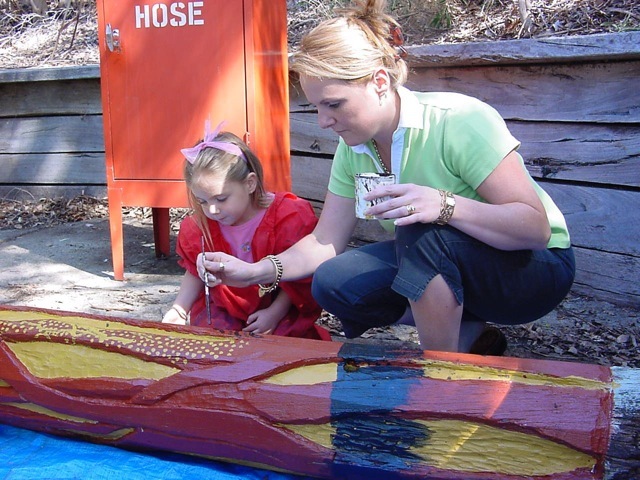 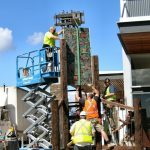 The actual building of these public works of art has involved participation by many diverse community groups and individuals. 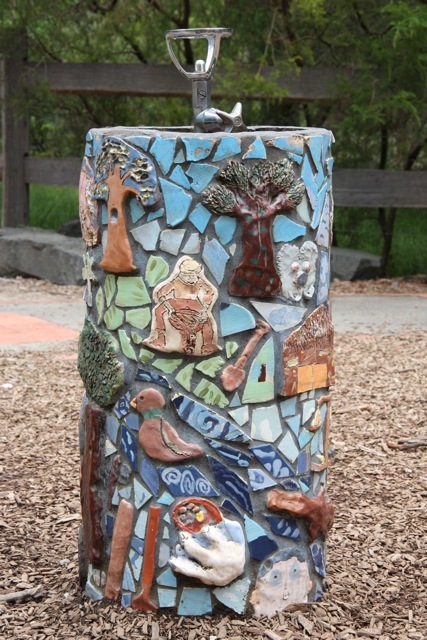 Our local government authority the CIty of Manningham who through community Develoopment grants have provided funding for these projects, Artist Robert Tickner formerly of the City of Knox Placemaker team, Local artists Amanda Sgourakis, Marjorie Beecham and their group of ceramicists have been on this journey with us and have willingly contributed their time and expertise to each project. 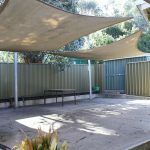 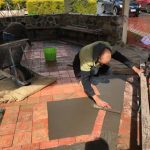 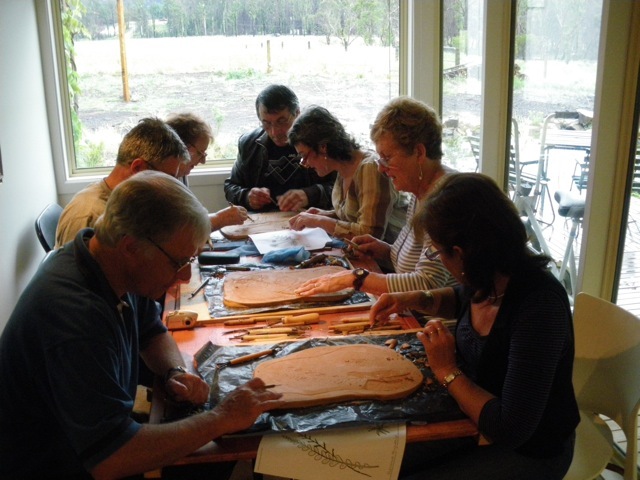 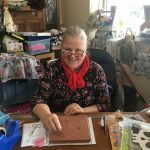 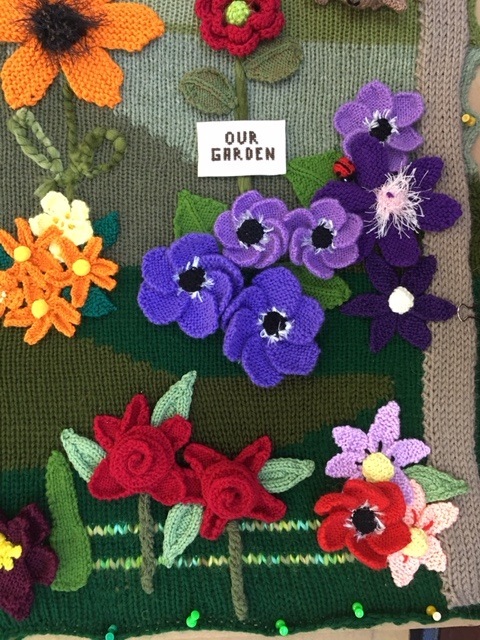 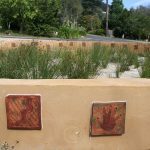 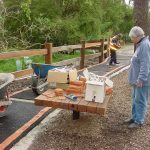 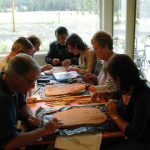 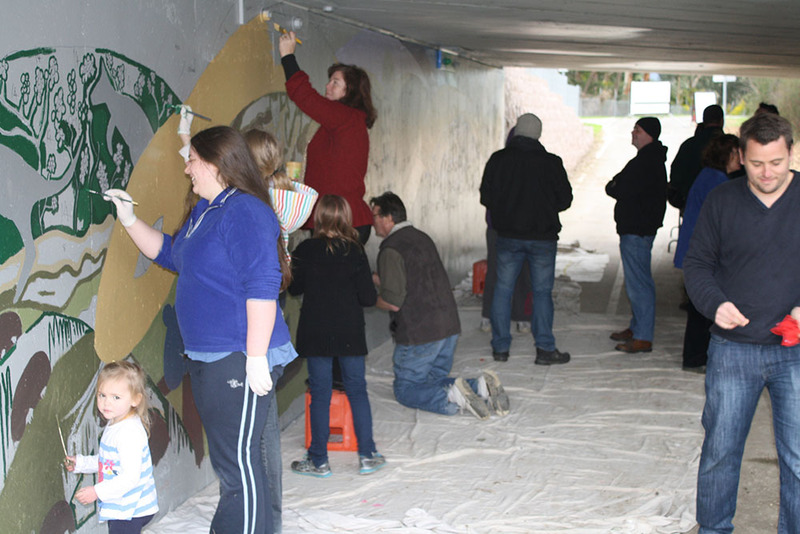 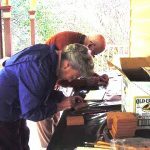 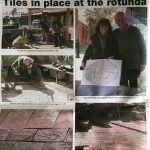 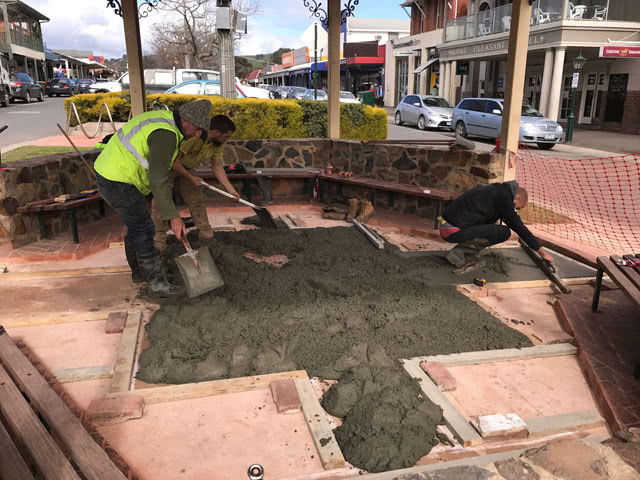 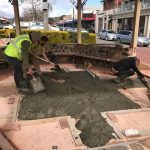 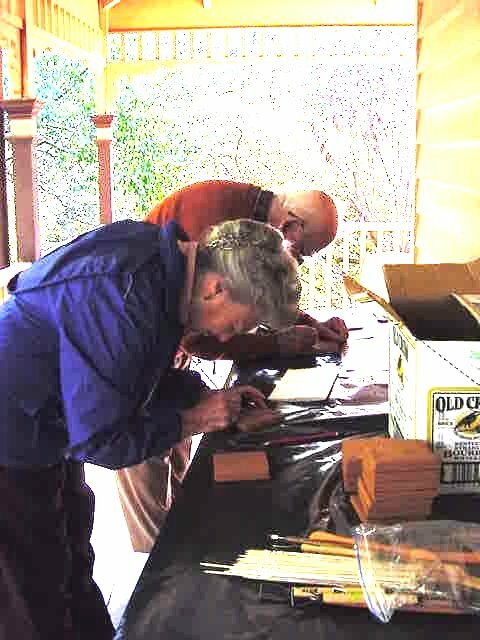 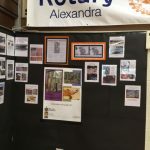 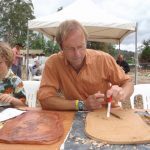 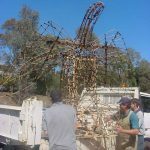 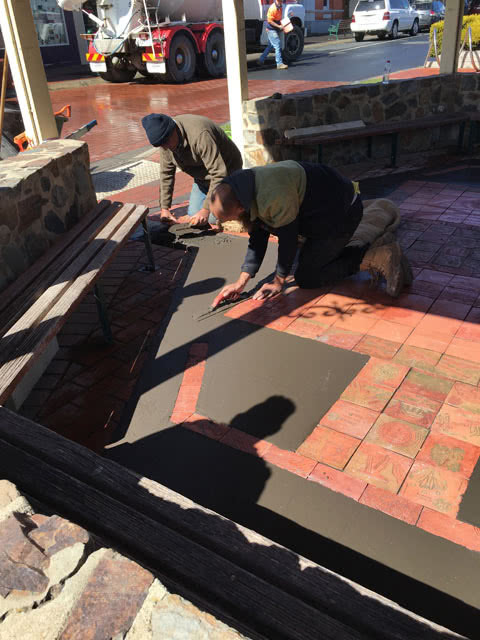 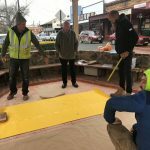 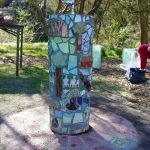 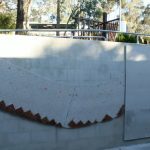 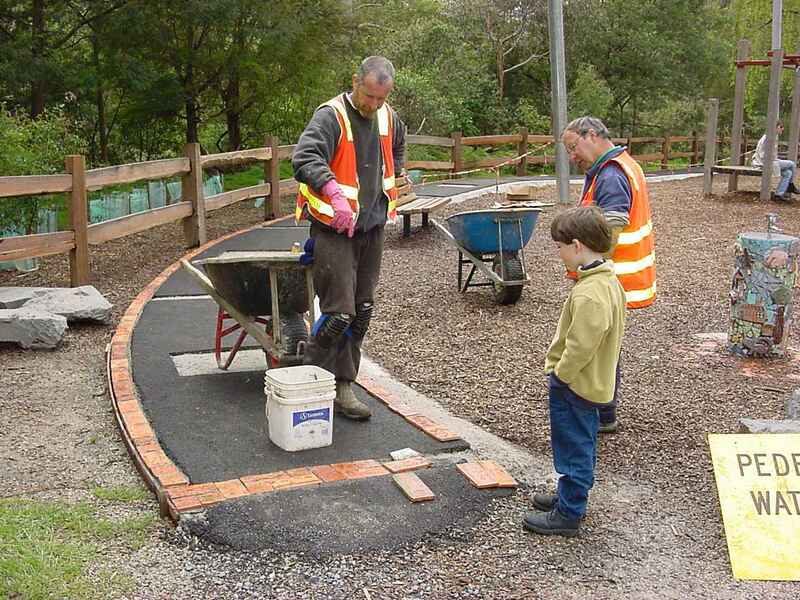 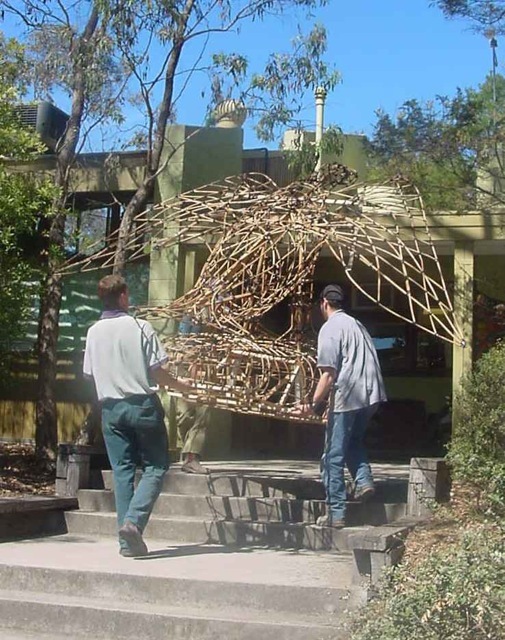 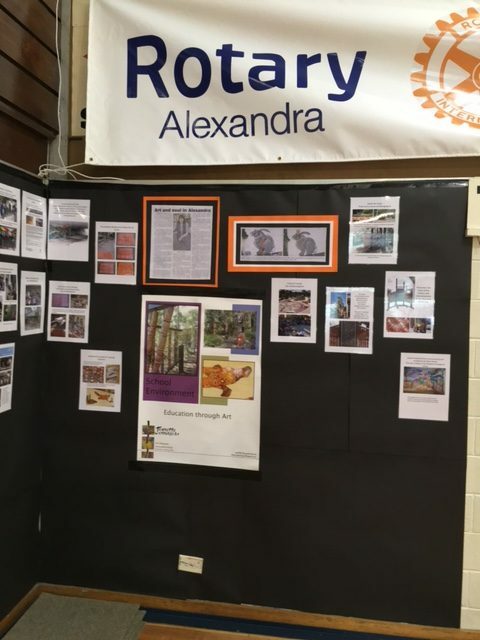 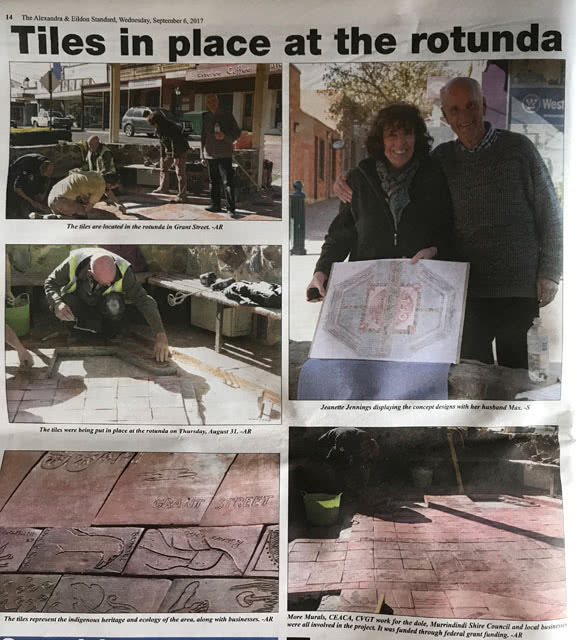 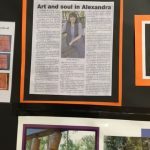 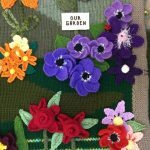 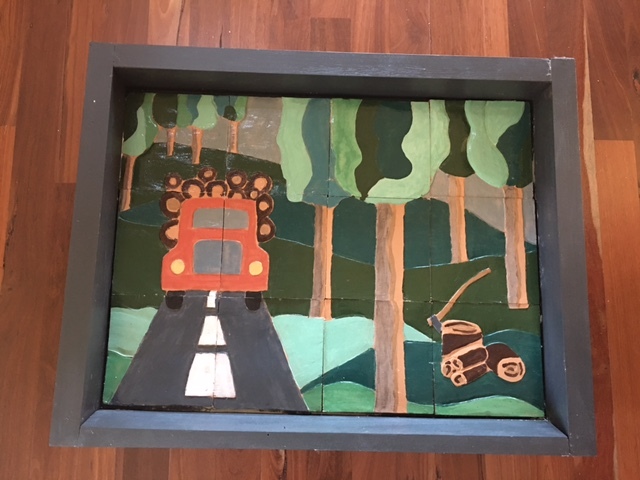 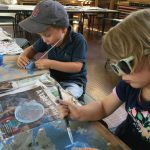 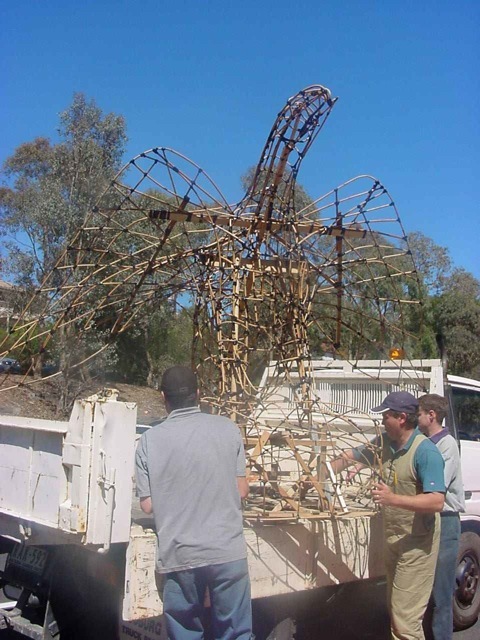 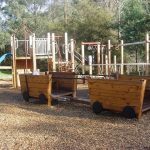 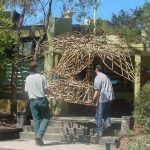 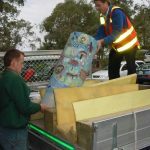 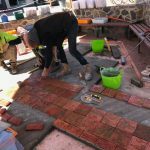 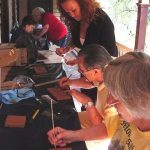 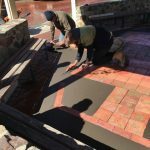 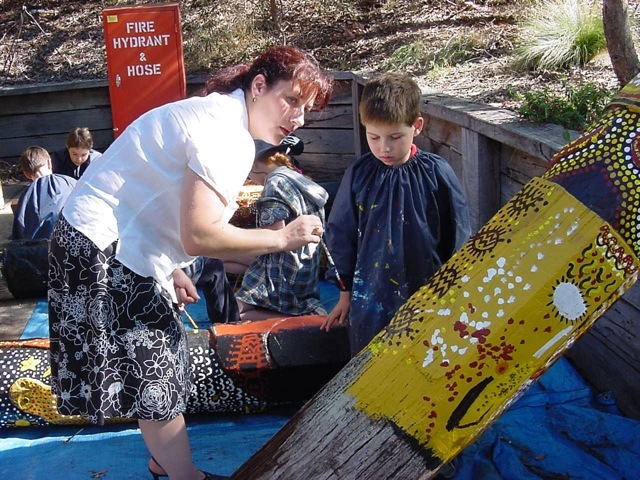 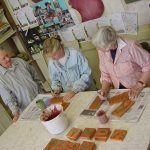 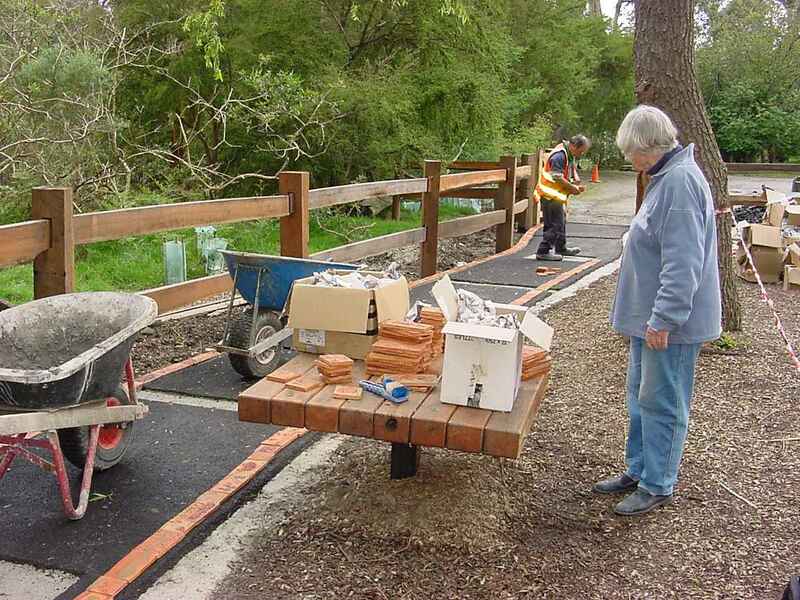 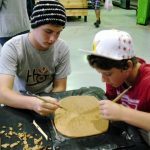 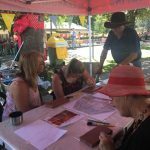 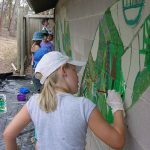 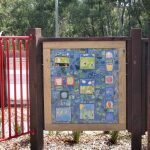 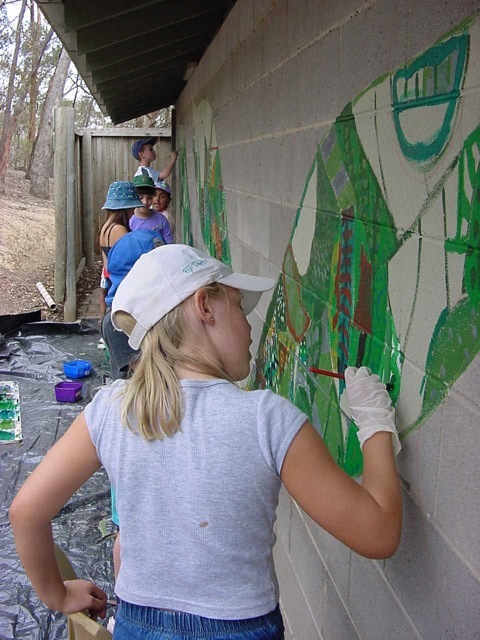 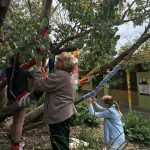 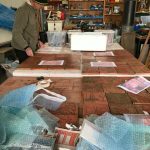 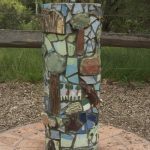 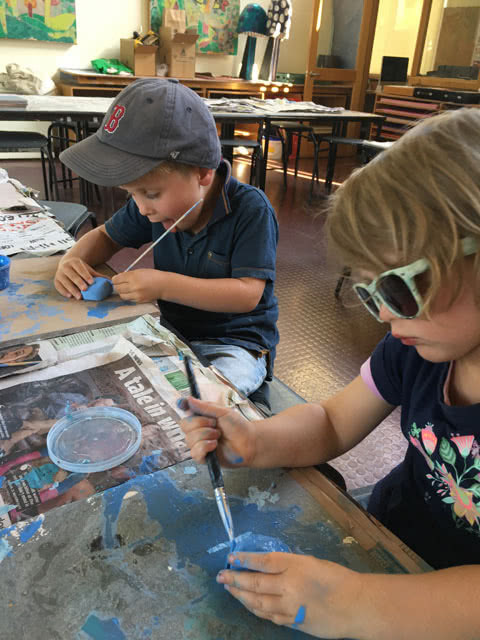 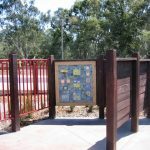 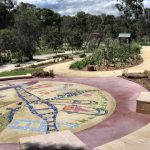 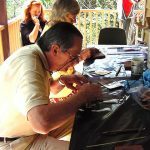 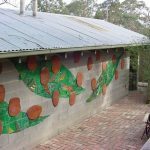 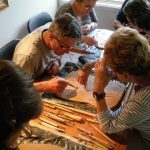 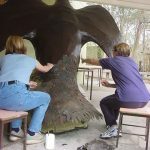 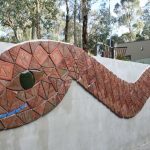 Other participants have included local primary schools, pre-schools, special needs groups, gardening groups, local residents, scout groups, Warrandyte Historical Society, Local business groups, residents within the city, and other community groups along with the team at Crafted Landscapes. 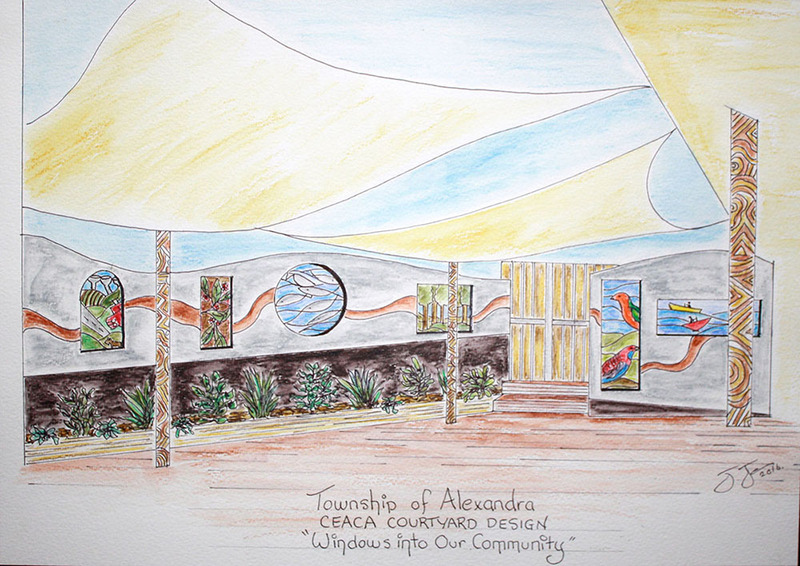 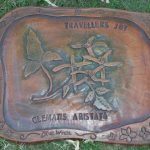 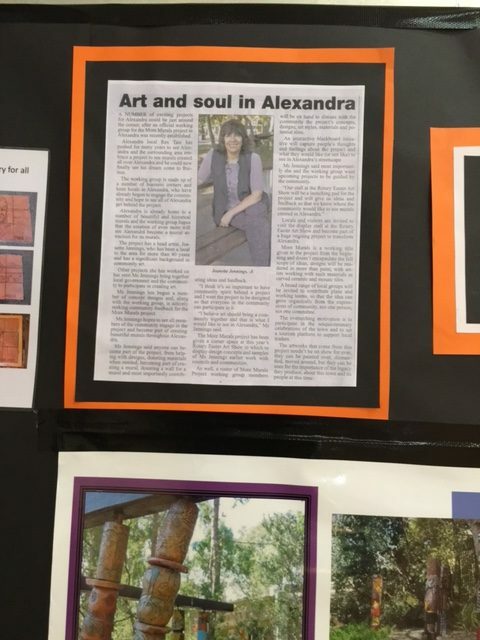 This permanent installation is in commemoration of the township of Alexandra’s 150th year. 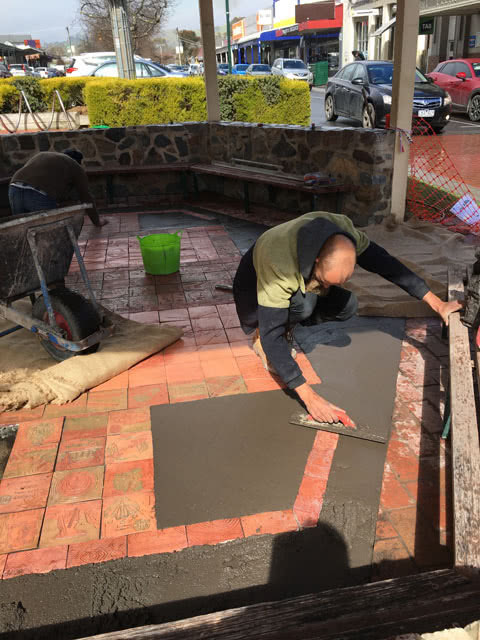 It is a CVGT Victorian Government work for the dole project and has included work for the dole participants working across all levels of the process for many months. 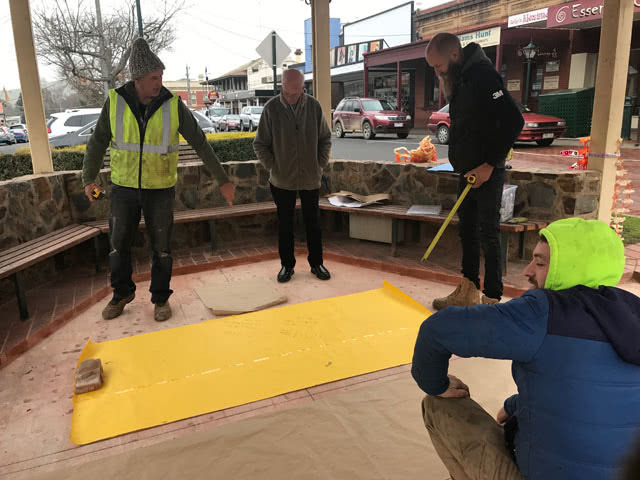 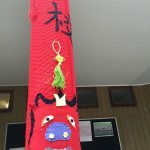 They have learnt the skills involved in the creation of such an installation and have successfully involved guiding the residents and businesses in completing their individual contributions. 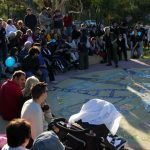 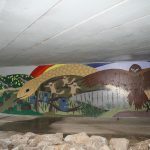 The design for this project has taken into account the history of the area and allowed for individual expression and broad community involvement. 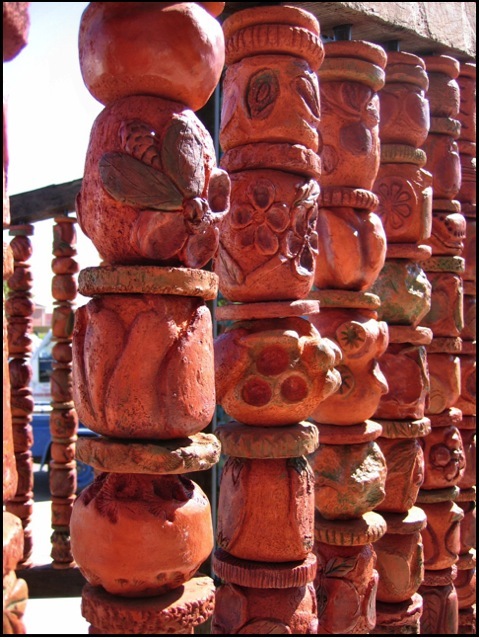 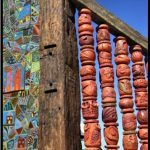 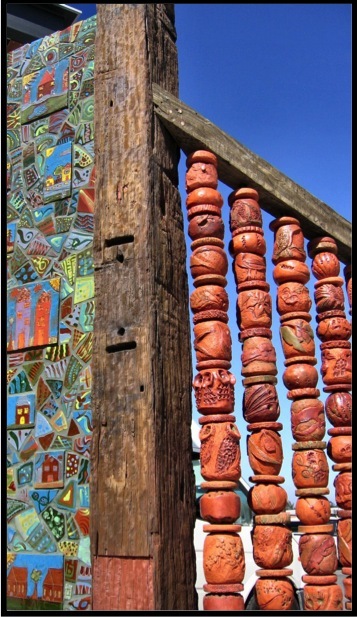 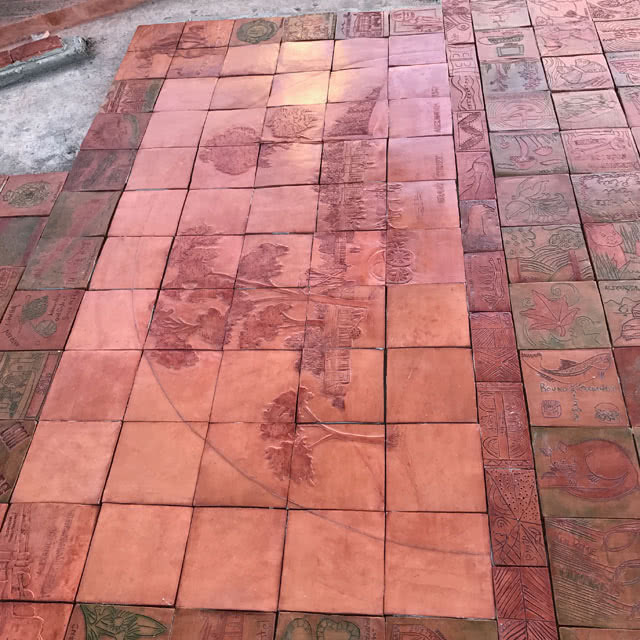 The central walkway and arms of the work involved some 240 traders and businesses with the borders depicting the symbology of the Indigenous people of this place. 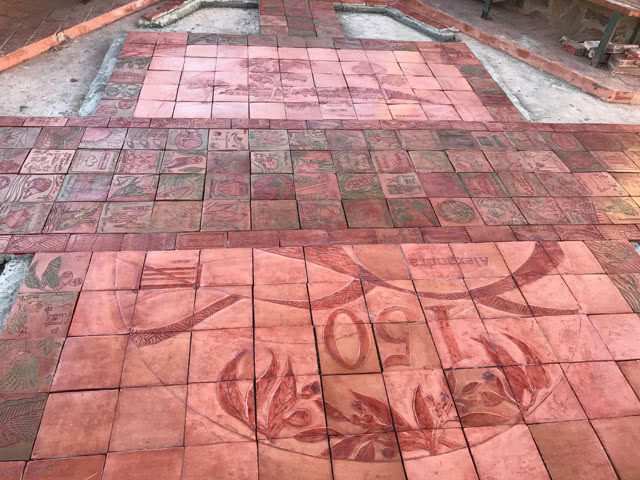 On either side of the pedestrian way is a carved street scene of the main street in 1867 and c­omplementing this on the other side is the 150th year symbol with a threaded ribbon design encapsulating the indigenous pattern work. 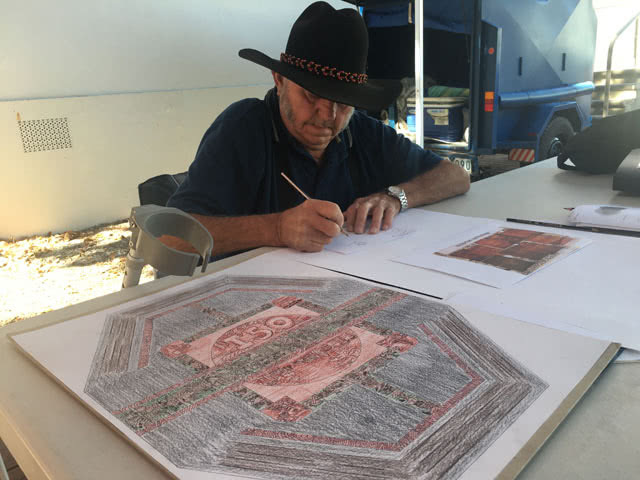 The Late Uncle Roy authenticated all of the imagery and attended the public workshops to discuss the indigenous history and imagery. 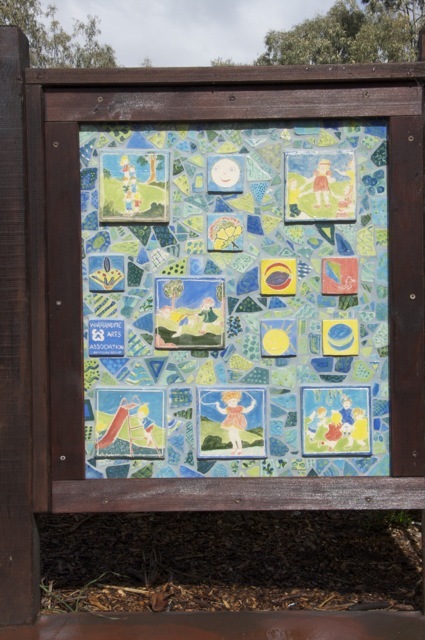 Gardens and Serpells Primary School. 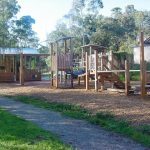 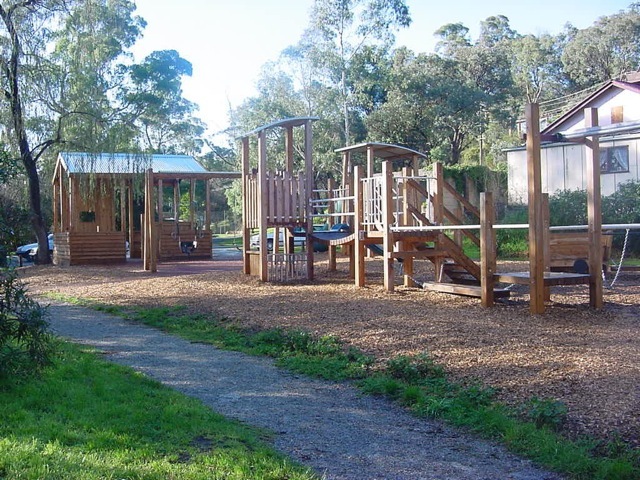 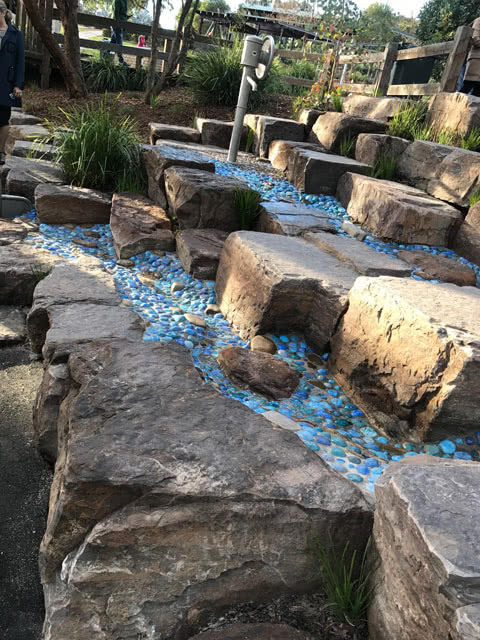 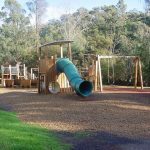 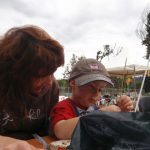 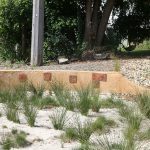 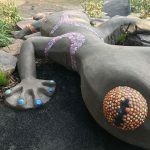 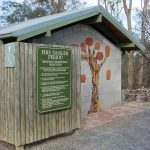 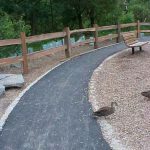 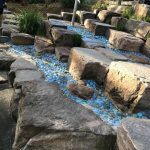 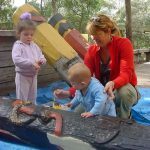 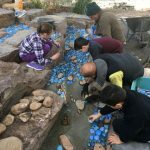 The project involved redesigning and upgrading the existing playground to incorporate a cascading creek bed with a water play feature and a gecko crawling up the hillside. 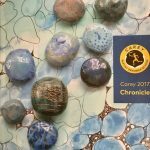 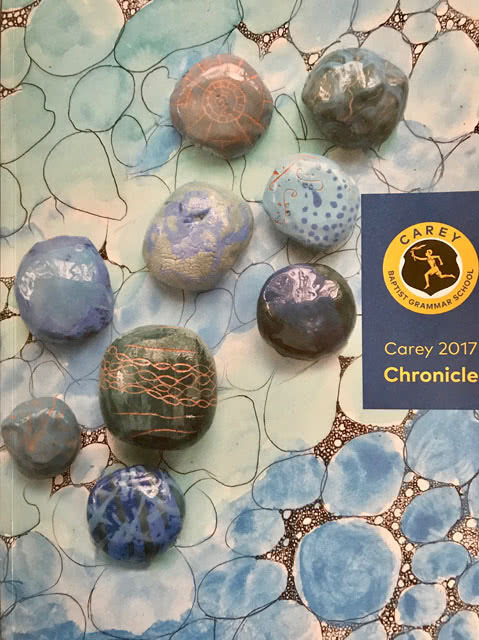 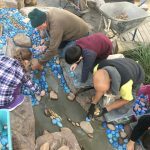 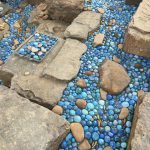 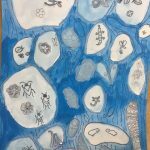 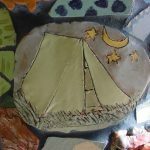 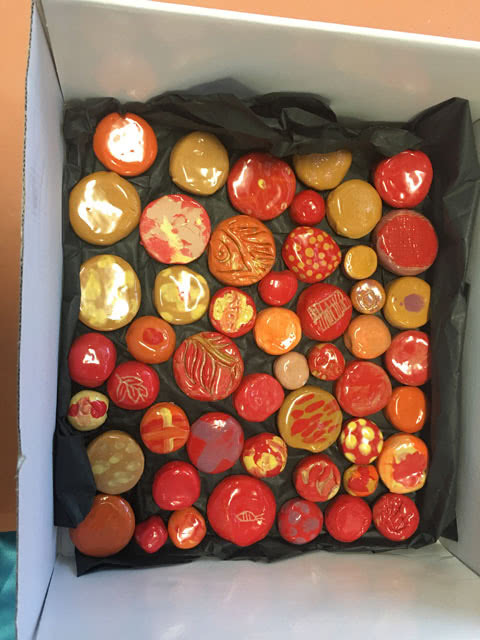 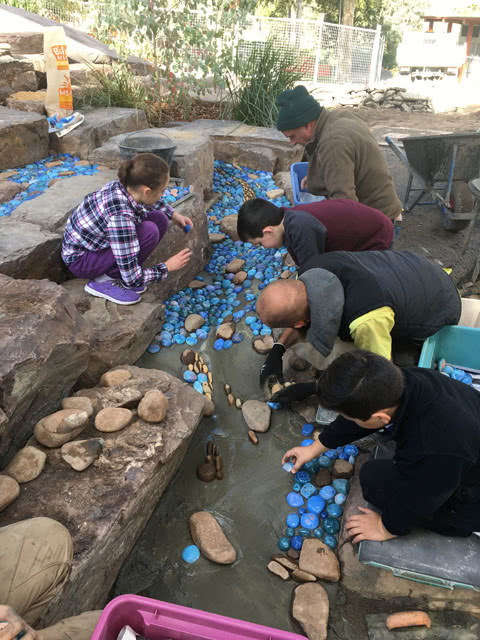 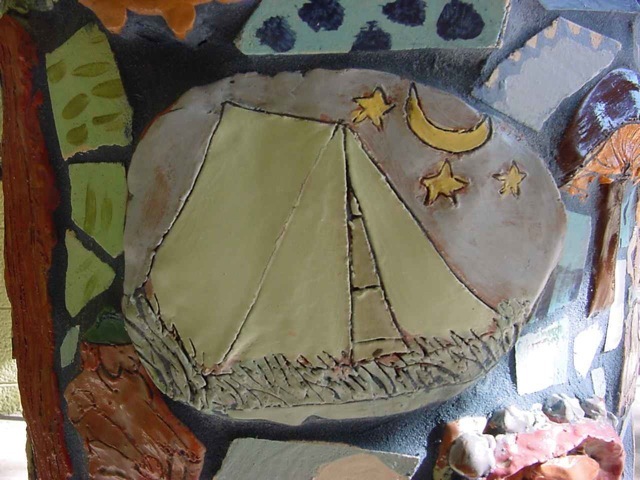 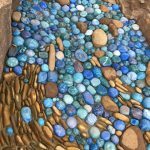 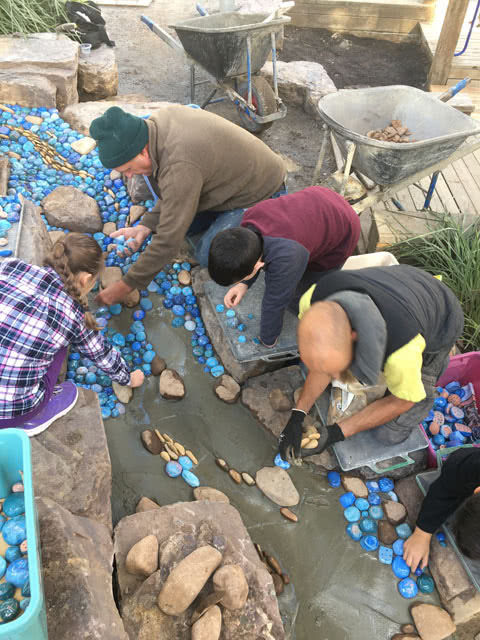 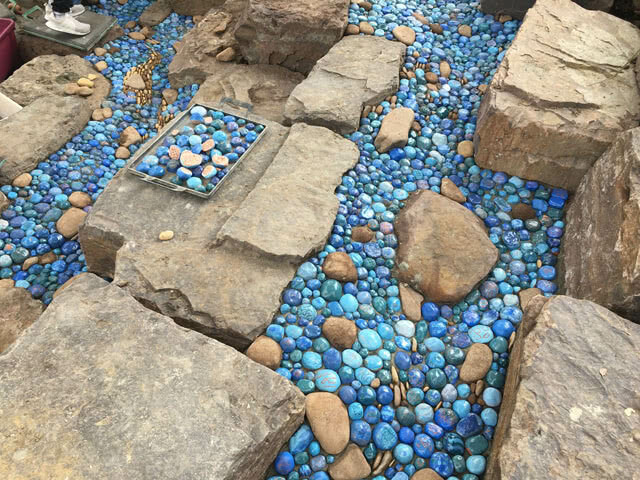 The creek was made up of a variety of decorative hand made rocks created by the school students. 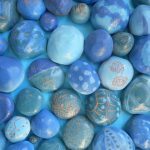 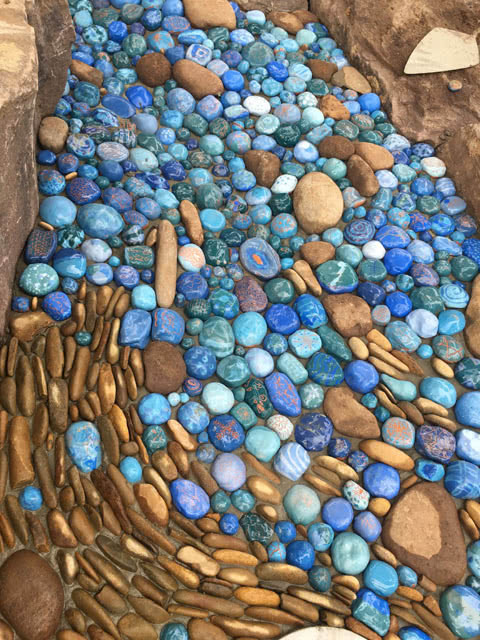 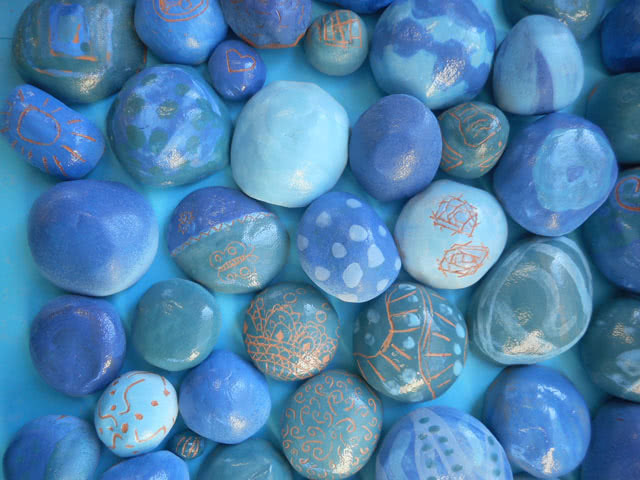 The rocks in varying shades of blues were glazed and decorated individually to create a unique and interesting effect. 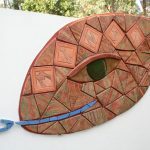 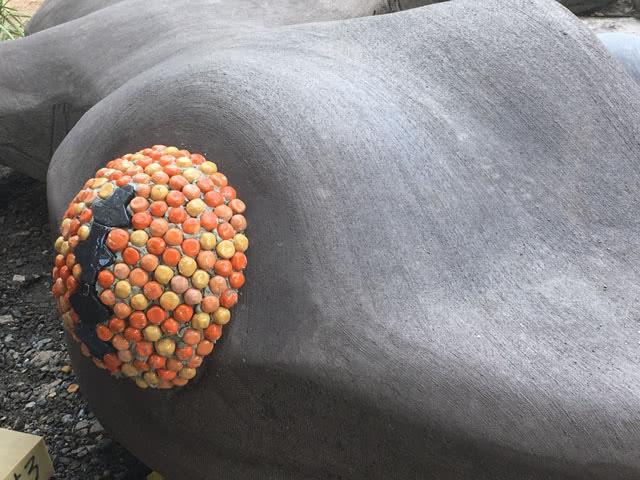 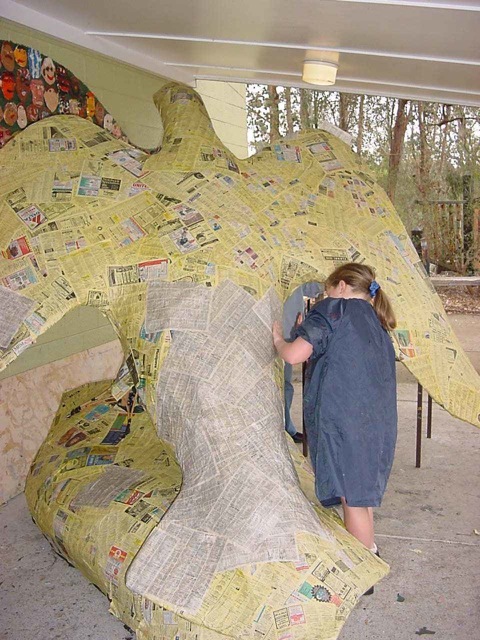 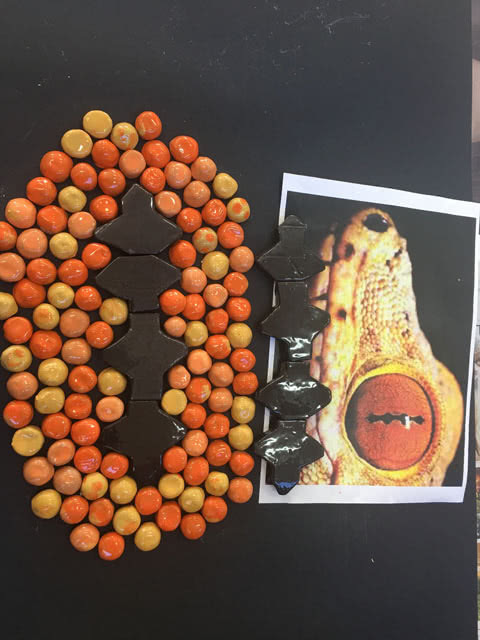 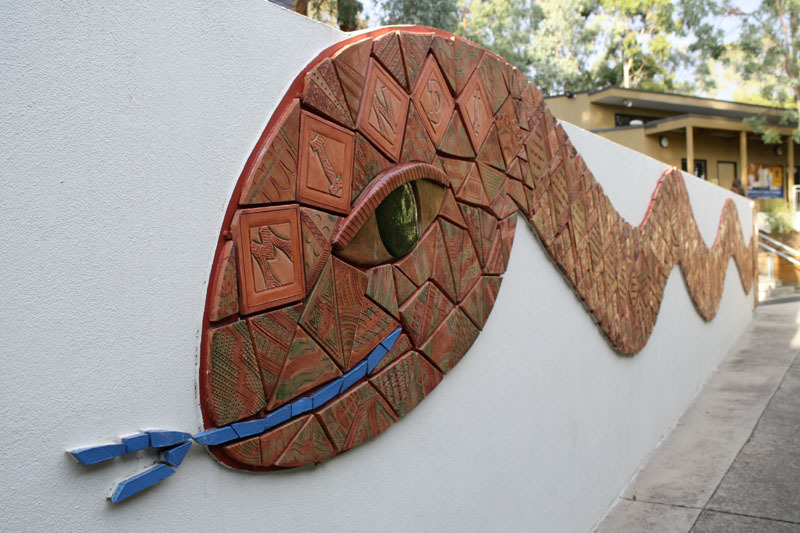 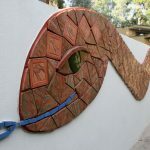 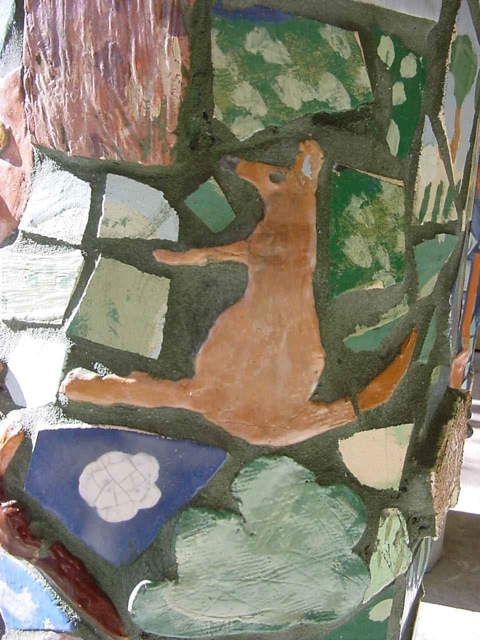 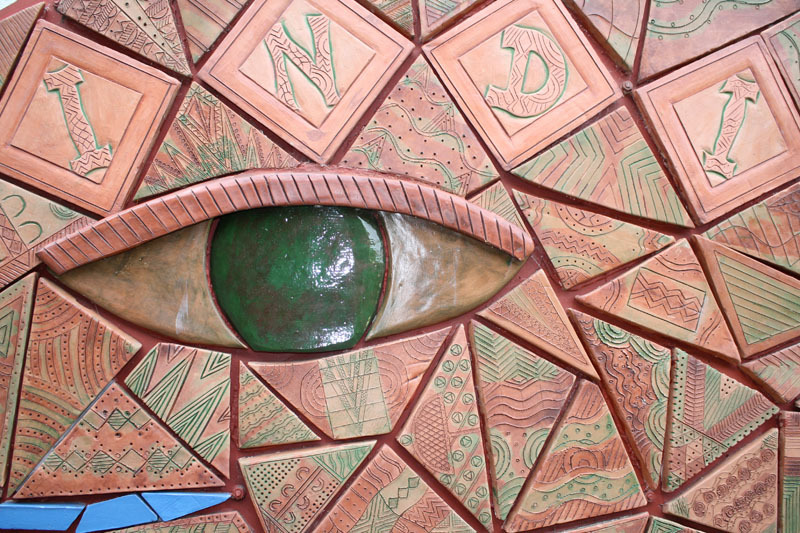 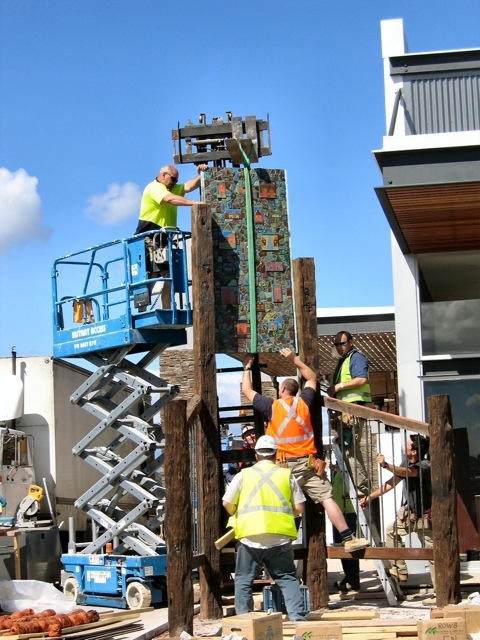 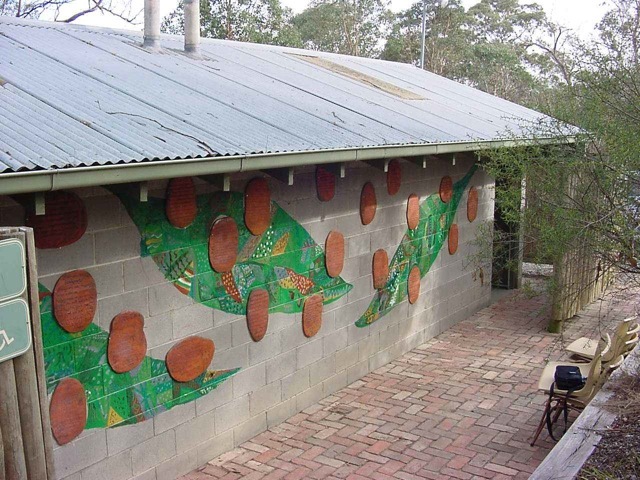 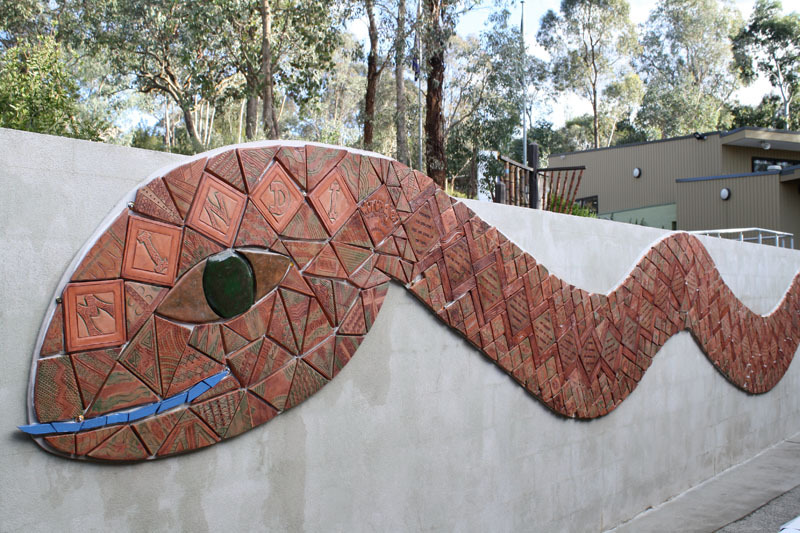 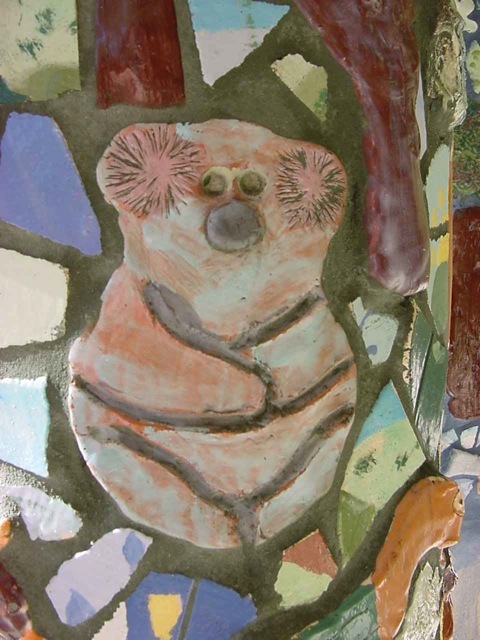 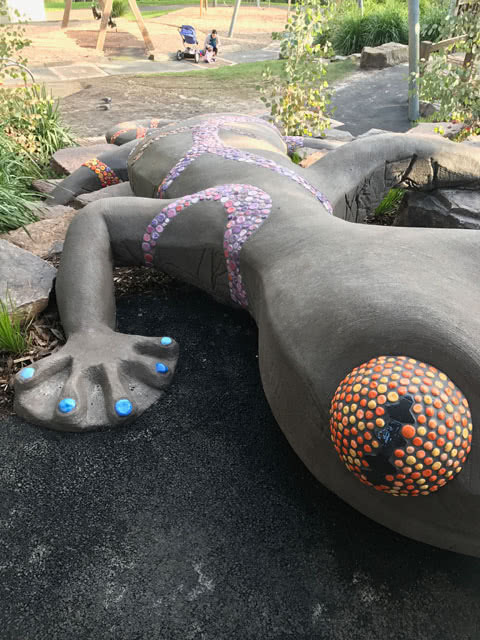 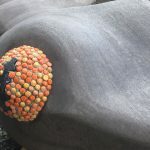 The Gecko was installed by Crafted Landscapes and was the work of our Carey Donvale students, with the students making different shades of mosaic tiles to create a pattern across the Gecko this decorative addition also included the creation of the prominent eyes that are a feature of the work. 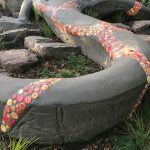 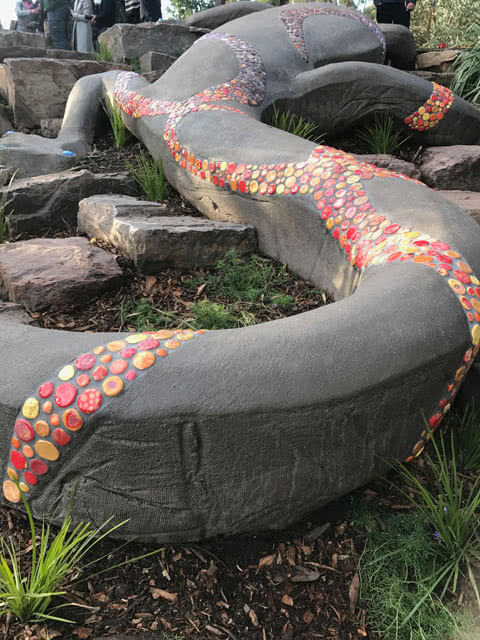 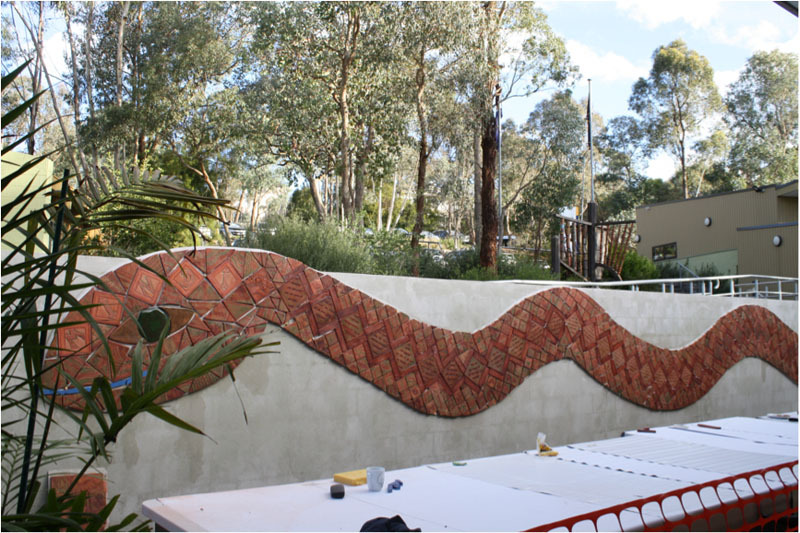 Our beautiful Serpent – Totem of the Wurundjeri people graces our landscape as a reminder of the stories and culture of our Indigenous friends. 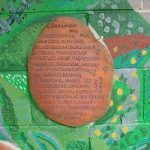 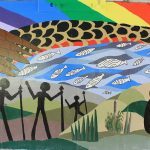 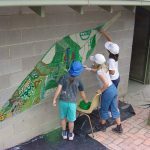 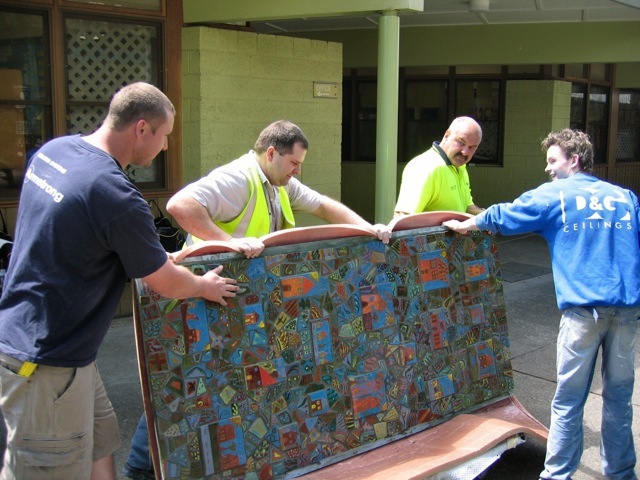 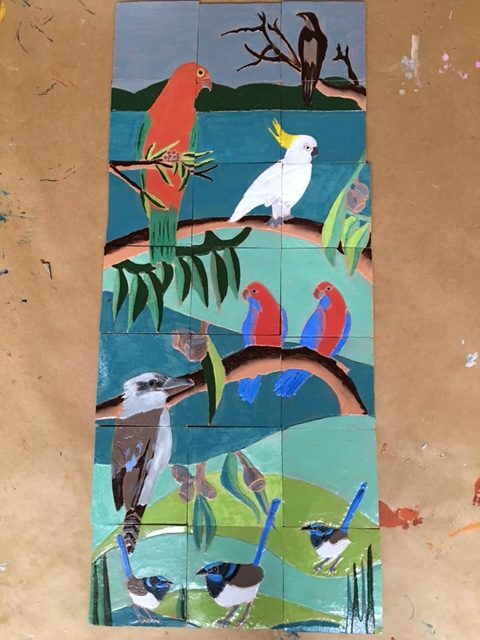 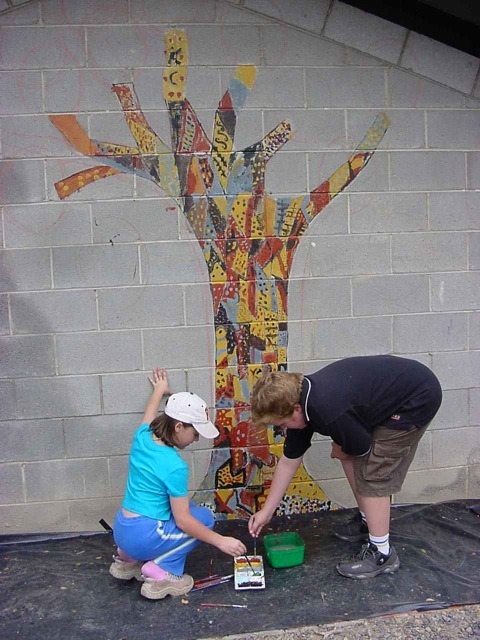 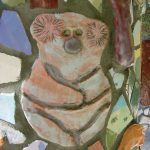 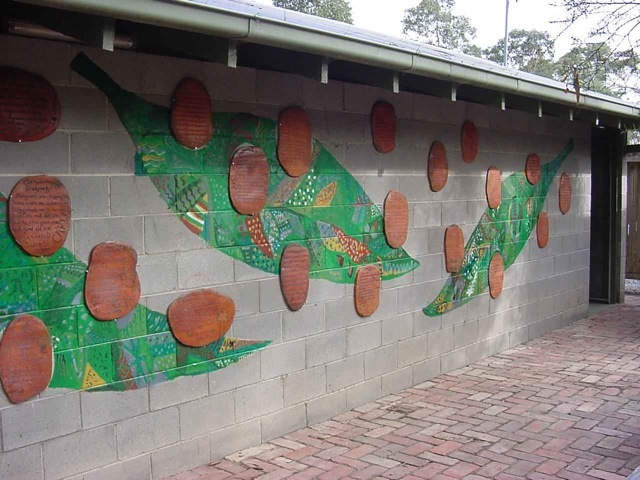 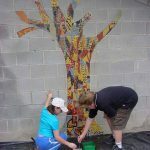 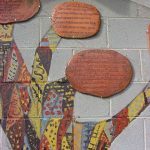 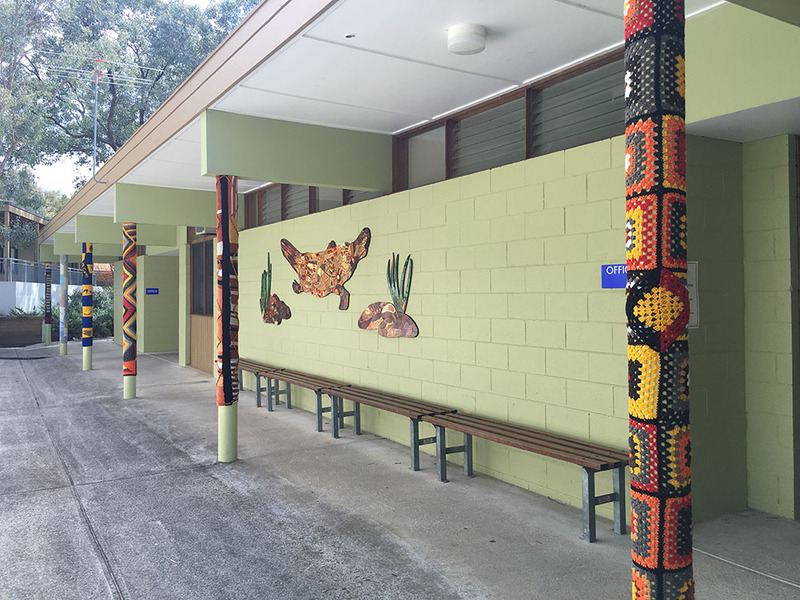 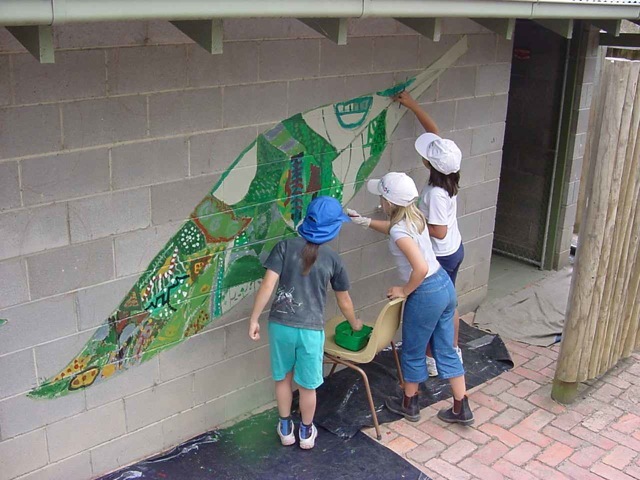 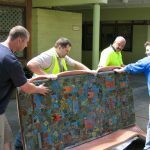 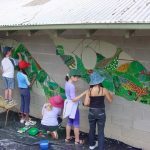 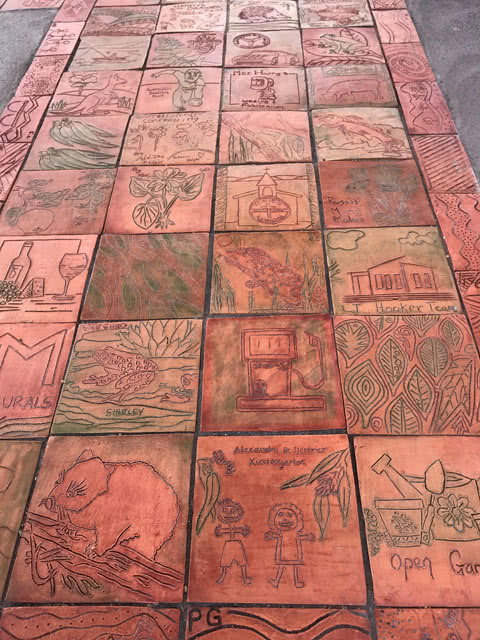 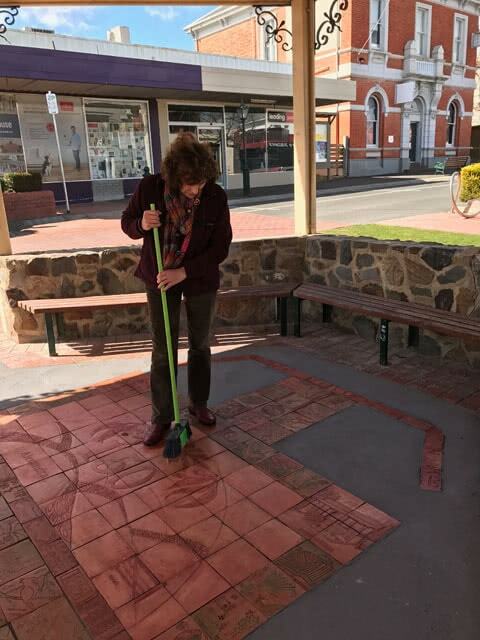 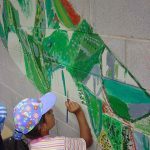 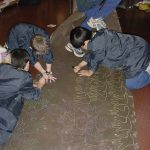 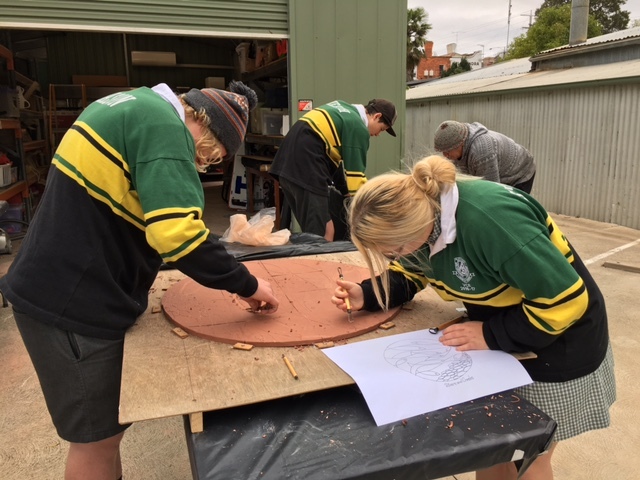 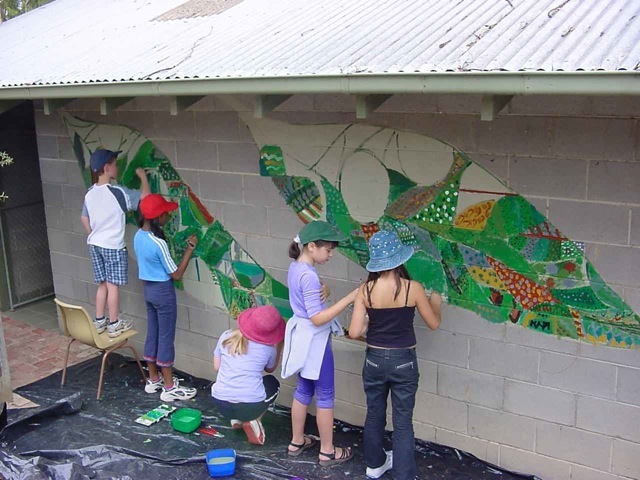 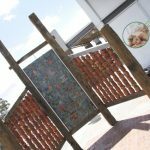 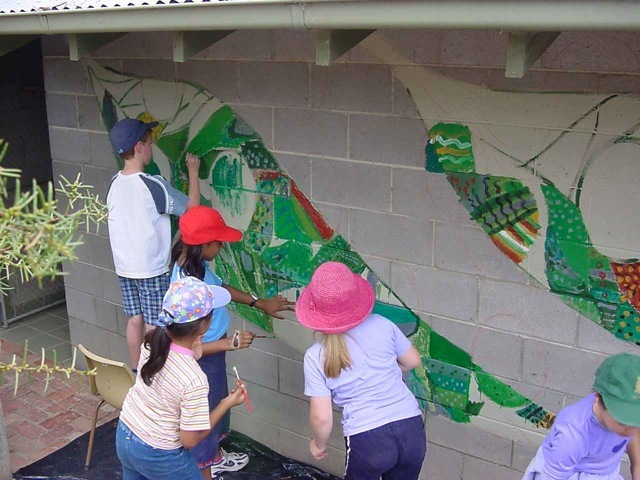 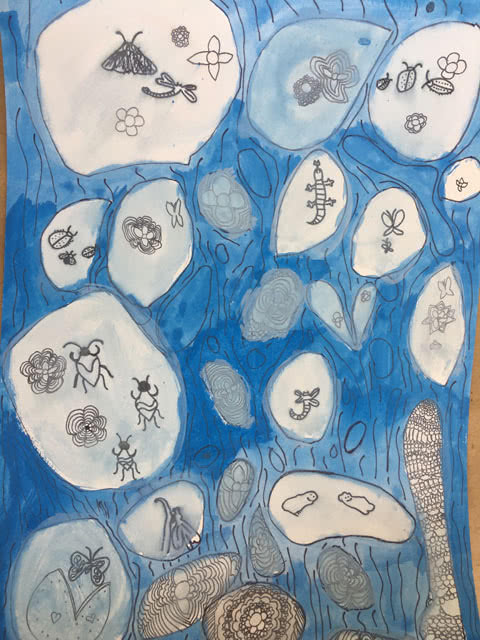 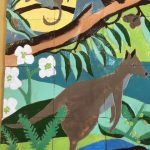 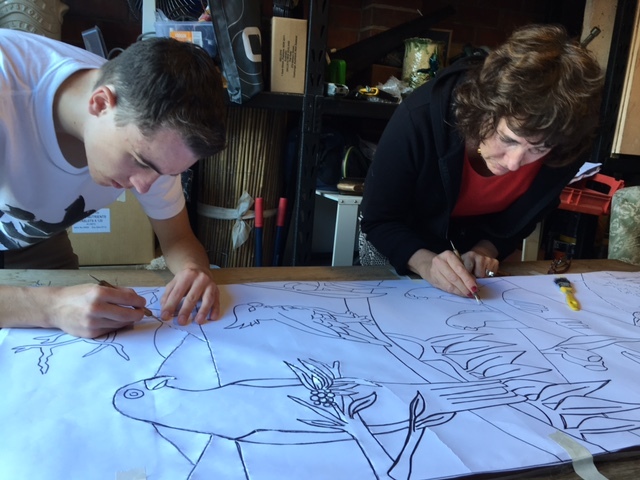 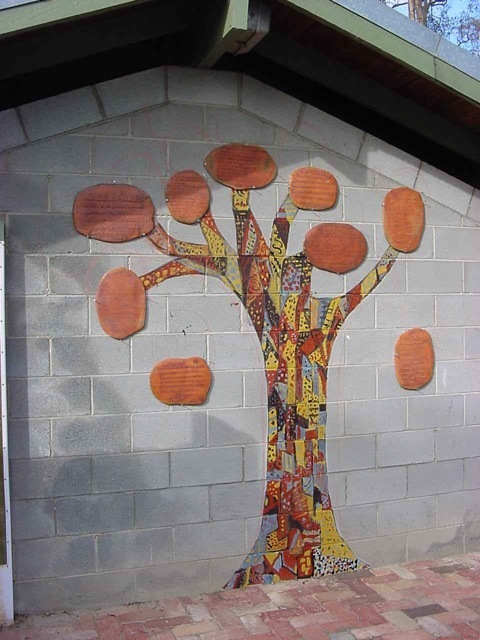 The mural was constructed in close collaboration with Wurundjeri Elders and contains some 900 tiles individually carved by our school community. 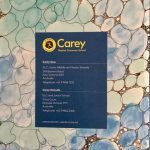 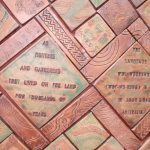 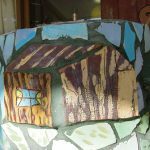 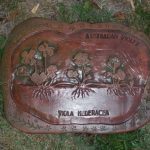 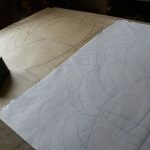 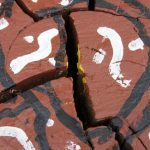 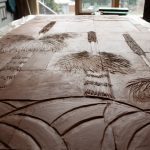 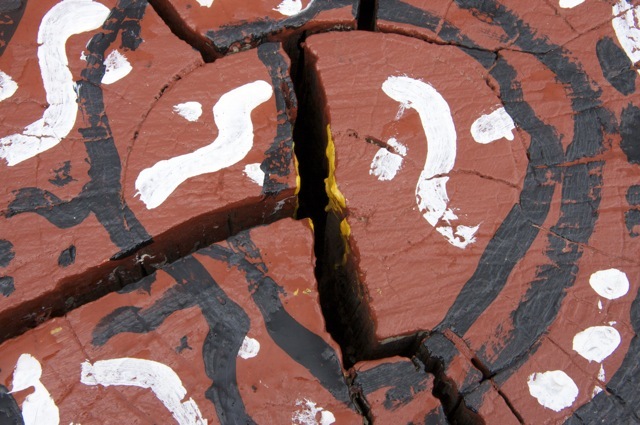 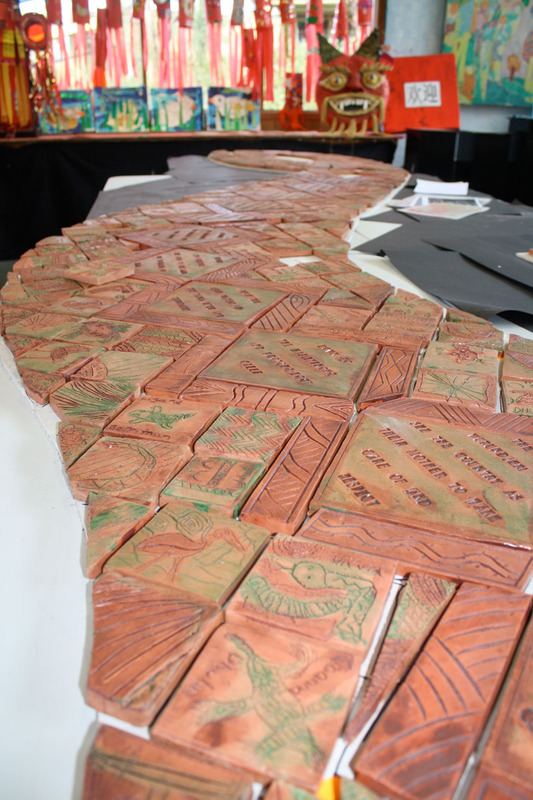 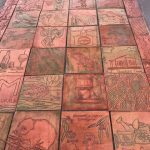 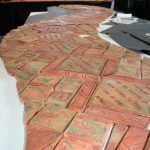 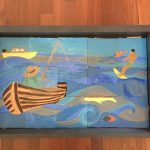 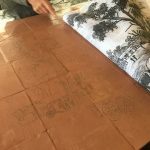 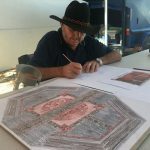 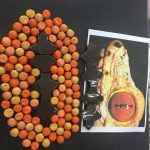 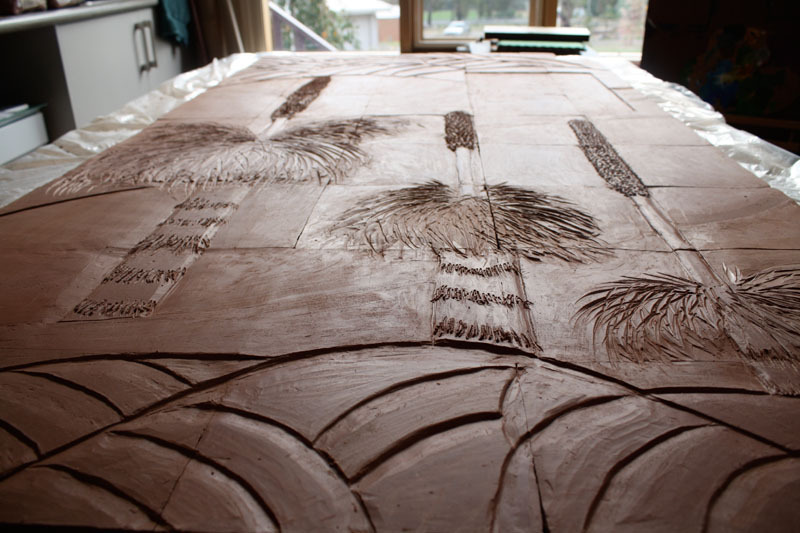 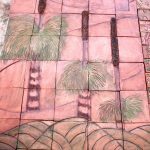 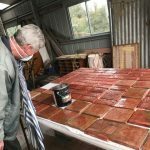 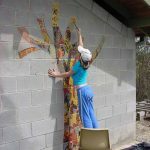 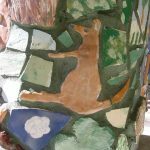 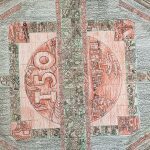 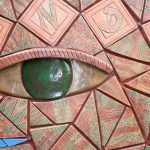 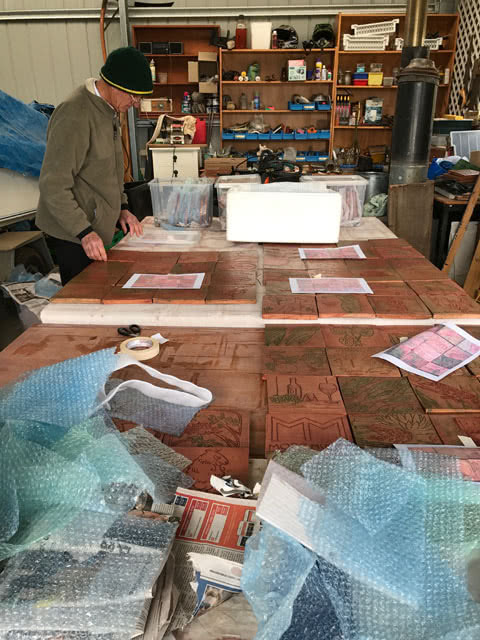 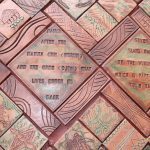 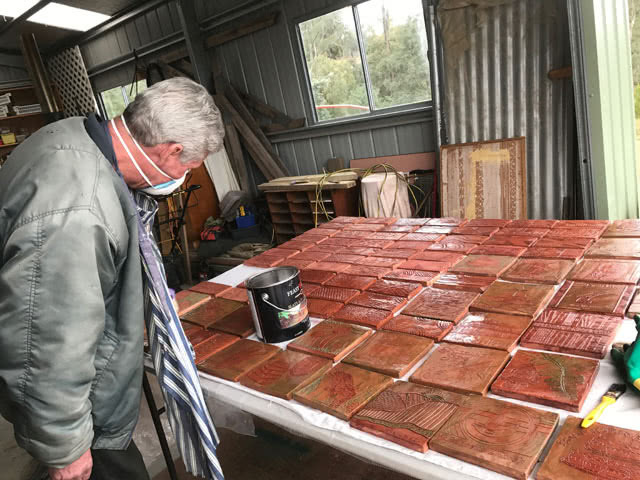 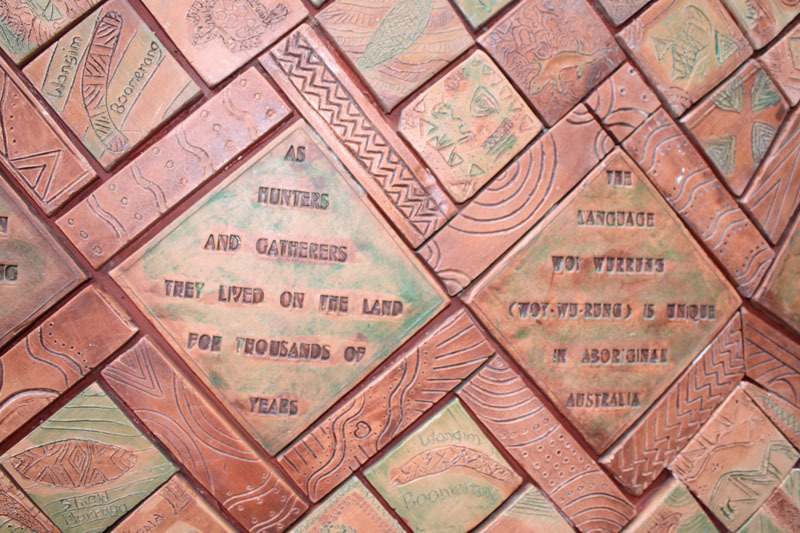 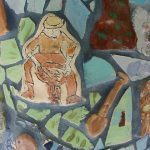 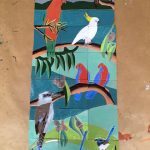 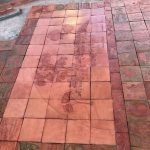 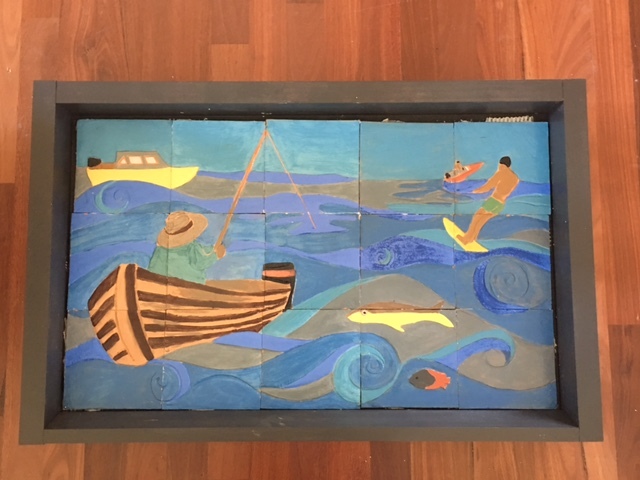 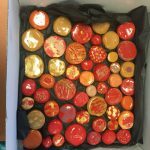 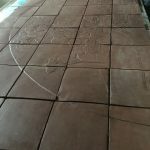 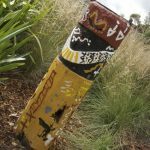 The spine of the work tells of the story and cultural elements, with the outer tiles holding significant emblems and the language of the Wurundjeri. 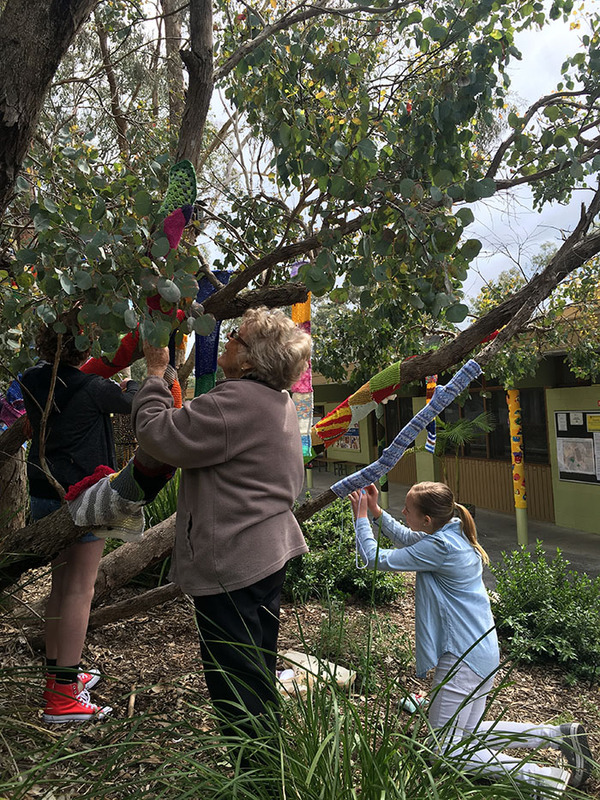 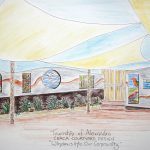 Residents of the nearby retirement village aged from their early sixties through to their mid nineties have worked tirelessly for many months with our eleven to twelve year old students on this collaborative project. 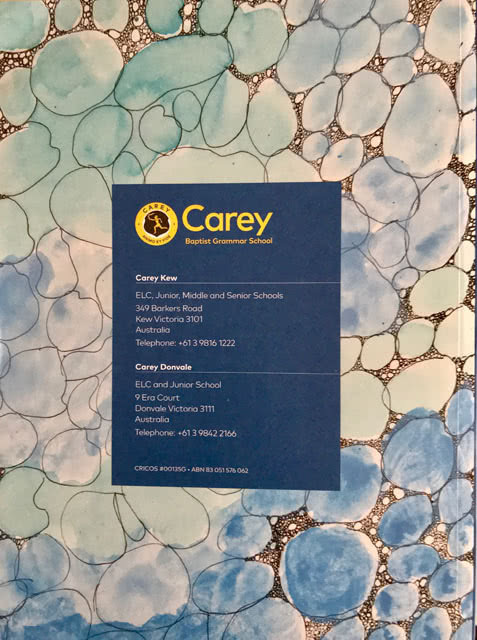 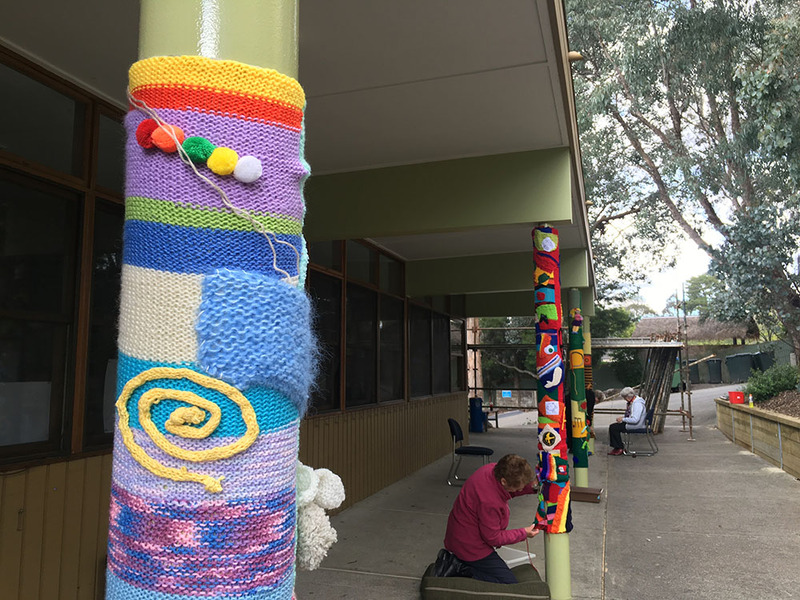 Through the inspiration of these senior citizens our students at Carey Donvale Junior School have replaced technology in their hands for knitting needles and crotchet hooks. 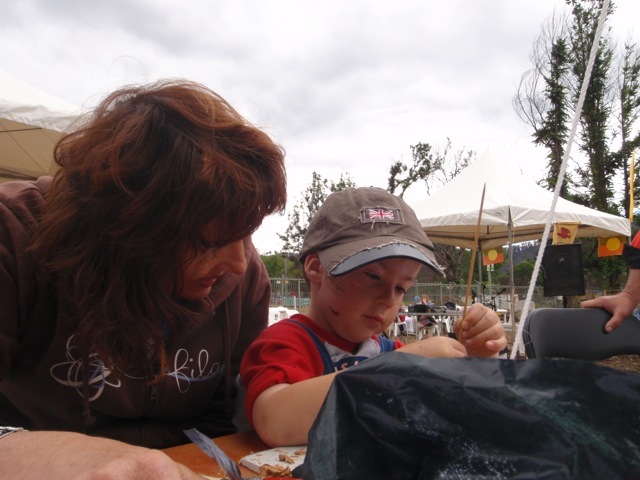 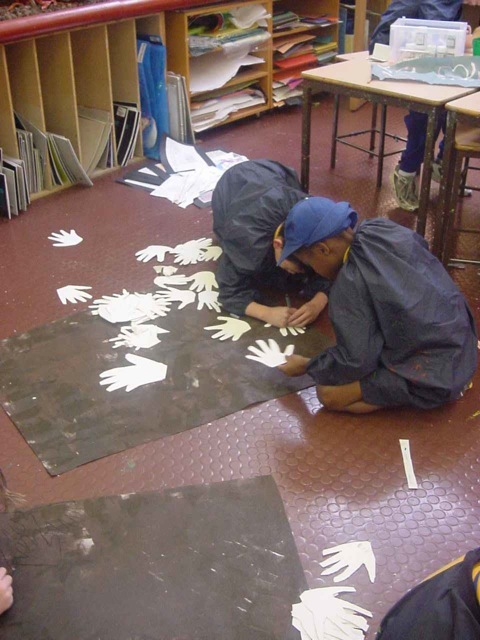 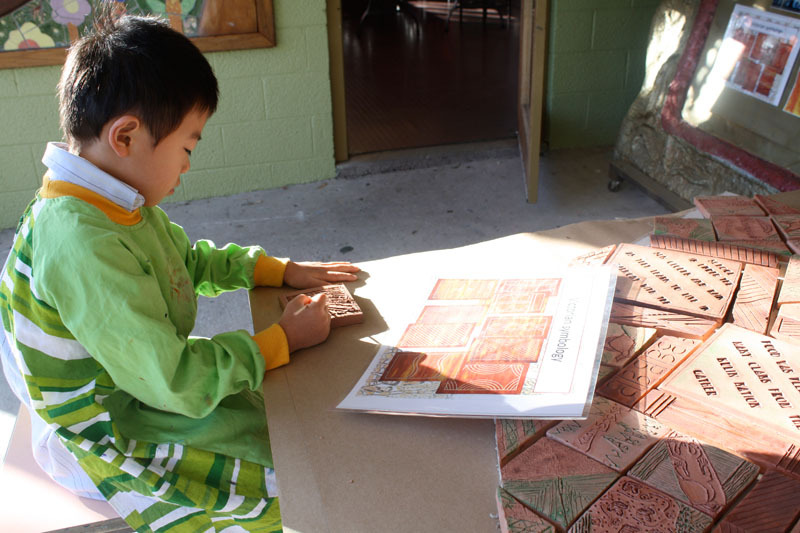 Many children have continued to worked beyond the classroom through their playtime as well as at home. 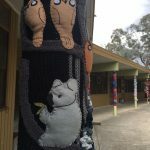 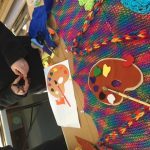 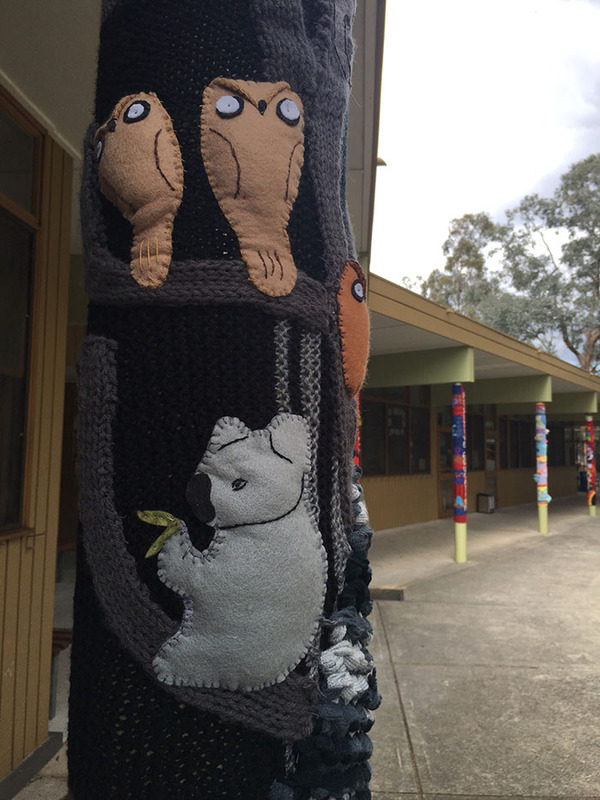 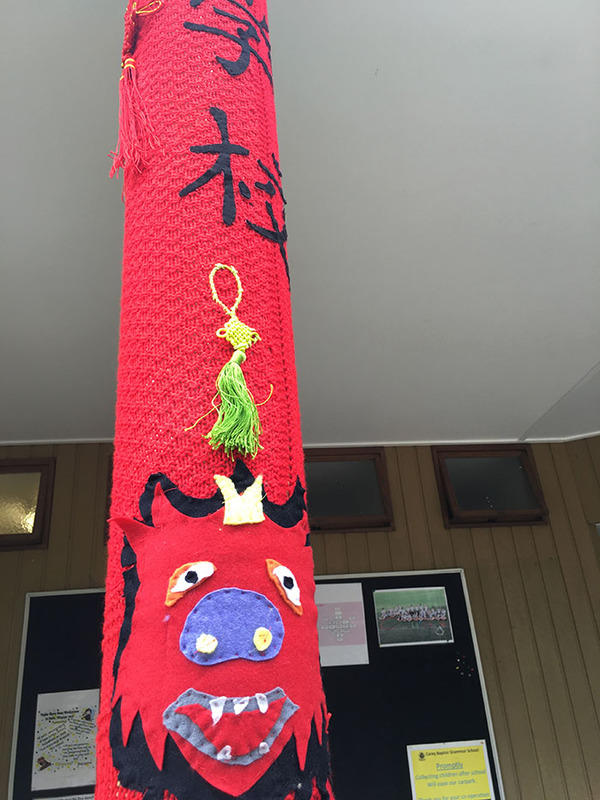 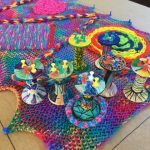 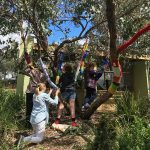 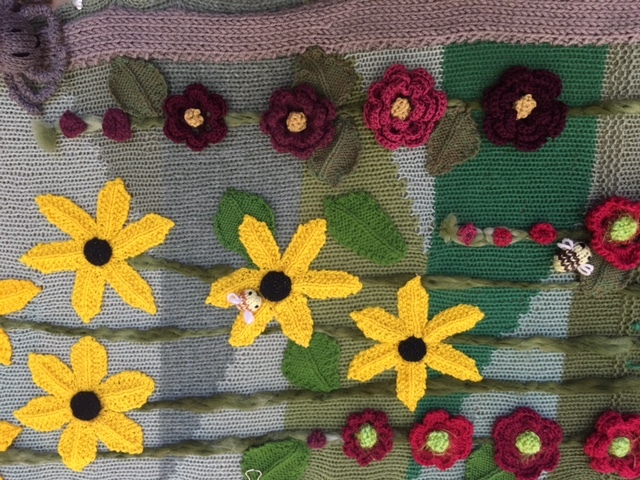 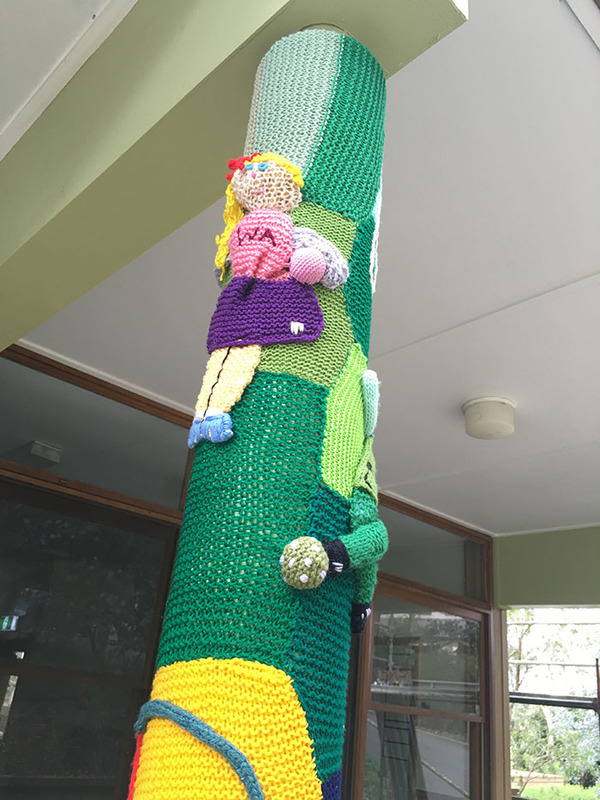 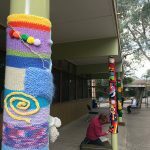 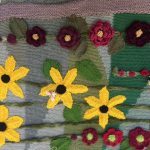 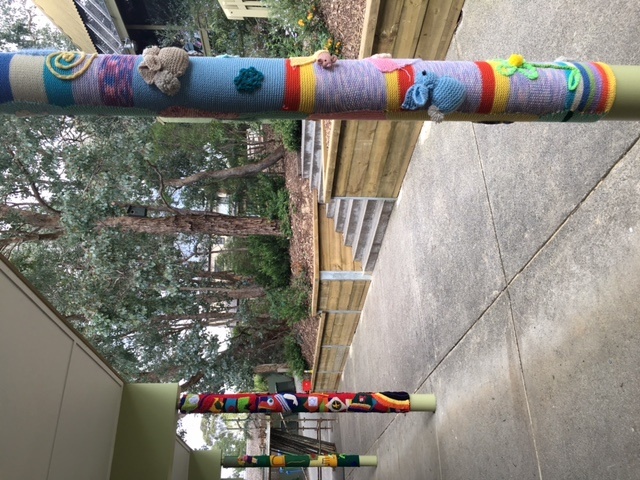 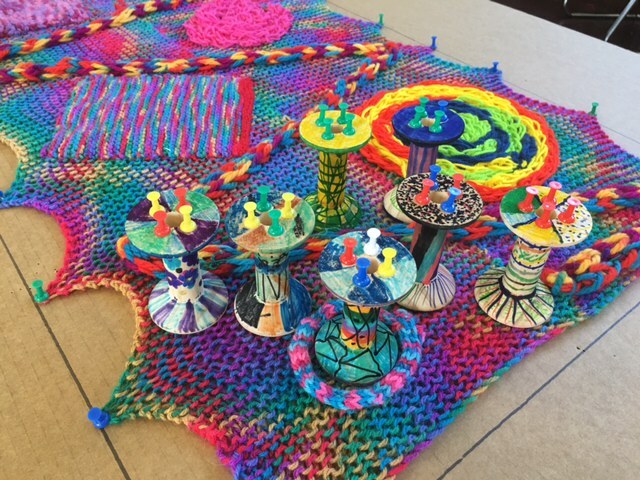 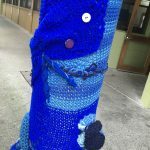 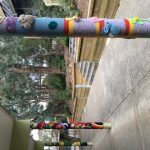 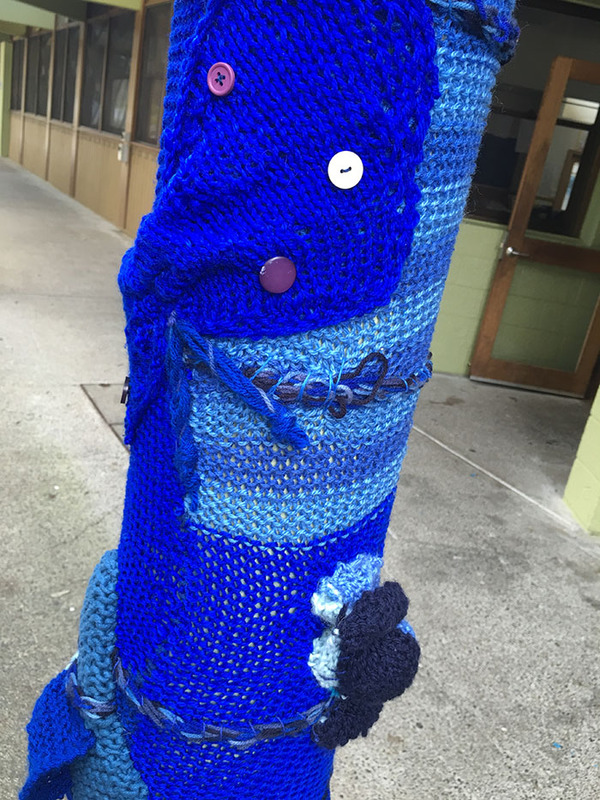 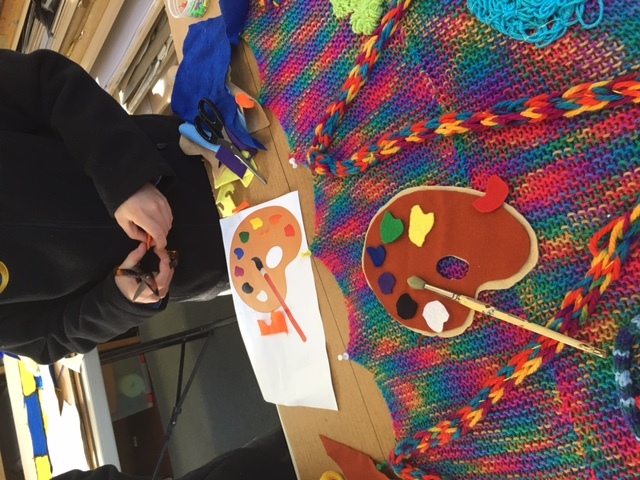 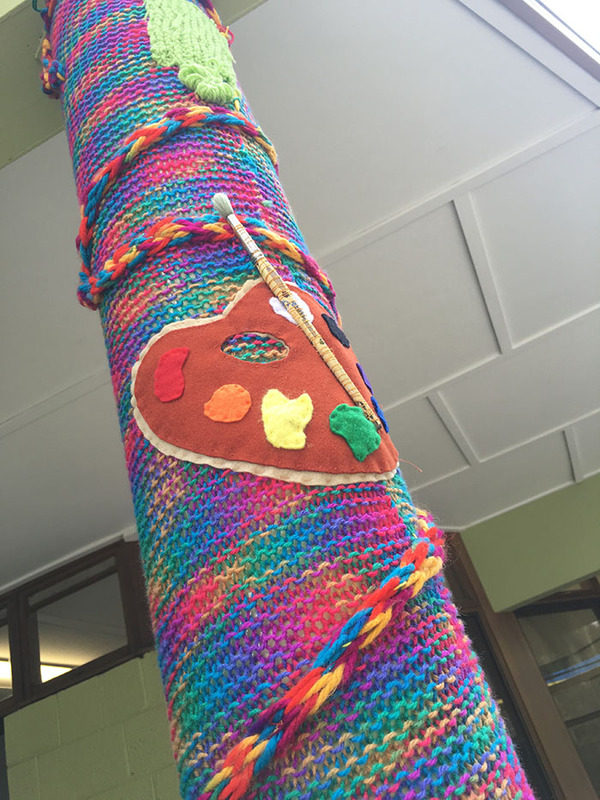 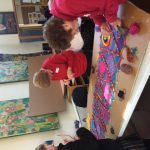 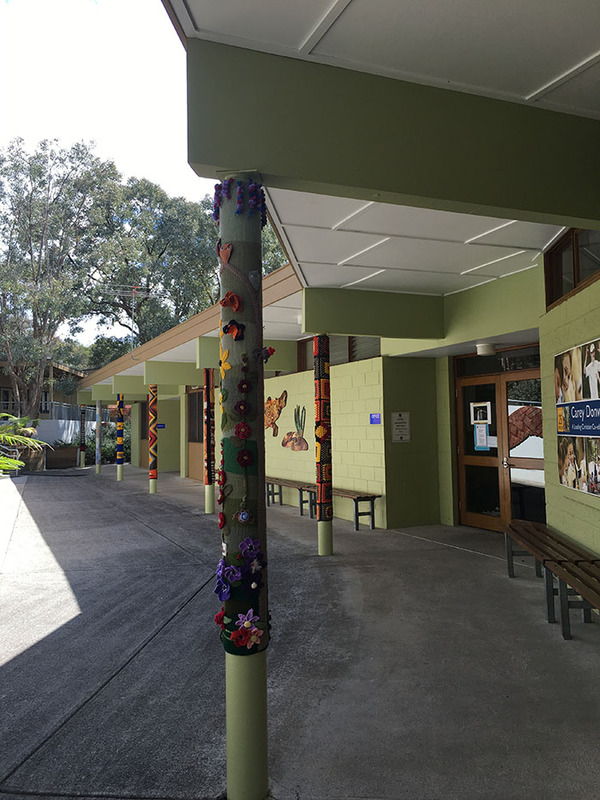 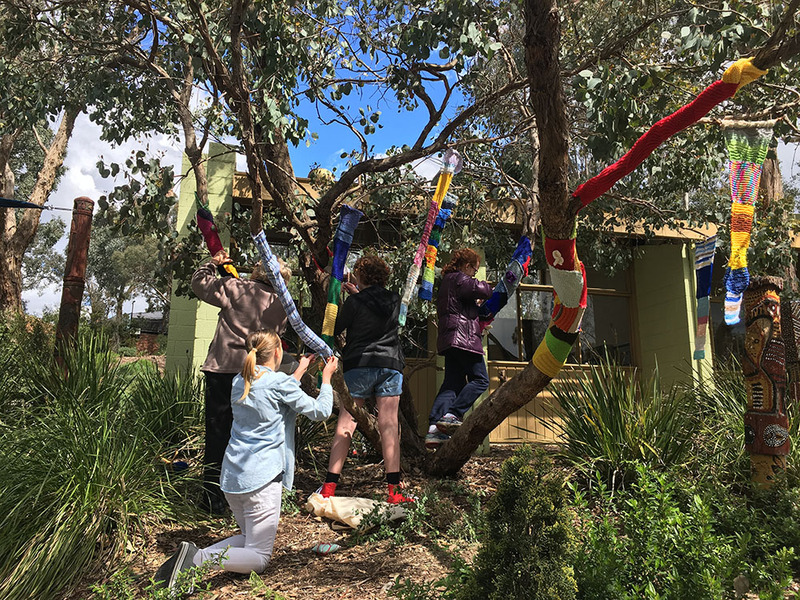 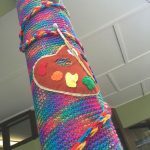 Together they have yarn bombed 28 poles representing all areas of our school curriculum, in their own collaborative designs. 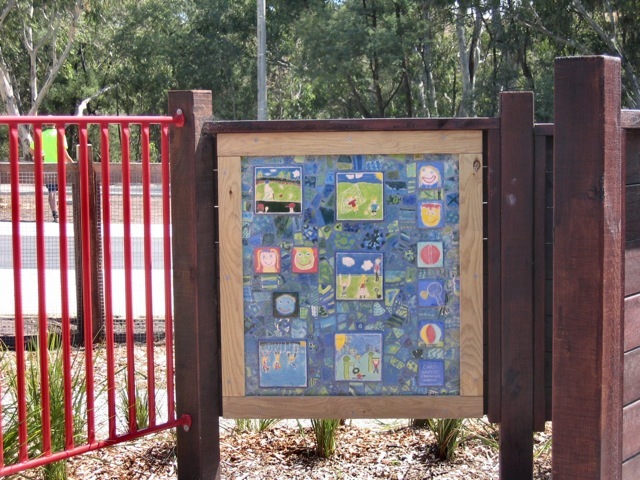 The beautifully hand crafted panels not only depict our school learning values, but are also a testament to what can be achieved when we come together as a community to share our skills. 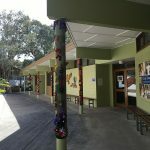 Both the students and the elderly have shared their ideas, skills, learnt from each other, retold life stories and genuinely formed very special bonds that we know will continue. 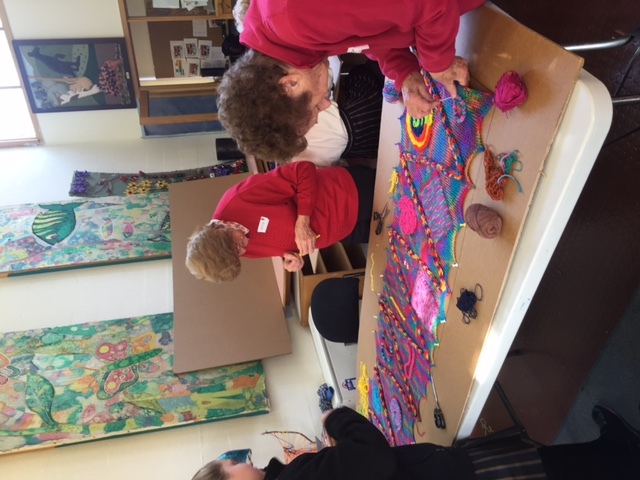 Our senior ladies have gained huge respect form the children they have nurtured, which has been of significant emotional benefit for the ladies whilst also enabling the children to see the elderly in a whole new light. 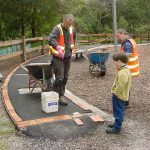 Our families have also been on board with the project with sometimes three generations working alongside each other at any one time. 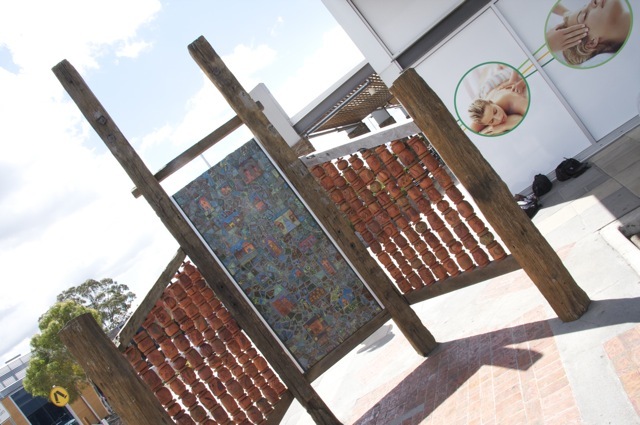 The brief was to create a visually interesting environment involving local residents of the area. 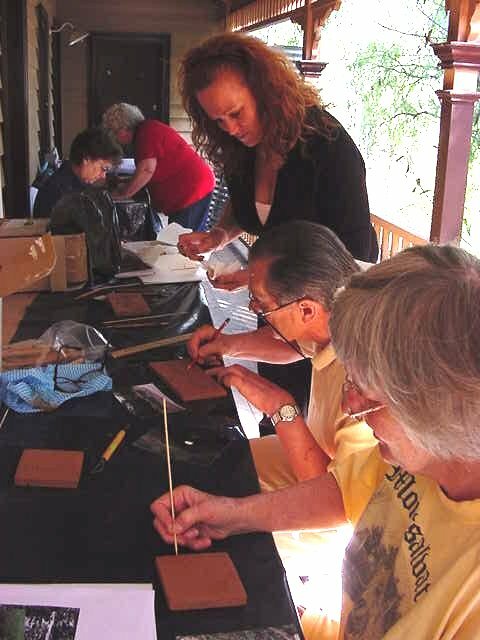 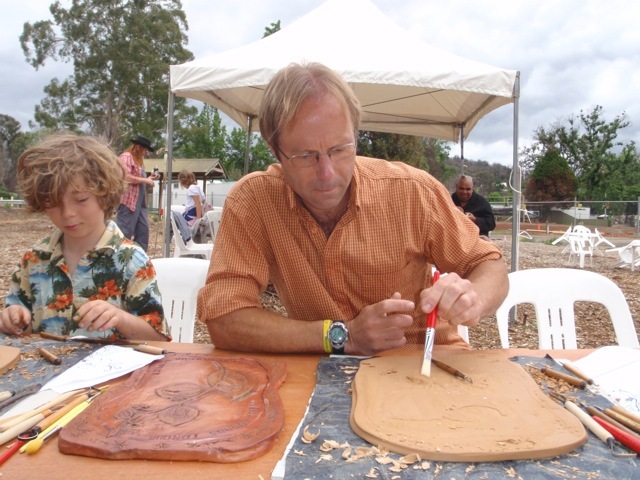 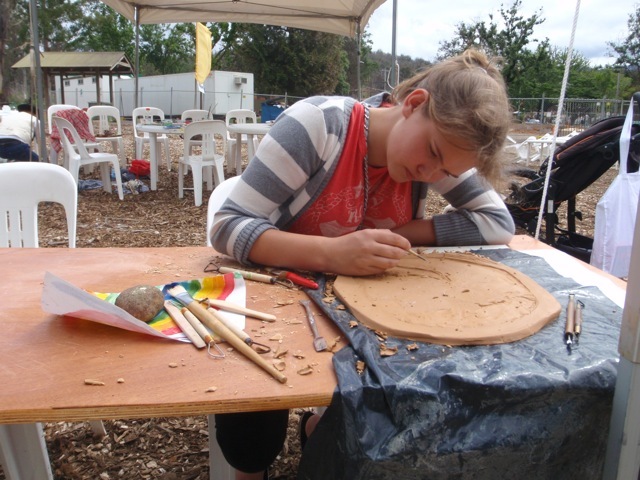 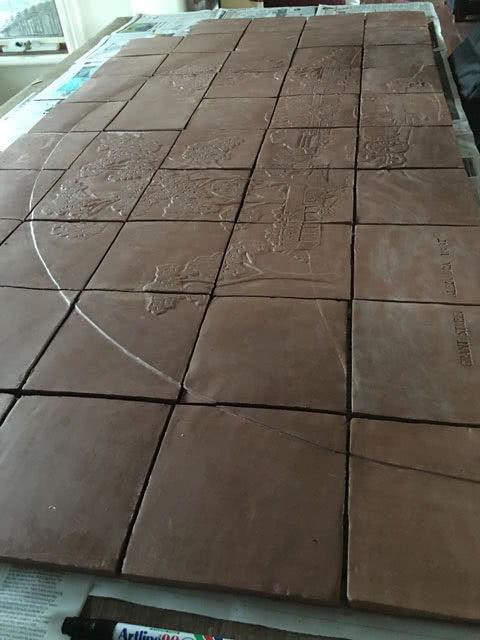 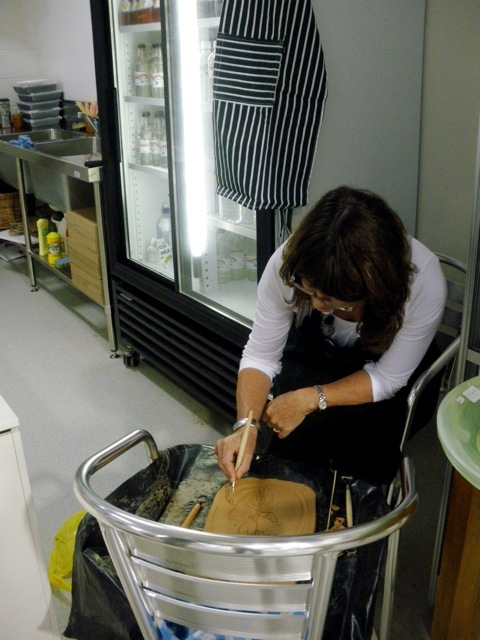 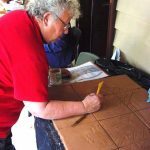 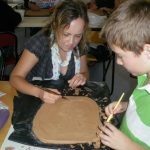 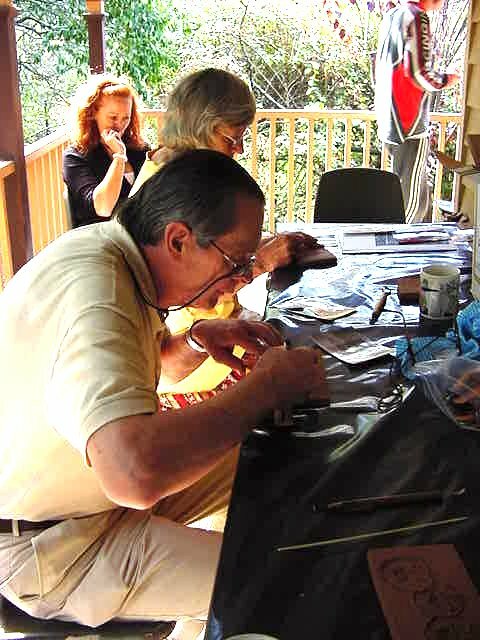 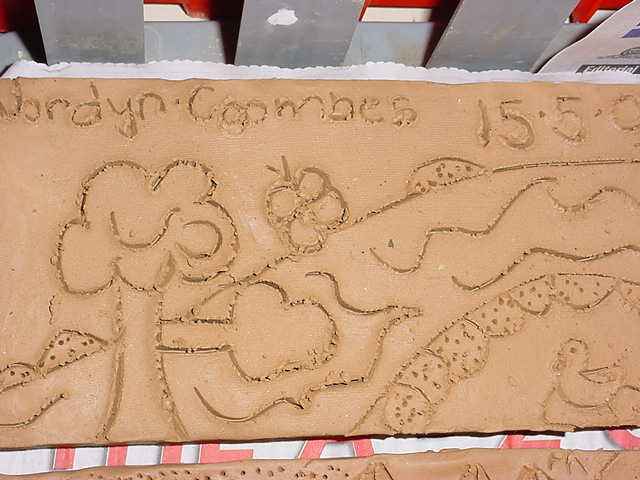 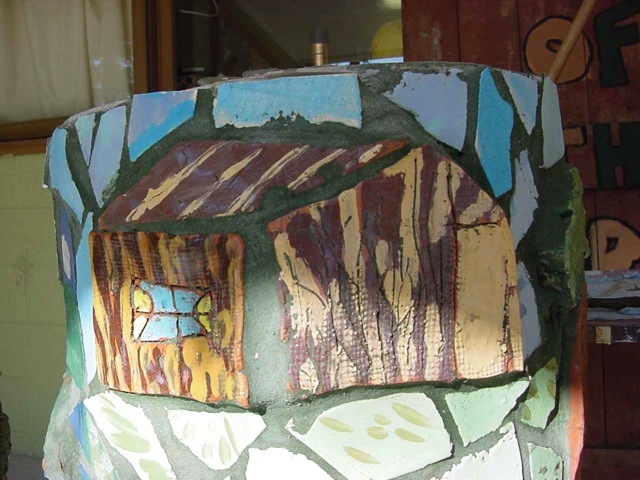 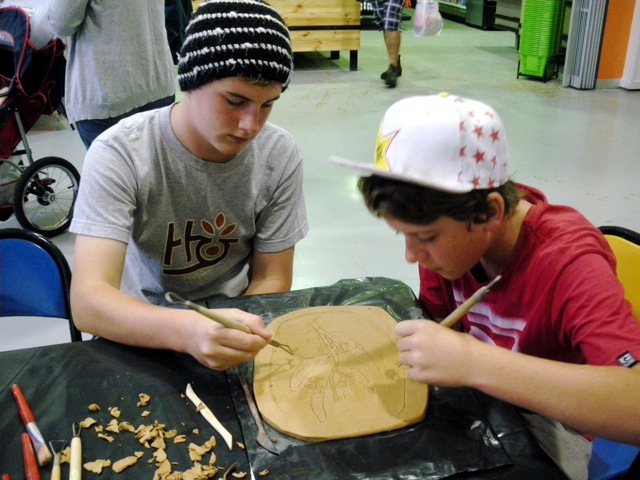 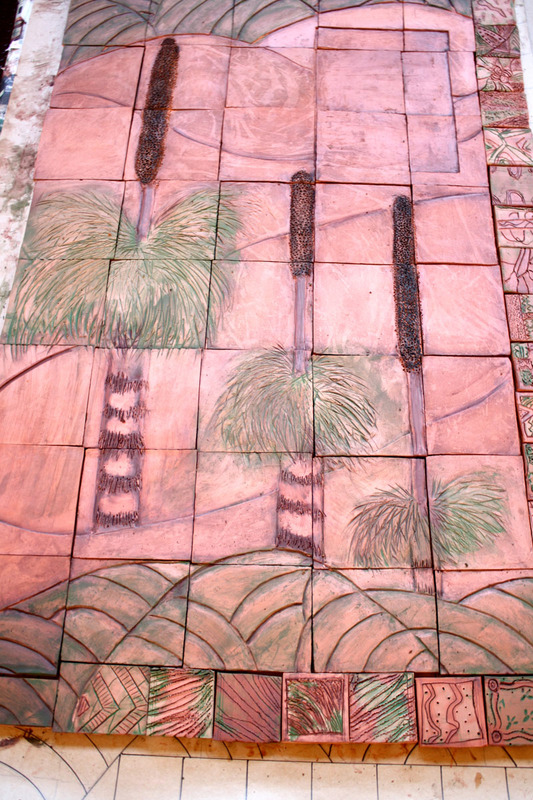 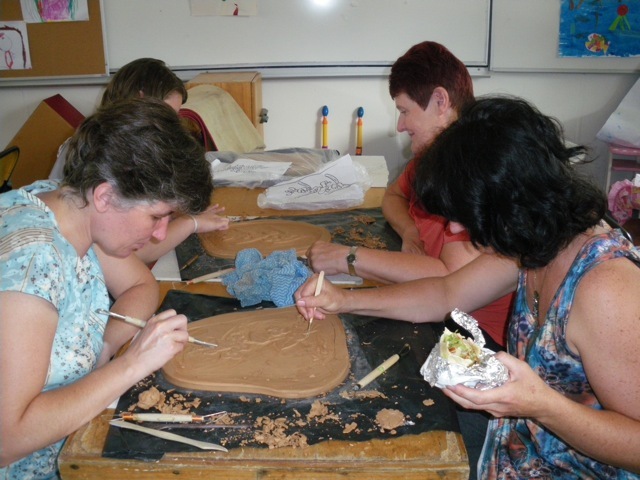 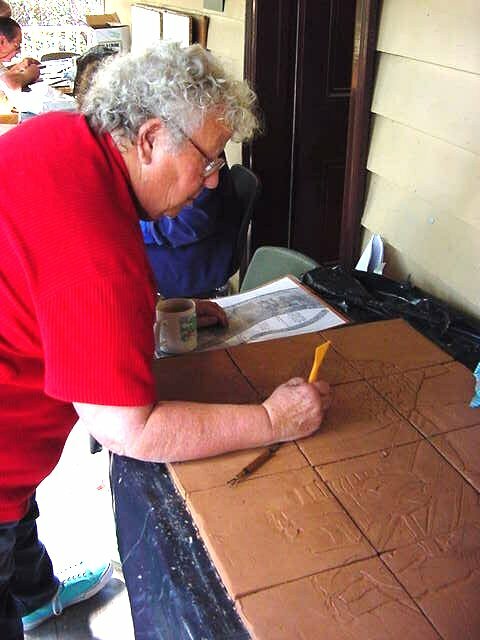 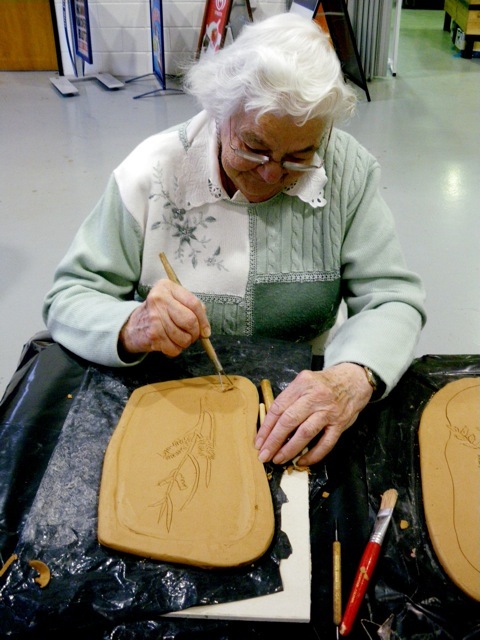 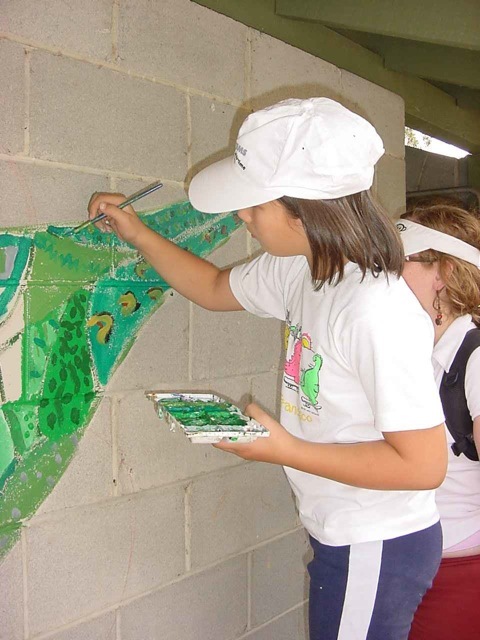 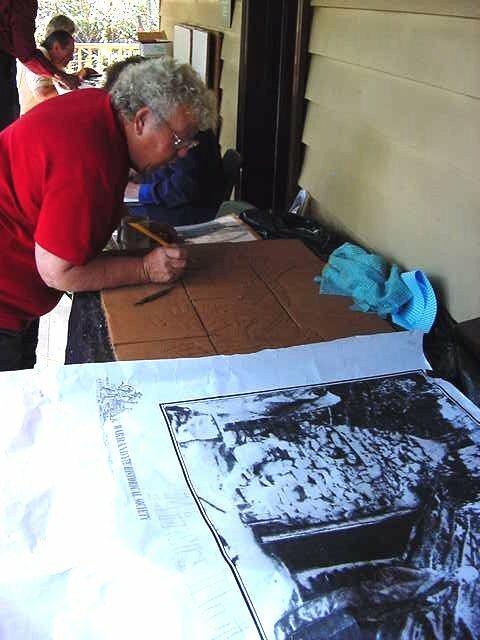 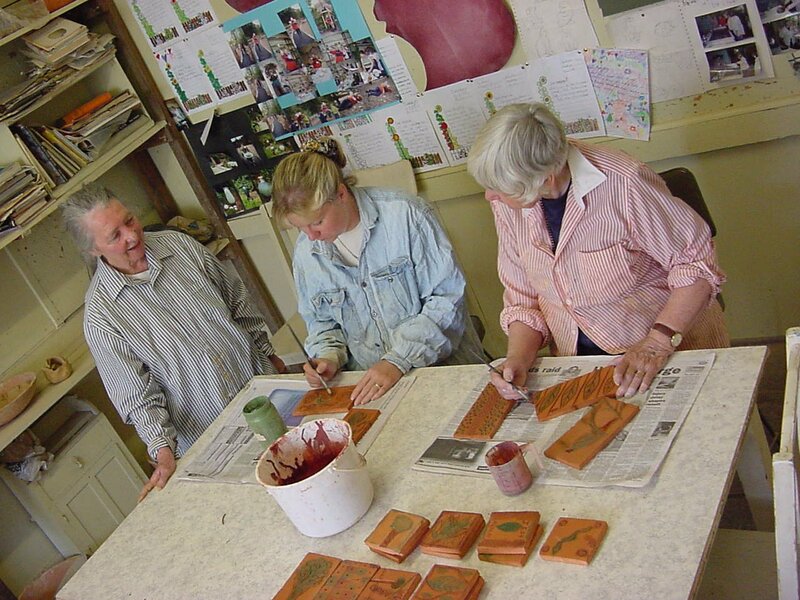 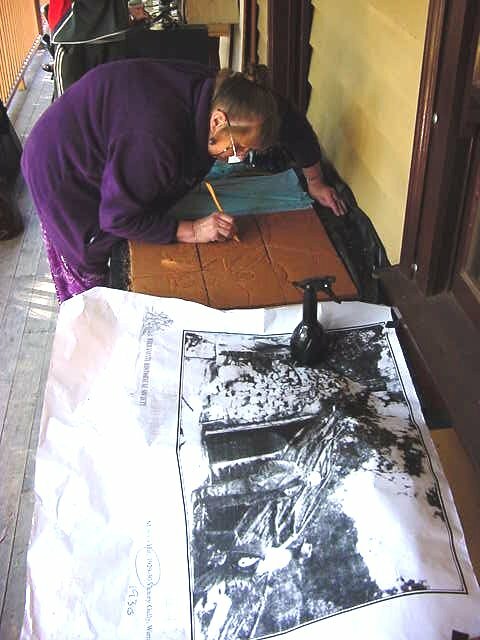 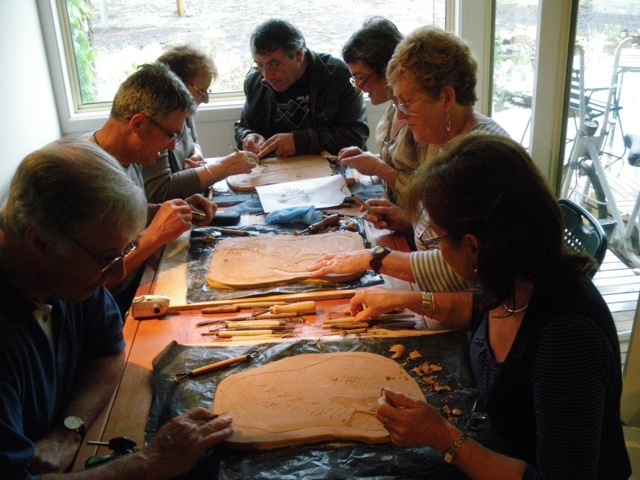 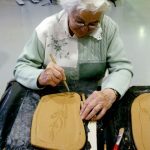 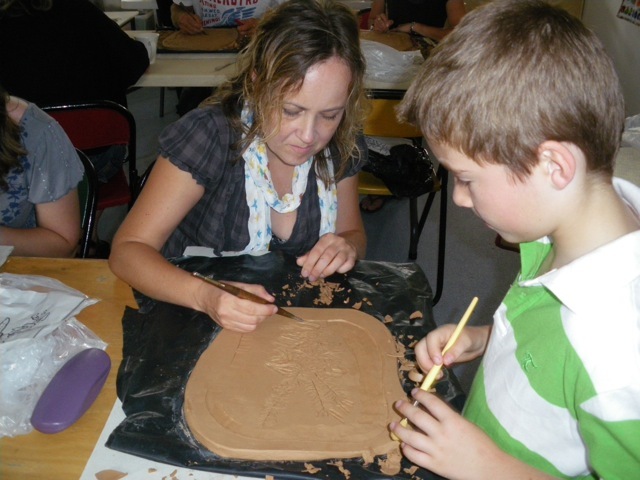 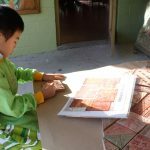 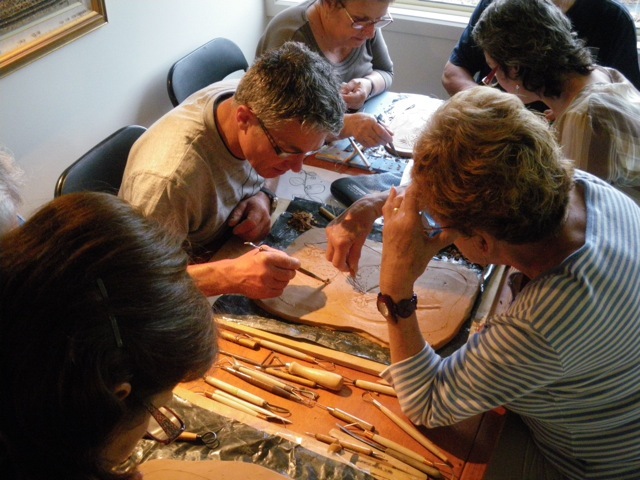 Workshops were held for all of the residents to participate in the project, by carving images into ceramic tiles. 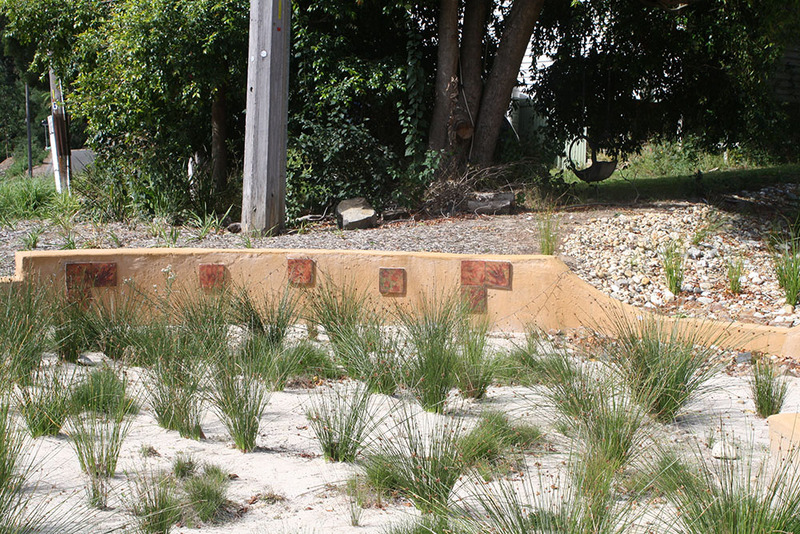 These were fired and oxides overlaid to create an environmental feel to compliment the planting in the area and the rendered frame around the filtration system. 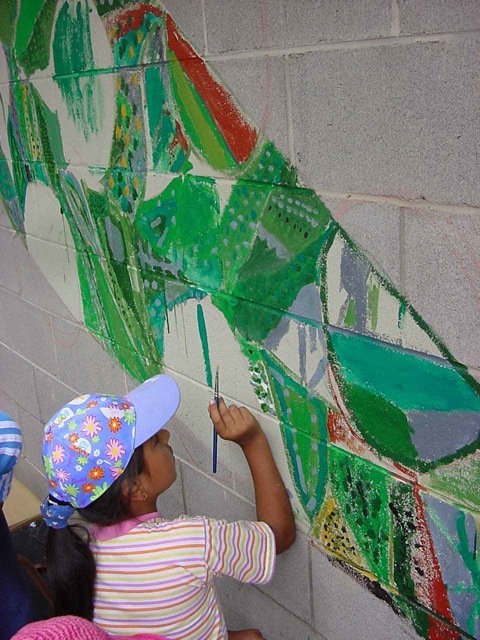 A Mural for Children, - By Children. 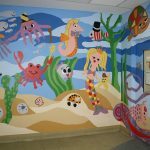 This commission was to create an interesting environment for the emergency department of the hospital. 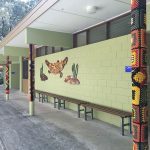 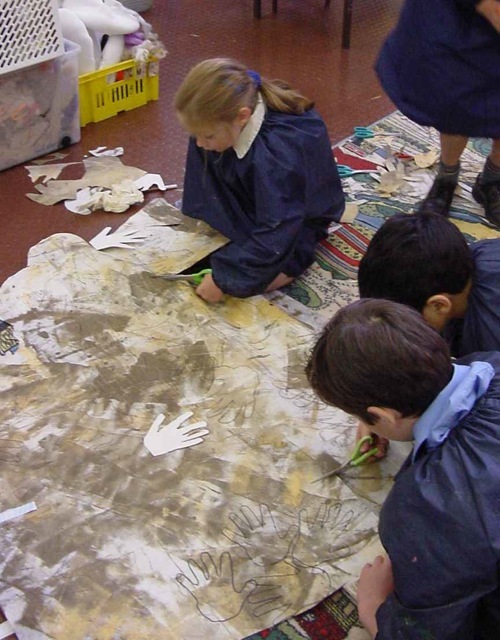 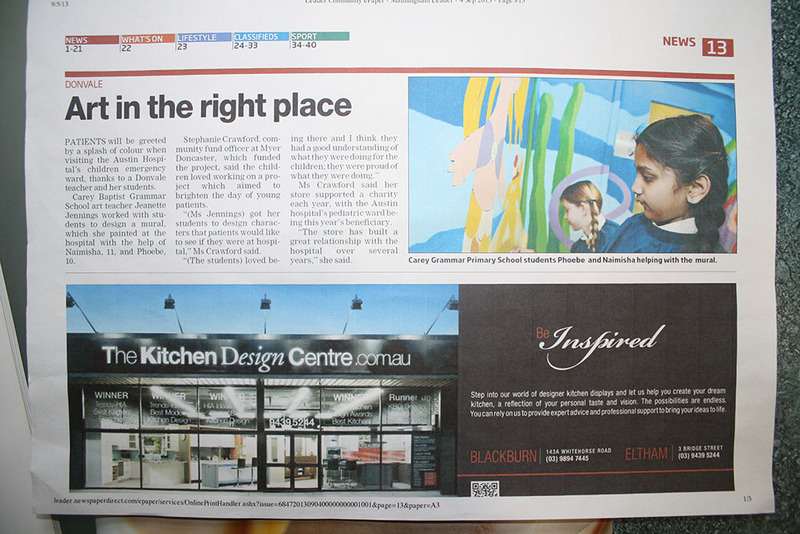 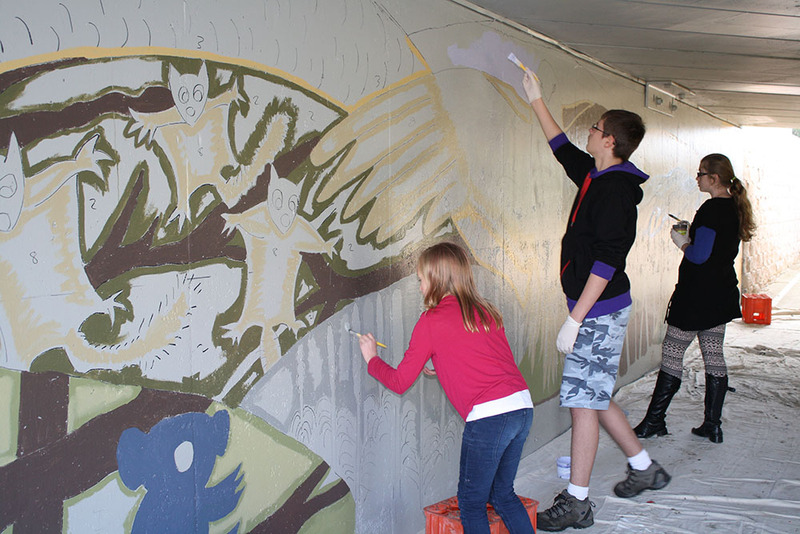 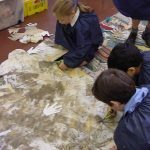 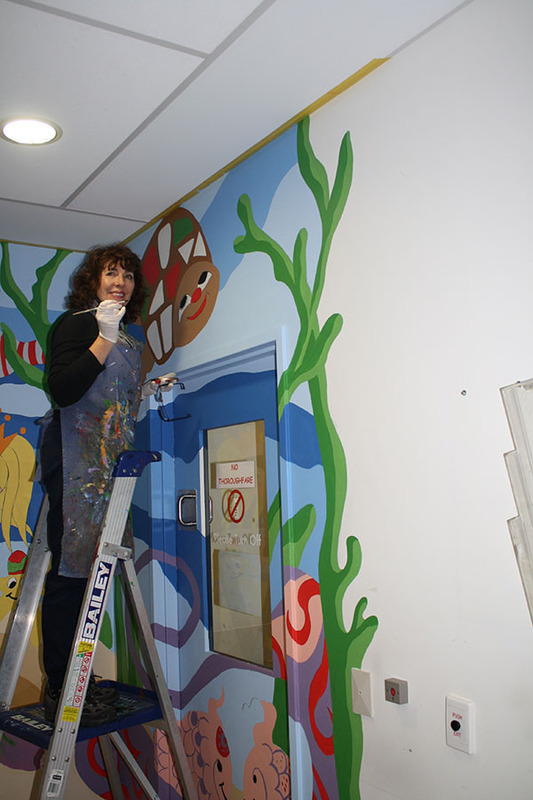 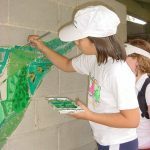 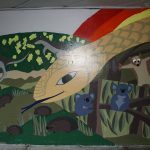 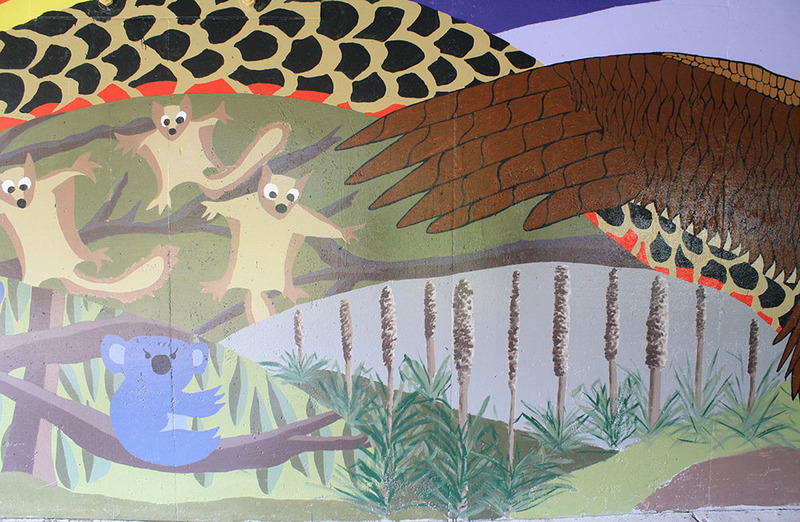 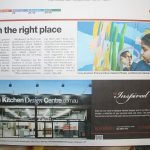 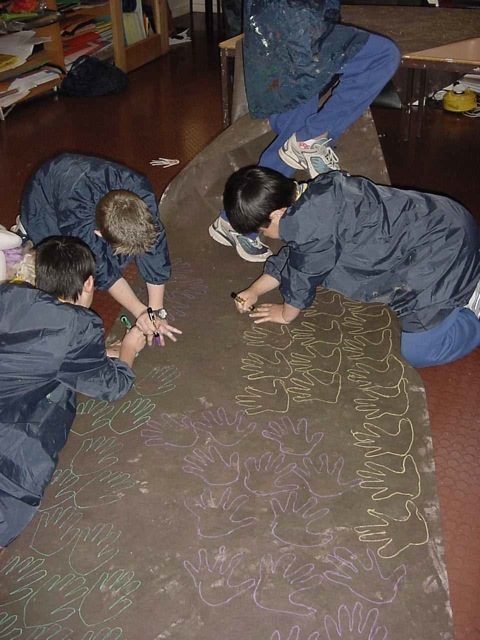 The mural was for a separated area where sick children wait to be seen, and our primary students were given the design brief and created images based on a theme. 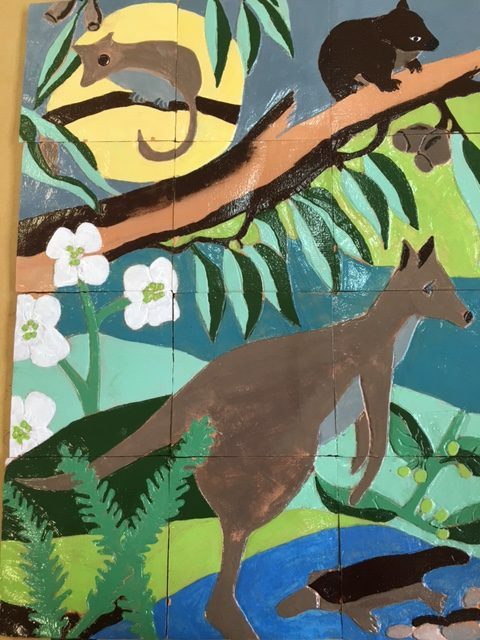 A design based on their drawings was developed and some of our talented young students worked together with myself to transfer the mural onto the wall. 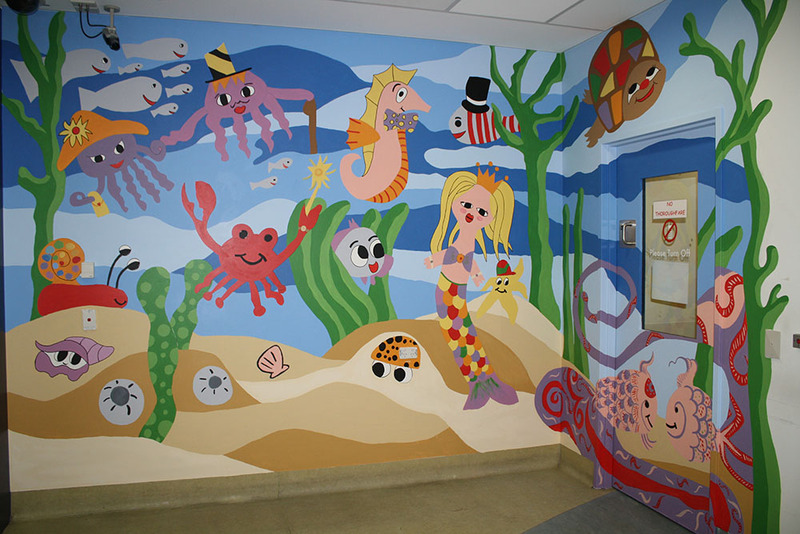 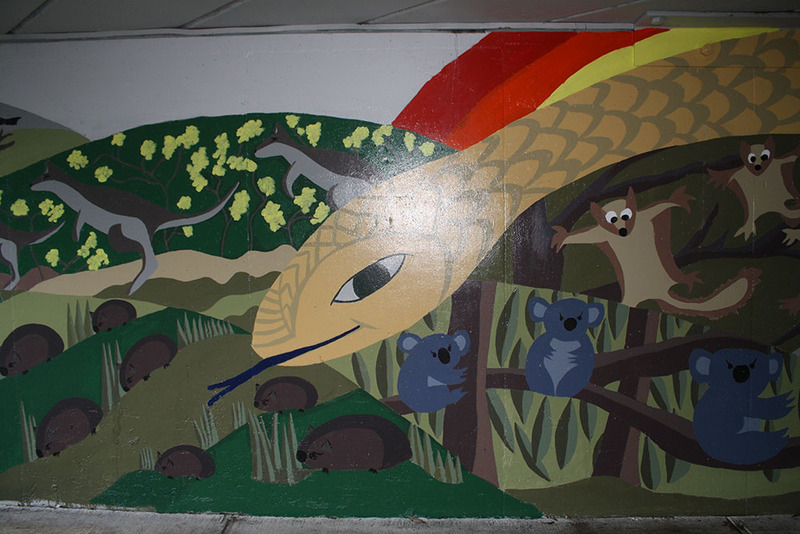 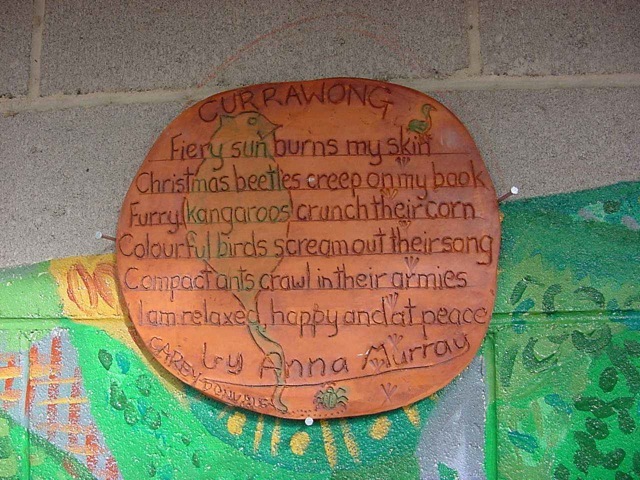 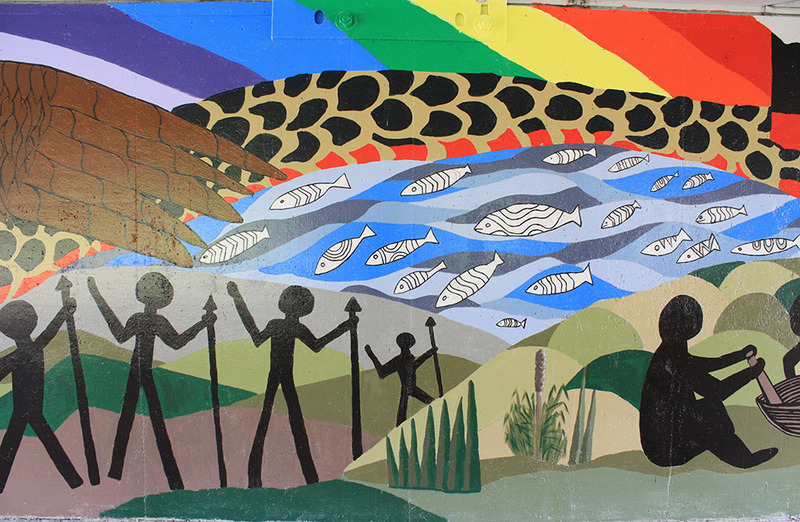 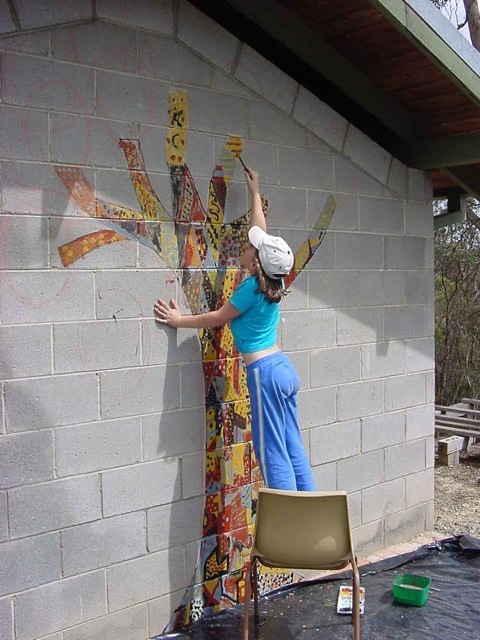 This very colourful Mural has captured the interest of many young children who come in under difficult circumstances. 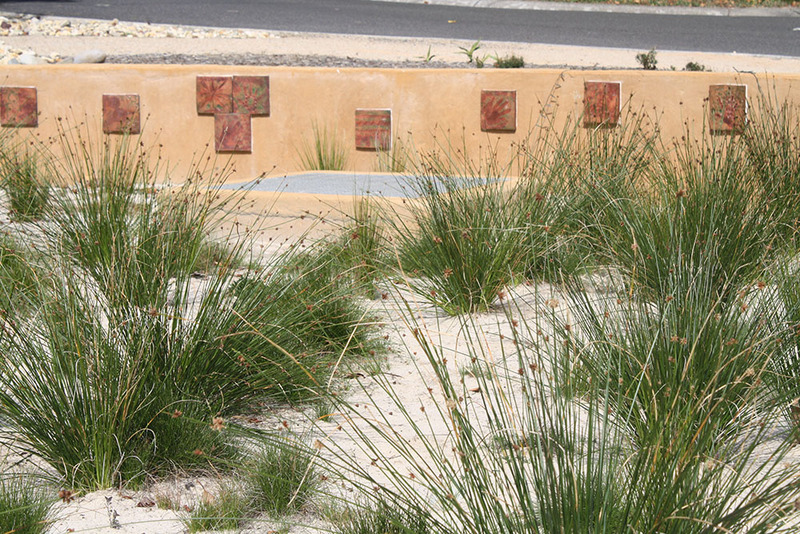 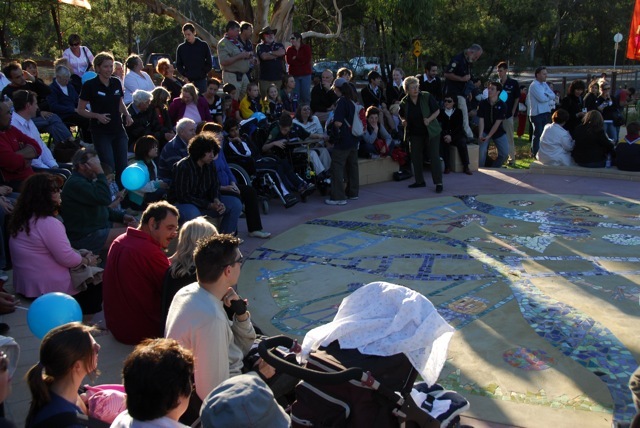 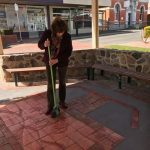 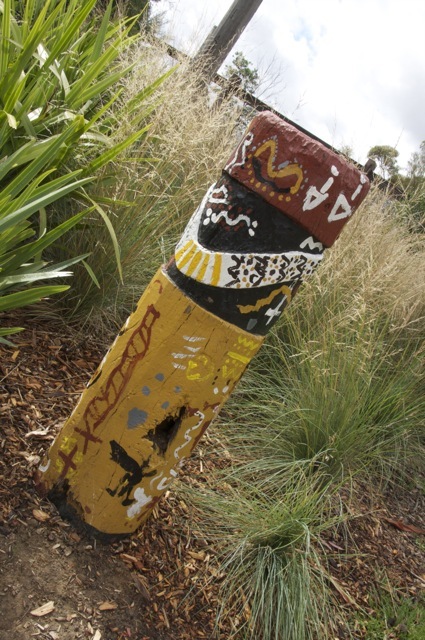 A commission by the City of Knox in Collaboration with the Wurundjeri People. 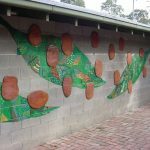 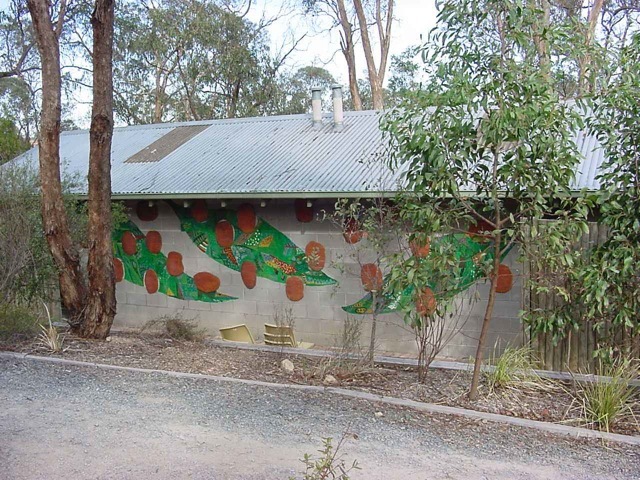 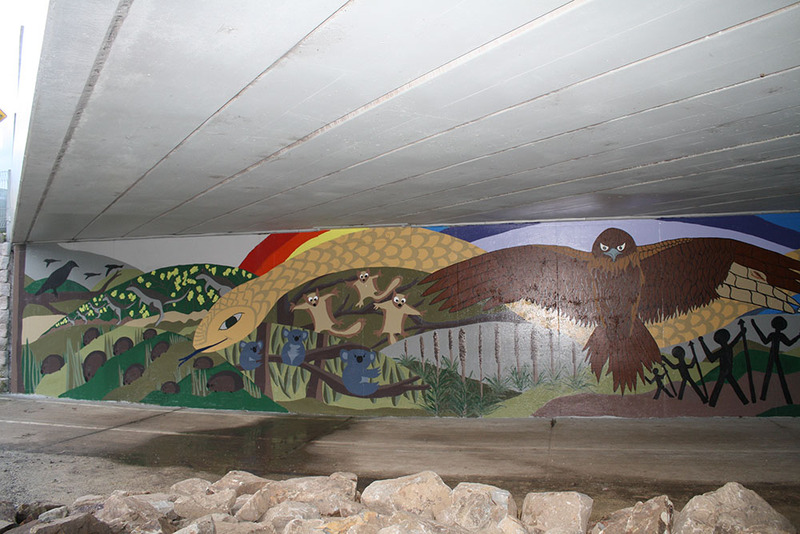 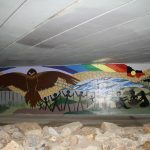 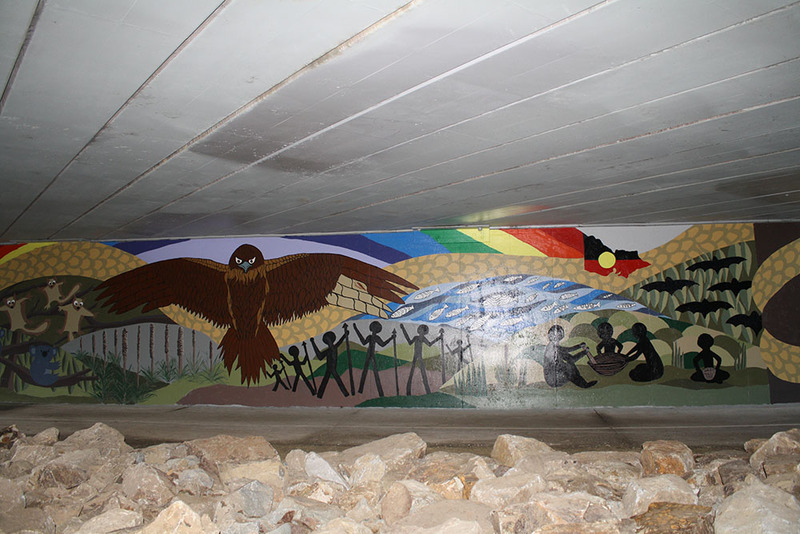 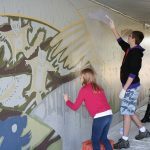 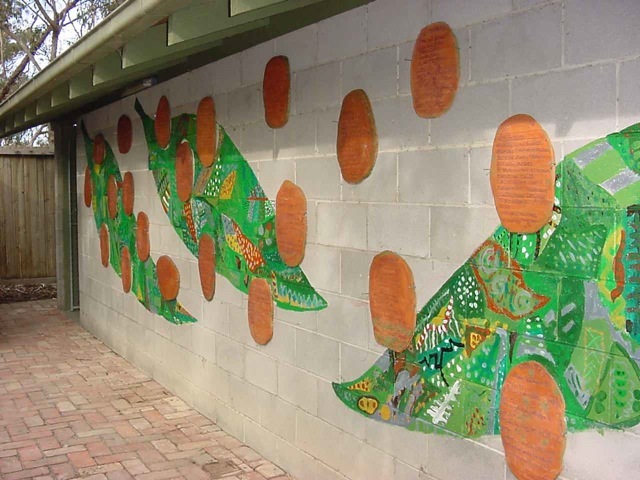 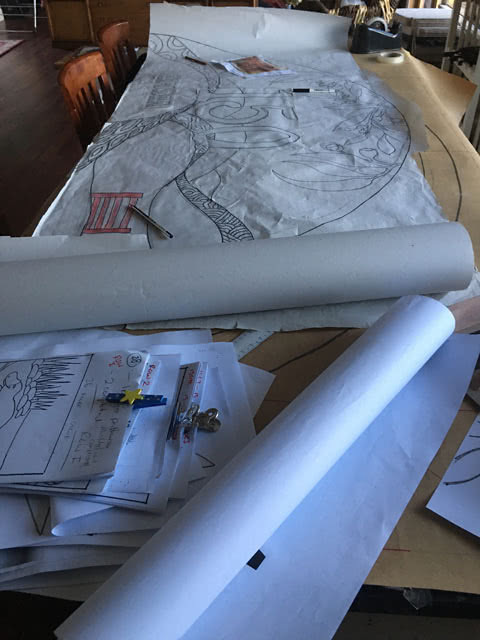 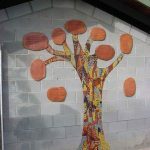 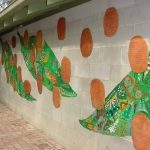 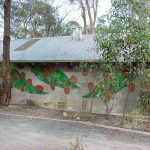 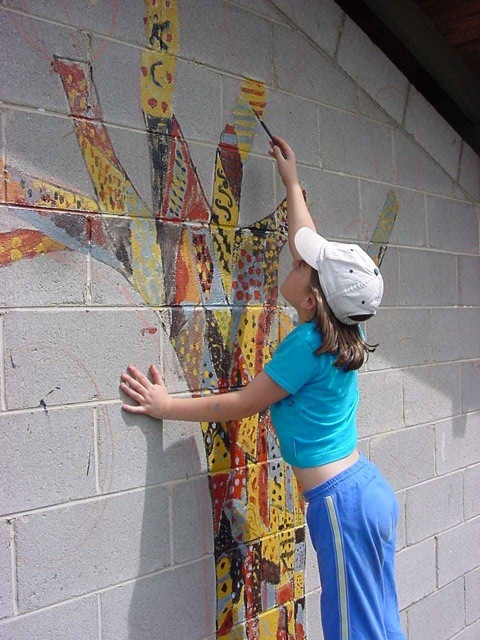 The design brief for this project was to represent the culture of the Wurundjeri People on a 16 metre wall along the cycle track in Knoxfield. 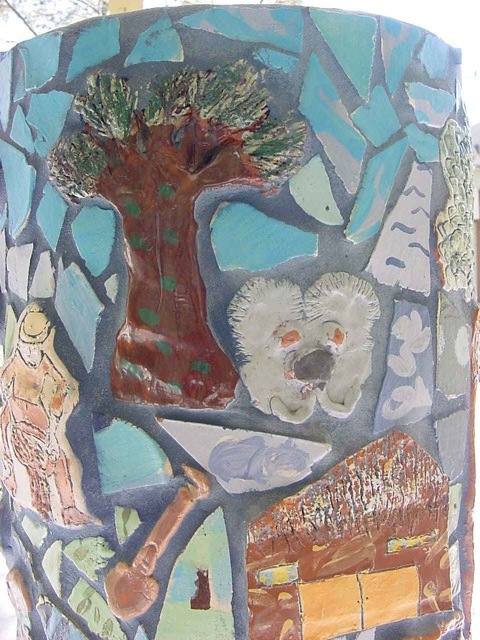 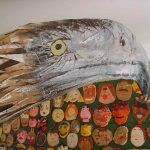 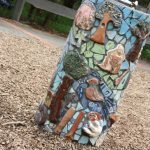 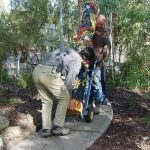 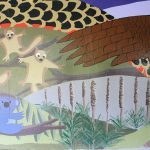 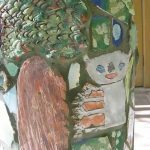 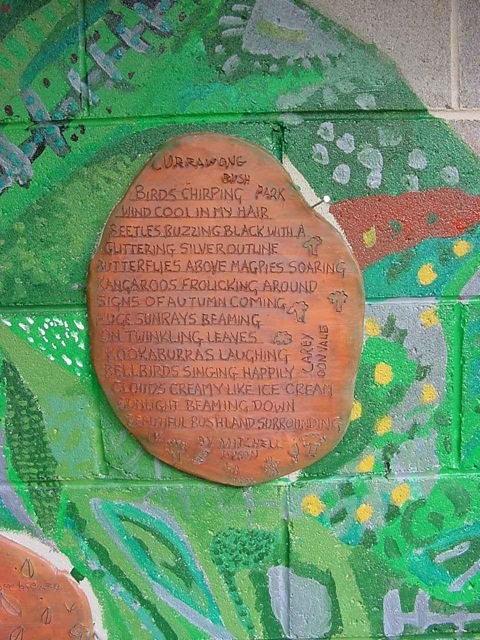 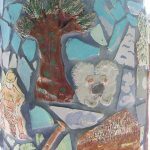 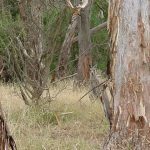 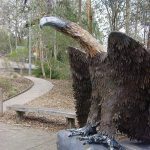 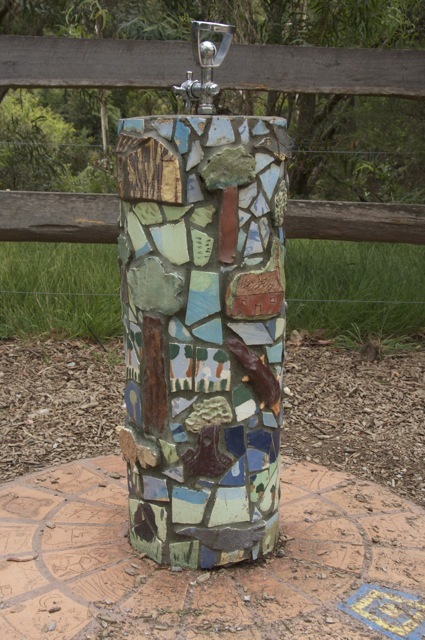 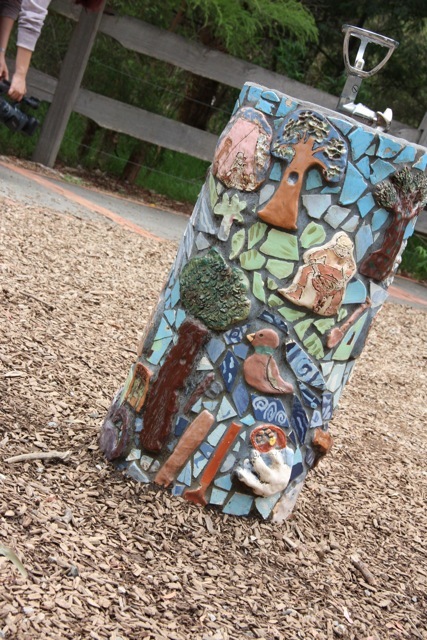 The images celebrate the main totems of the Wurundjeri through Bunjil the Wedge Tailed Eagle and Mindi the Serpent, surrounded by the lifestyle and flora and fauna that are very much a part of the Wurundjeri landscape. 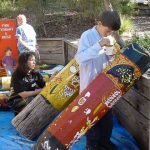 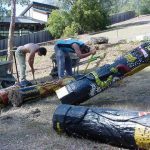 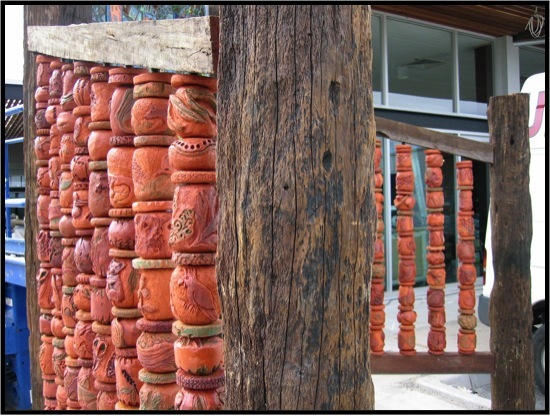 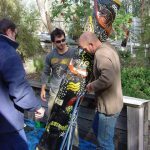 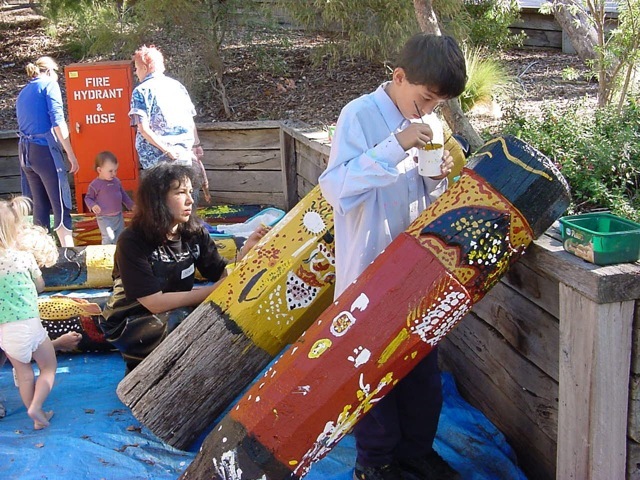 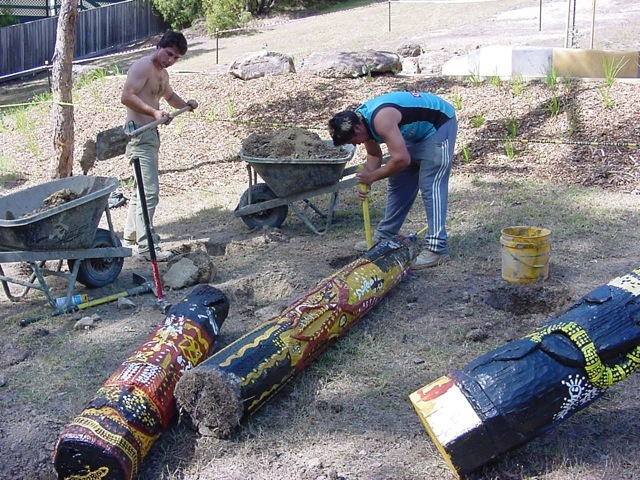 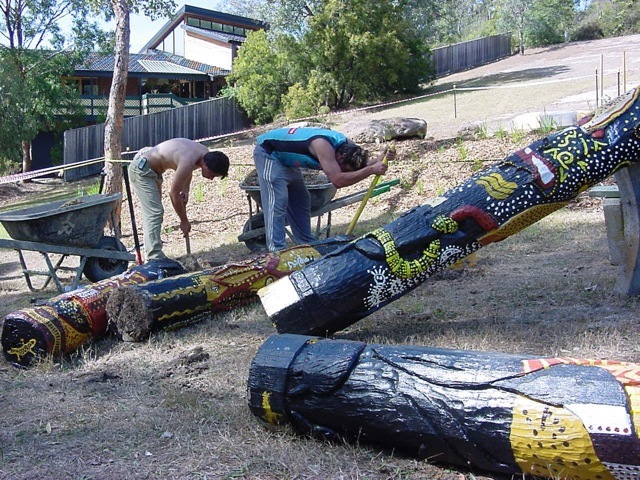 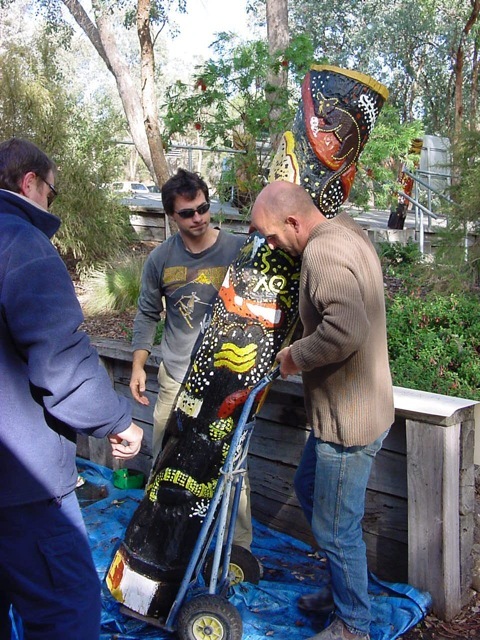 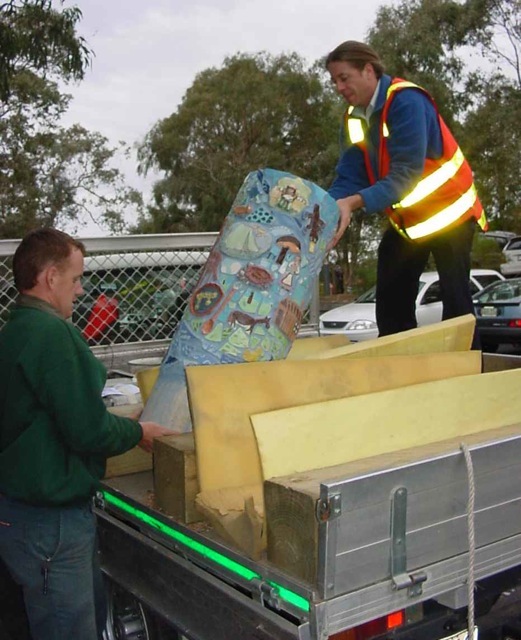 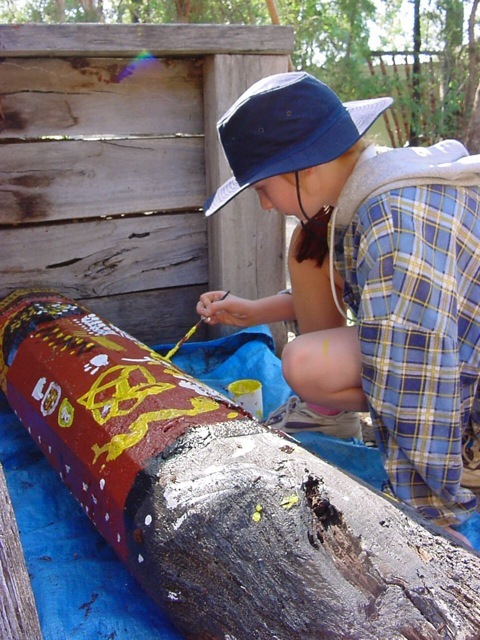 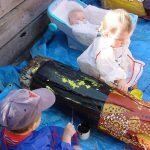 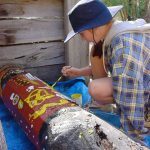 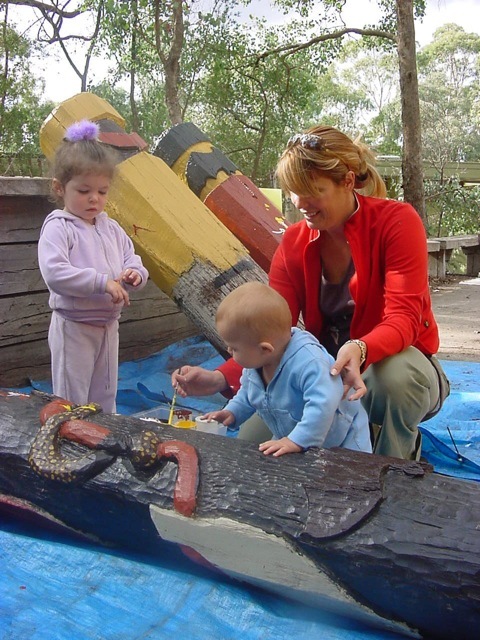 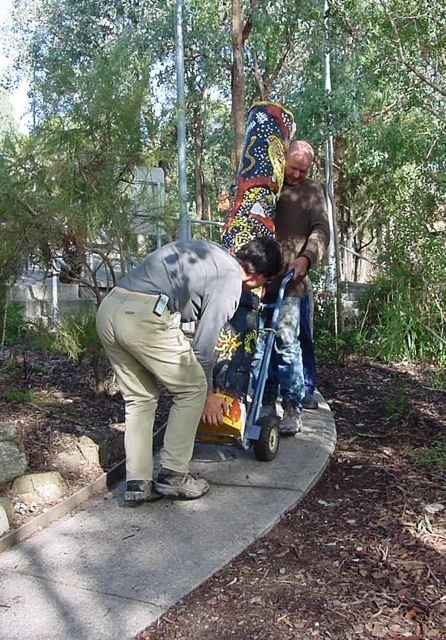 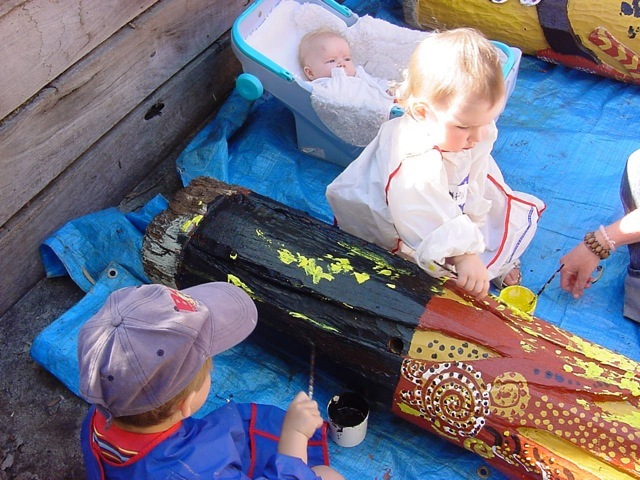 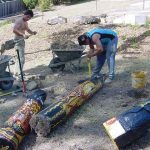 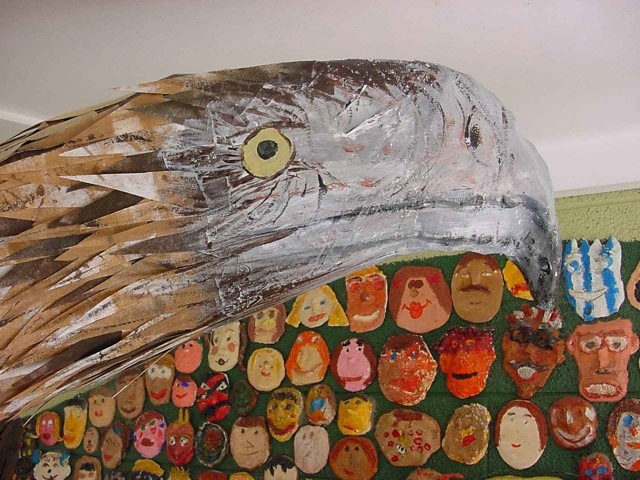 The main totems were completed by Wurundjeri people to ensure authentication of the work. 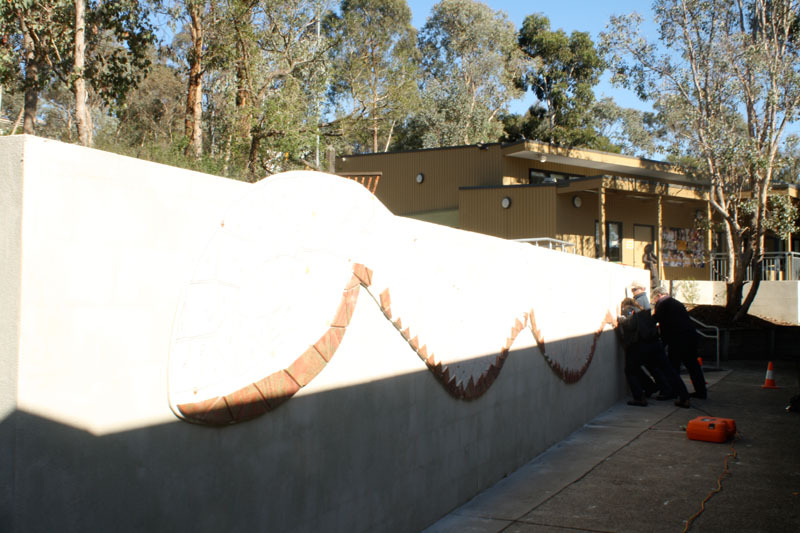 This design takes into account the history of the beautiful and historic Court House building and leads the visitor along the side pathway into a more contemporary space. 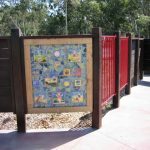 To the left side of the pathway a garden landscape is framed by arches set into a timber screen that provides privacy and intimacy in the covered space. 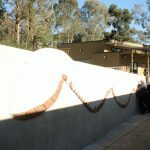 These arches replicate the archways of the building, carrying the historical context through into the courtyard and create symbolic references with Arches representing a gateway or passageway to another place, a period of transition that can signify change and something to follow. 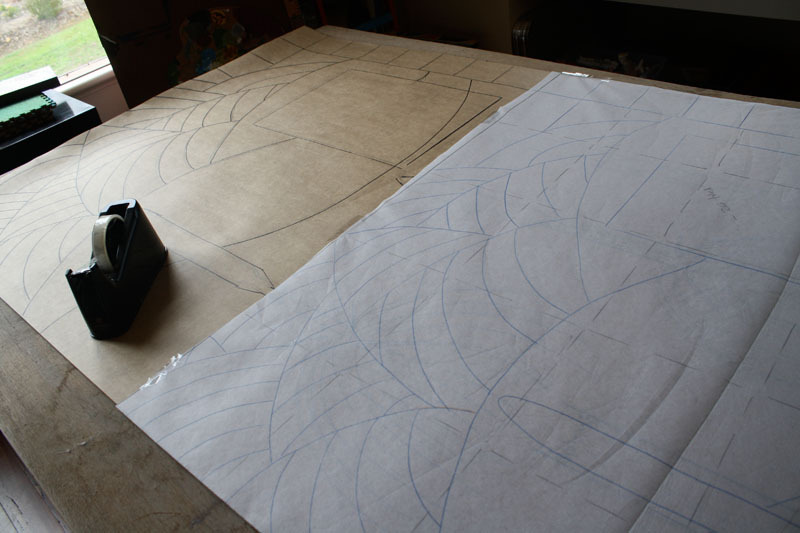 Ahead of the viewer is a large circle also set into a screened frame with a view to the practical space beyond. 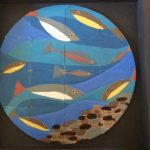 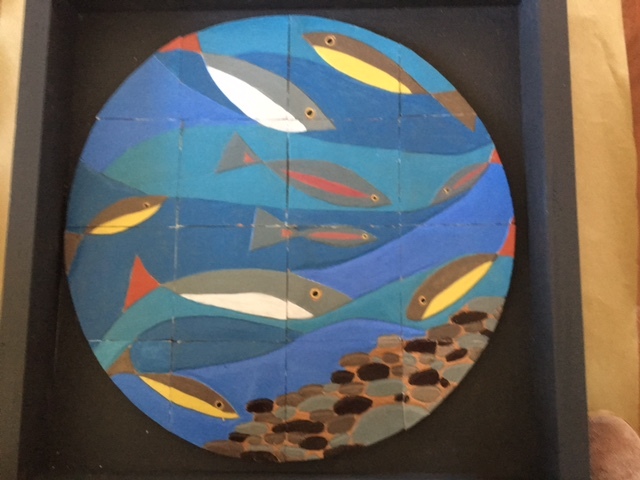 The circle is representative of the CEACA facility, being a reflection of inclusiveness and equality for all, togetherness, sharing, completion, regeneration, connections and a focus point. 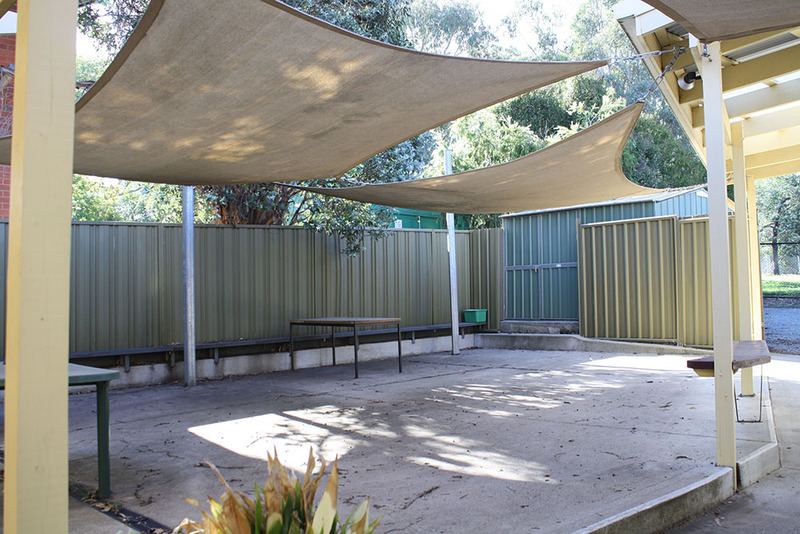 The back of the courtyard area is both a practical work space and a relaxation zone. 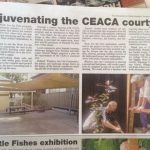 A timber deck provides a warm inviting aspect, around which, planters and green landscaping will be installed providing a lush backdrop to the courtyard. 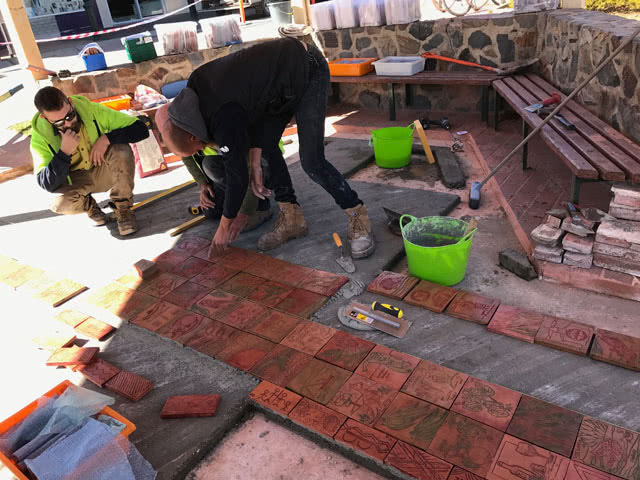 This corner of the courtyard then steps down into a practical space for outdoor work with large tables that will facilitate opportunities for project work and general craft sessions. 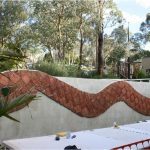 Bordering the two levels is a curved wall with seating and planting. 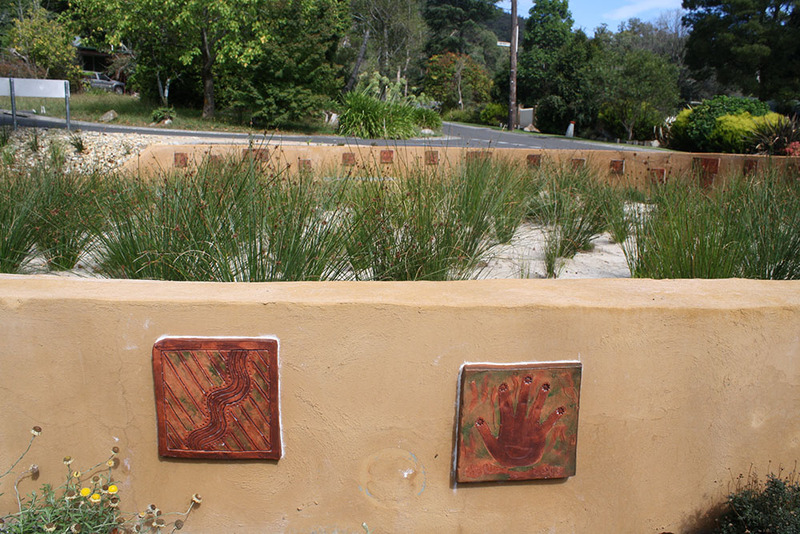 These lines in the landscaping connect with the inspiration for the overall framing of the area, being the mountains and hillsides of Alexandra . 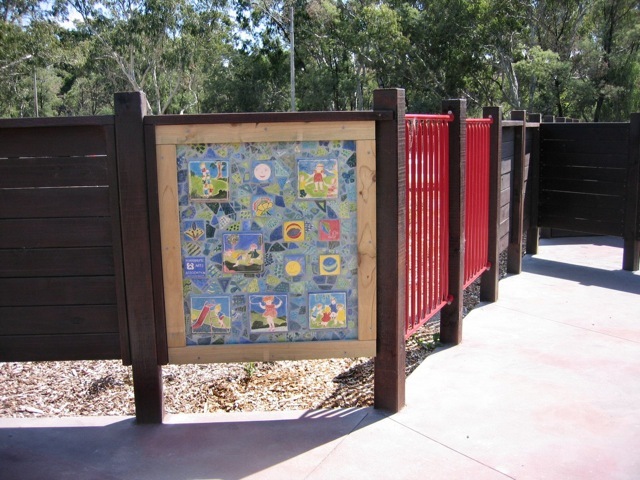 This links with the curved lines of the fencing structure.. 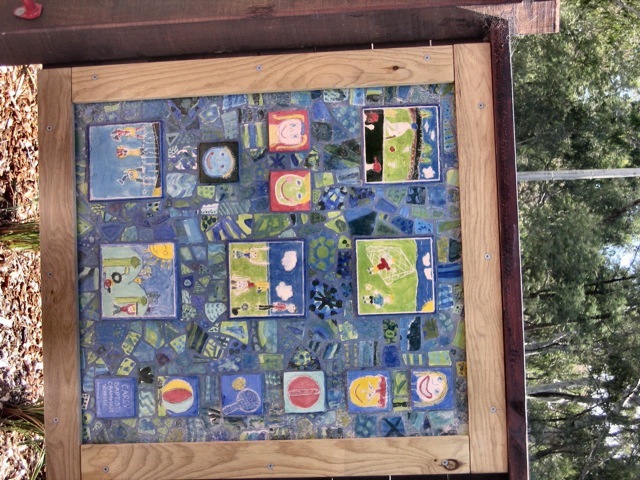 The inserts within this framework are “Windows into the Community”. 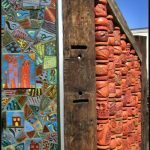 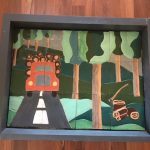 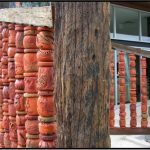 These windows make symbolic references to the Agriculture, the Flora and Fauna the Rivers and waterways, the Logging industry, Tourism and the Indigenous perspective. 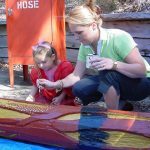 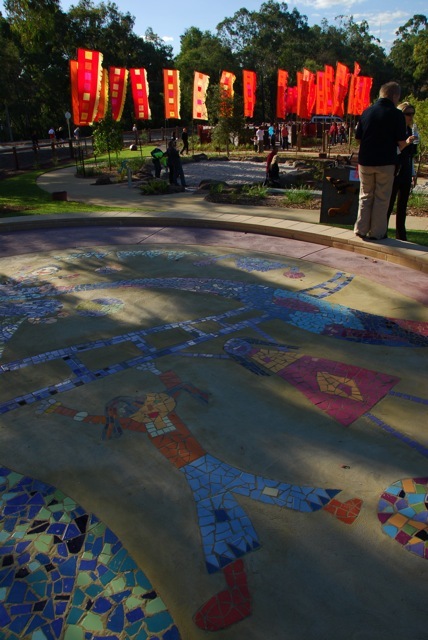 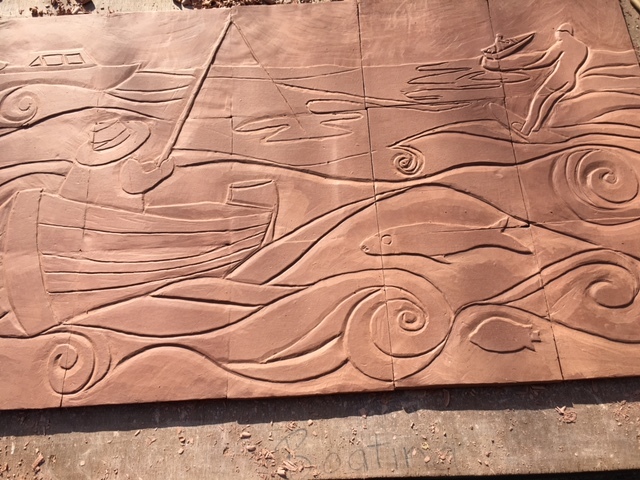 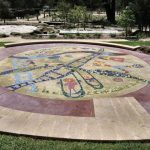 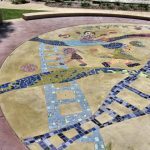 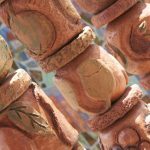 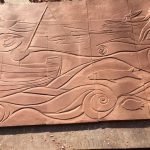 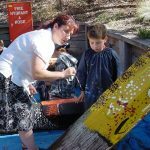 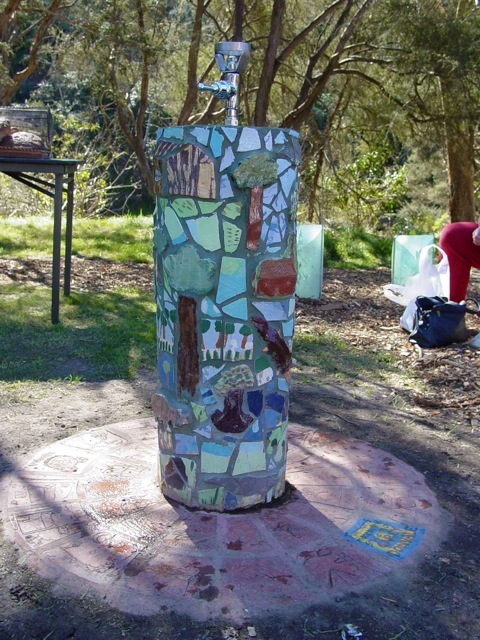 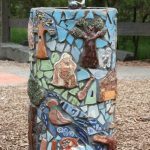 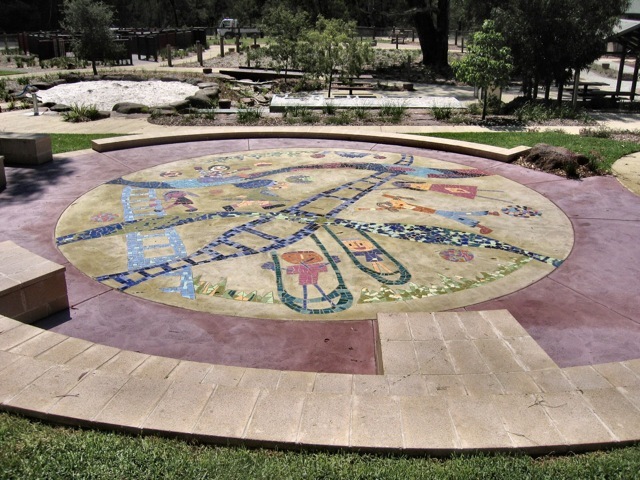 Our Fountains are placed in a playground along the Yarra River and the images on them are based on the Gold Rush Period and the Flora and Fauna of the surrounding landscape. 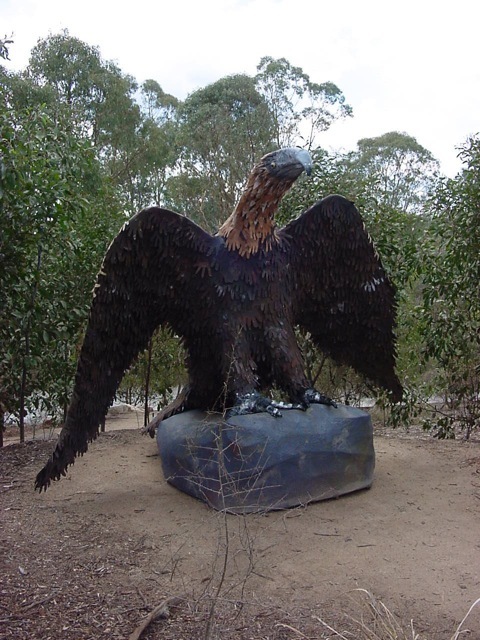 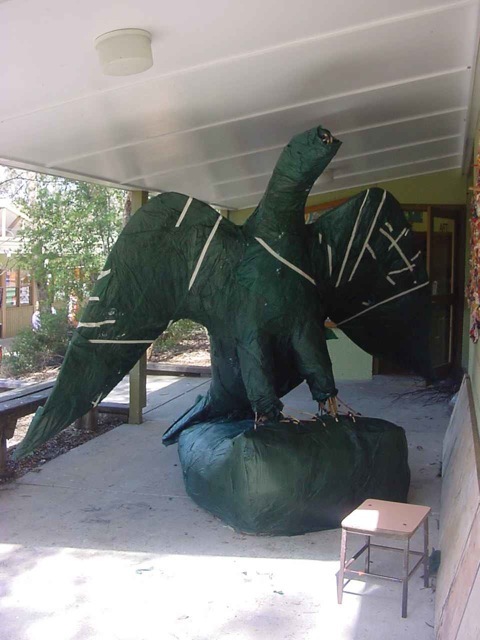 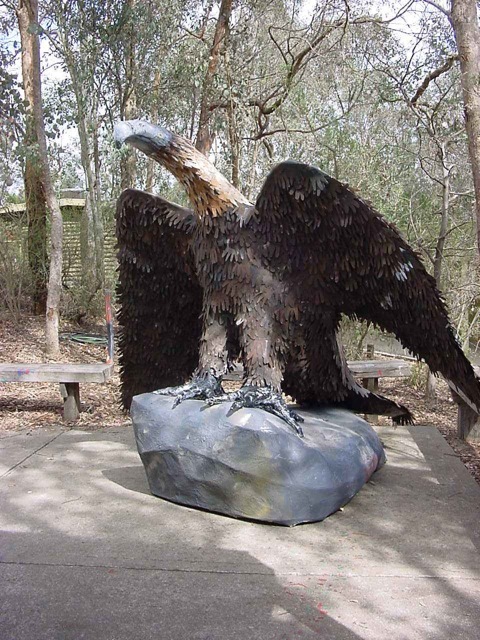 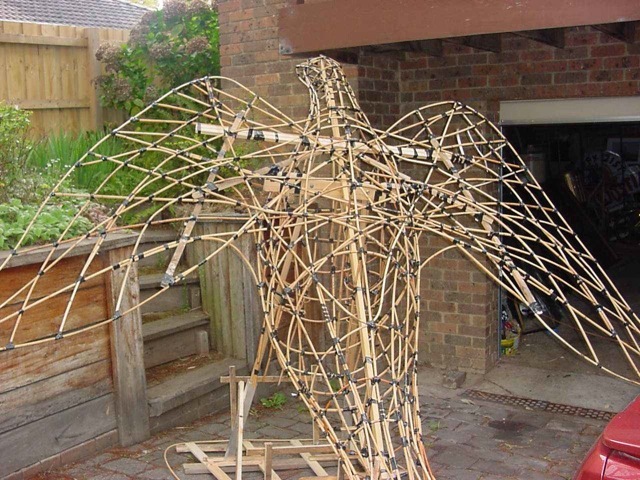 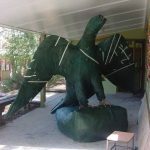 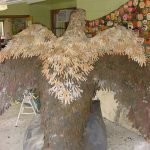 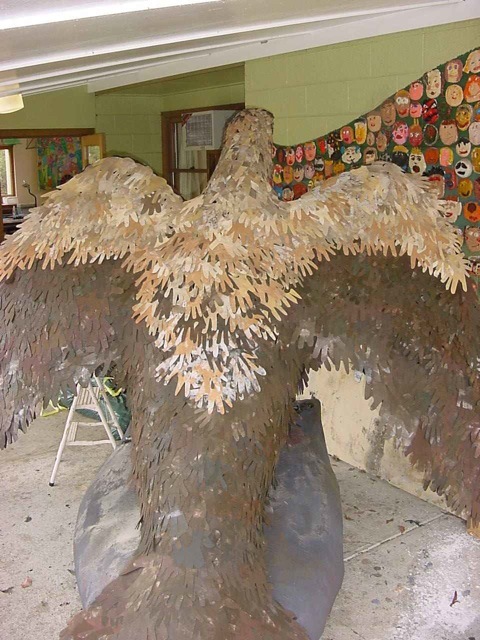 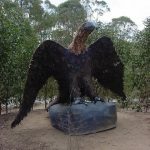 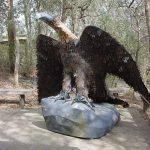 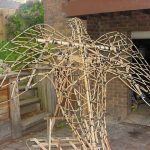 This Wedge Tailed Eagle was created for our Australia Day Festival and stands over 3 metres with a wing span of over 5 metres. 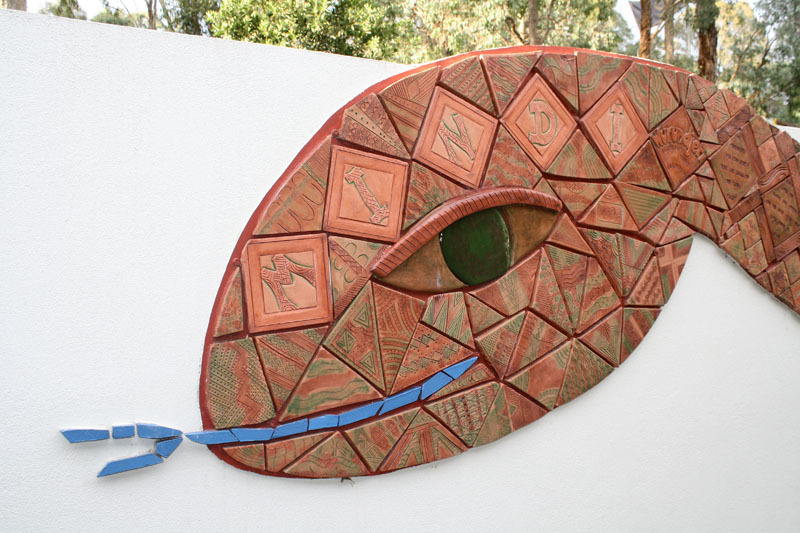 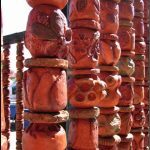 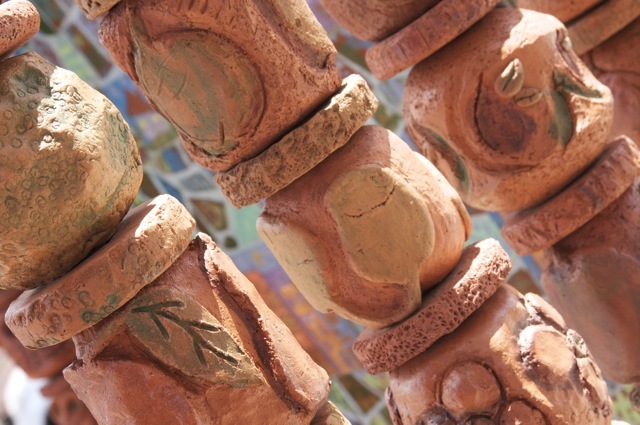 It is the symbol of our local Indigenous Tribe and travelled extensively throughout the City. 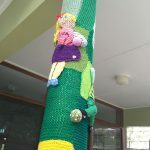 Now residing in our cultural centre. 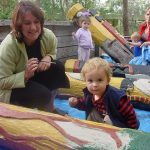 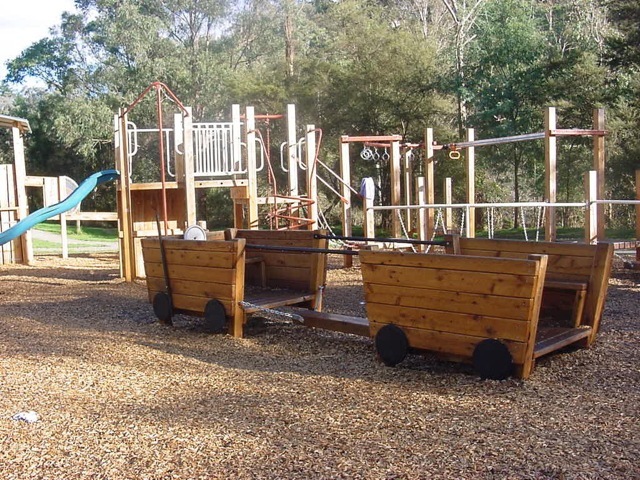 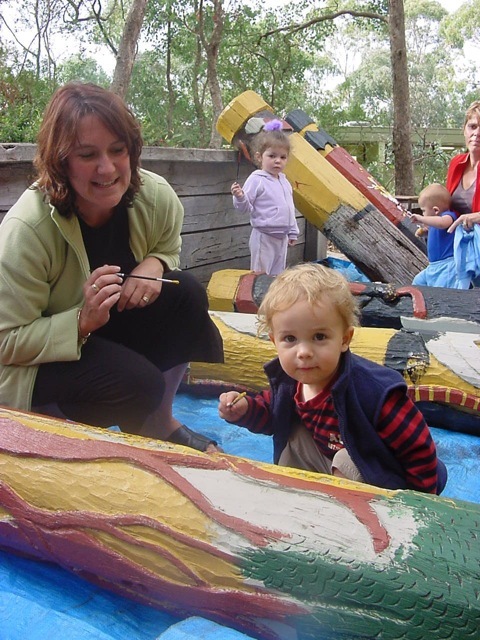 This playground is an all abilities play space and has involved participation by many diverse community groups and individuals. 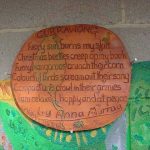 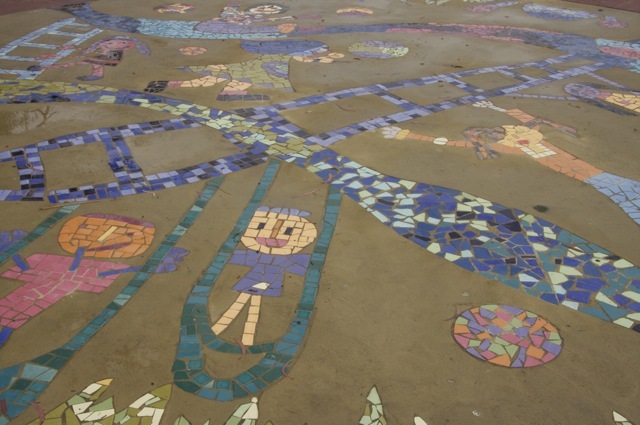 The main project within the playground is an interactive circular mosaic called 'The Circle of Friends'. 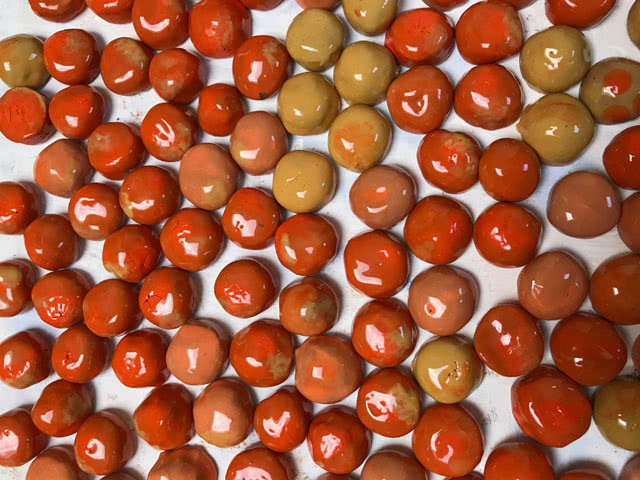 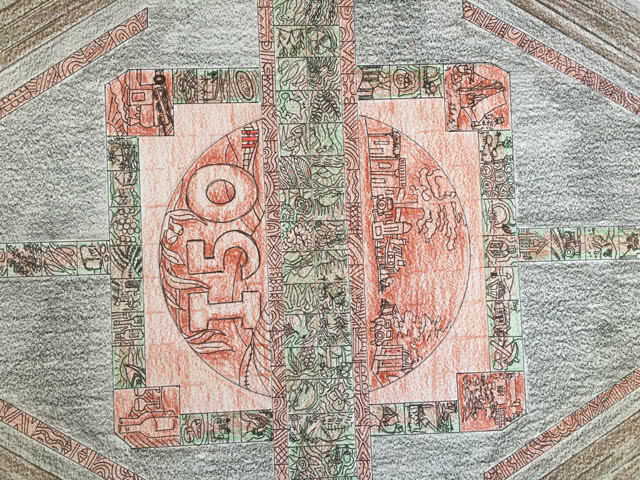 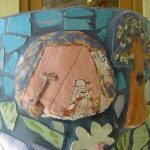 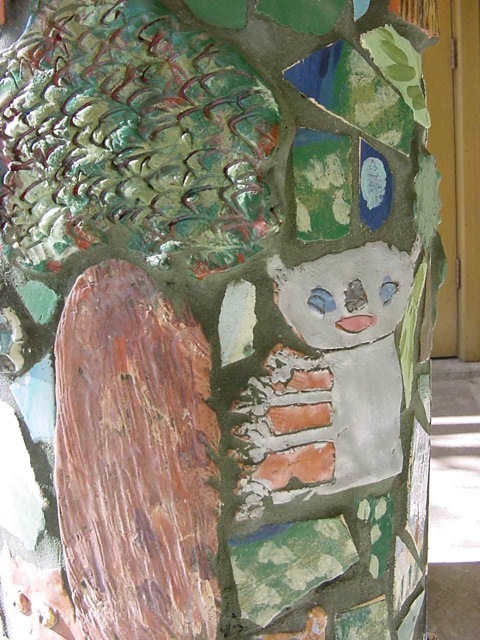 The concept design for this work was based on the students drawings. 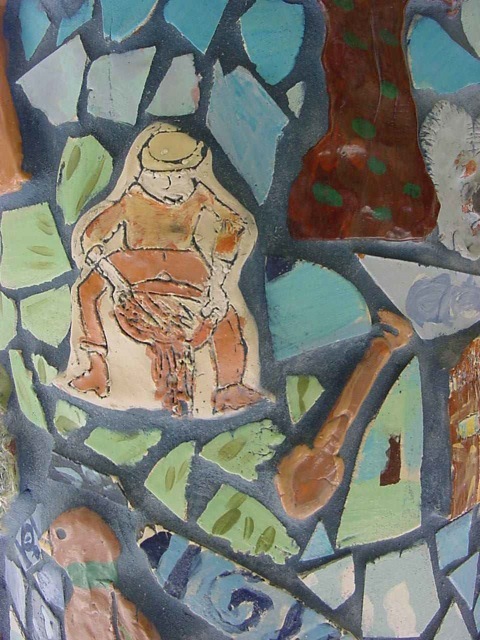 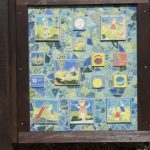 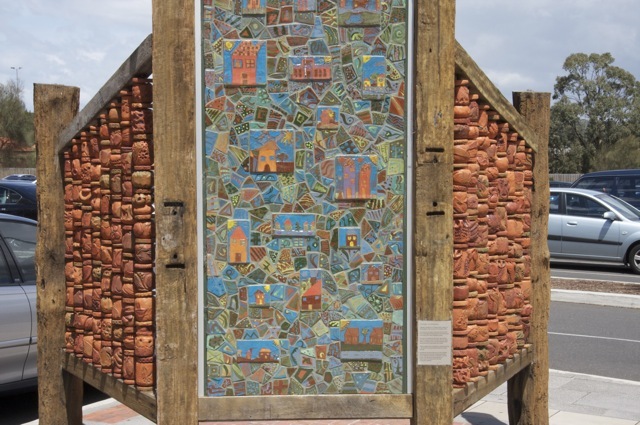 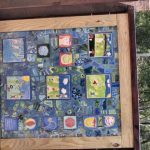 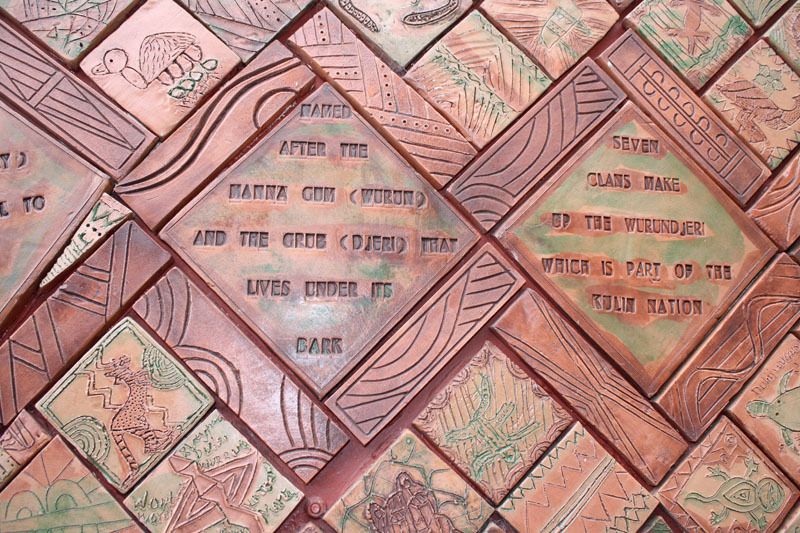 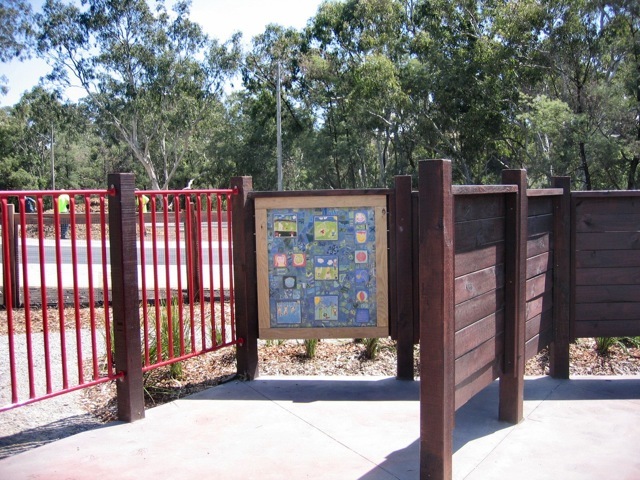 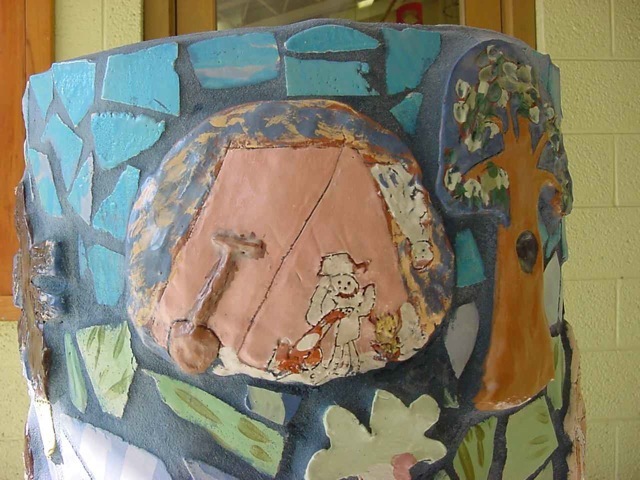 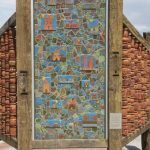 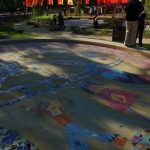 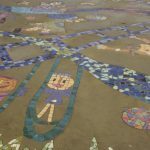 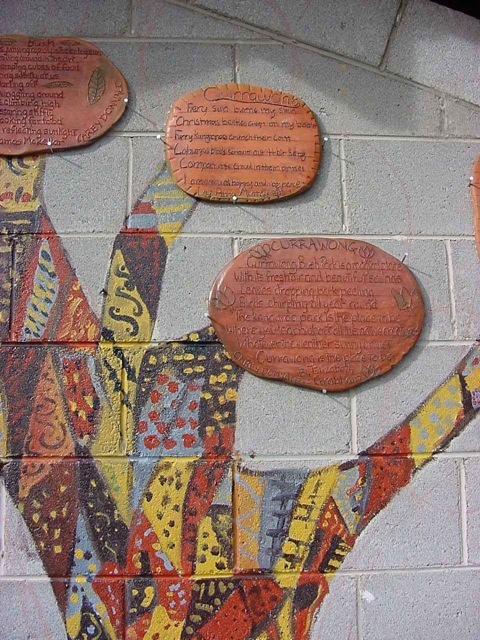 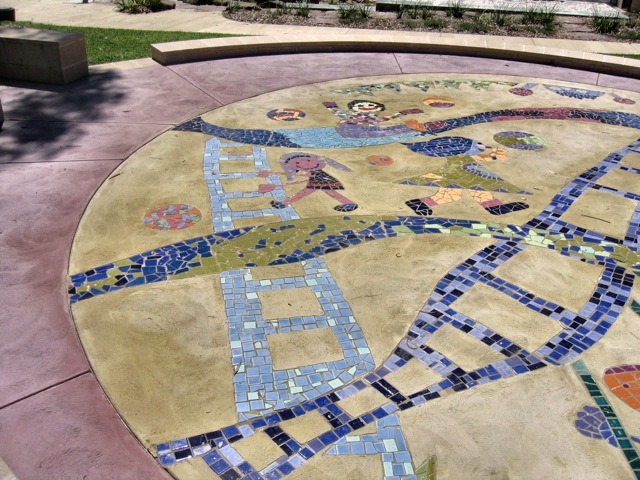 The other work within the playground visually enhances the maze area and is in the form of Mosaic panels based on the theme 'Play through the Ages'. 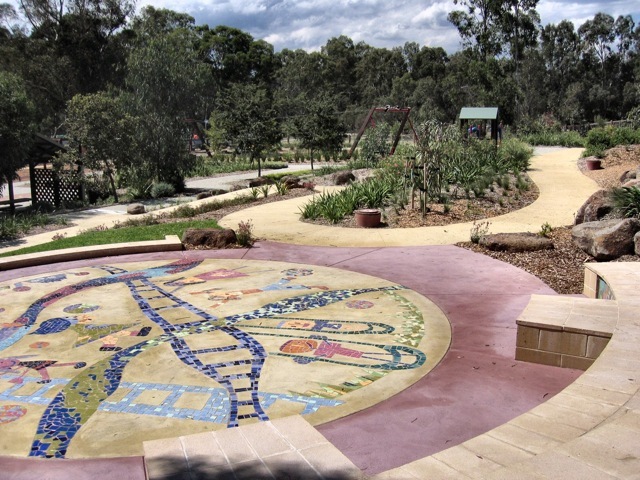 This project was funded by the City of Manningham. 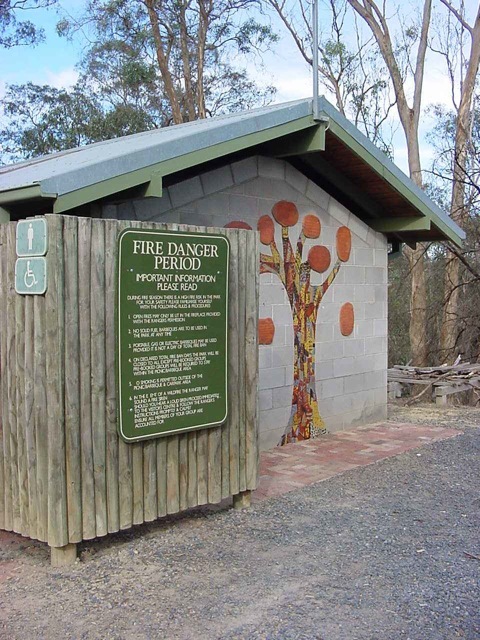 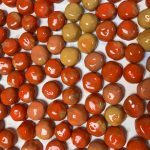 This project has developed from the tragedy of the Bush Fires of Black Saturday in Victoria, Australia. 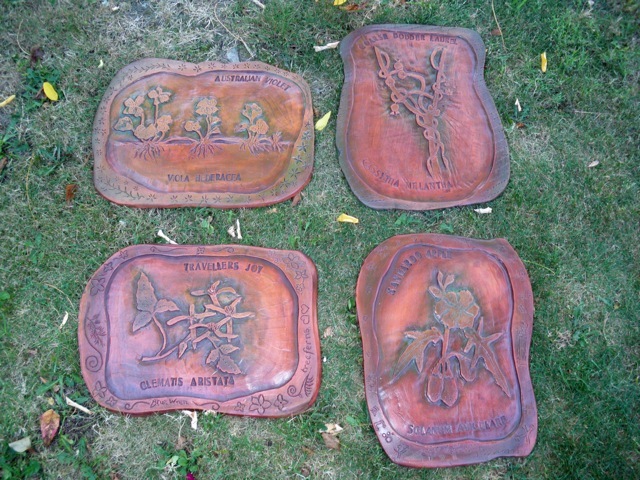 A Botanist and Educator Alice Talbot drew illustrations of all of the road side plants that existed prior to the fires. 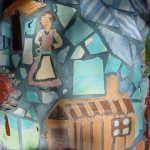 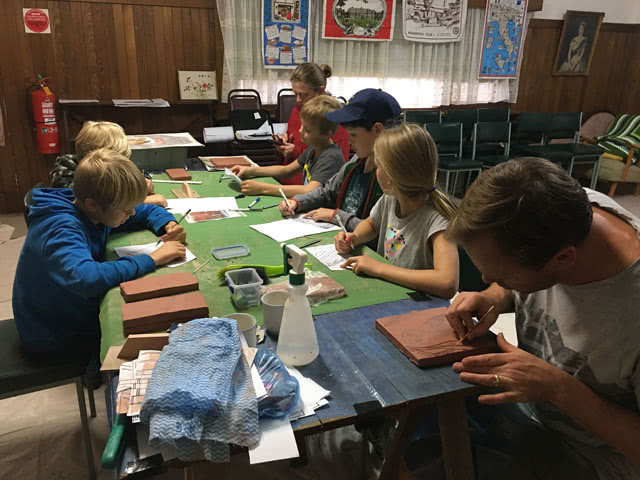 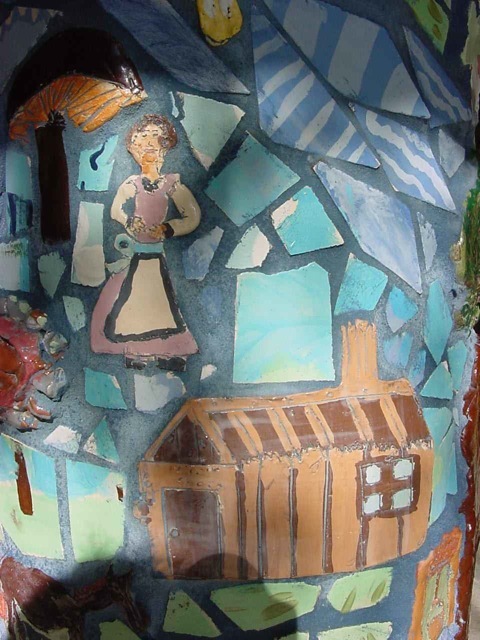 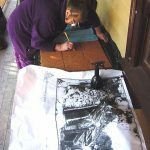 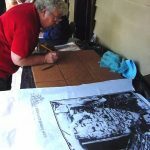 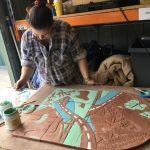 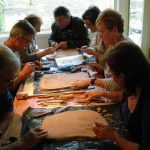 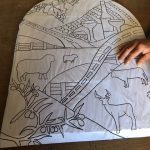 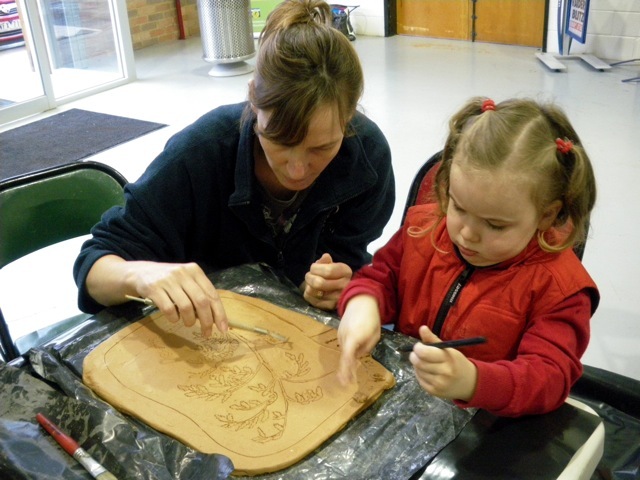 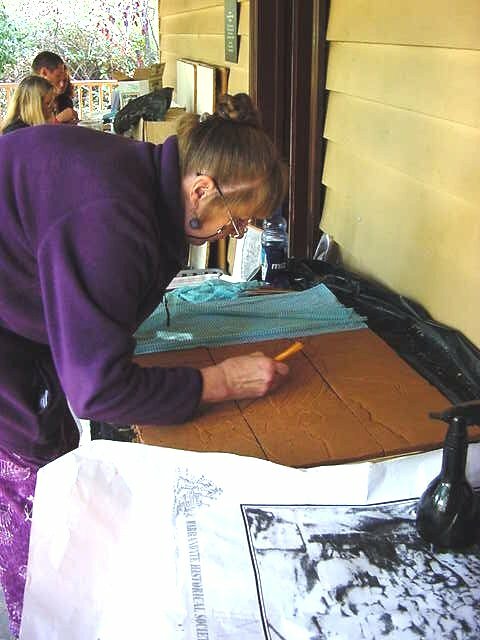 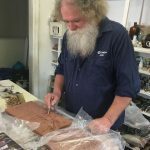 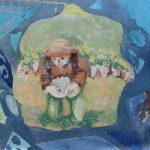 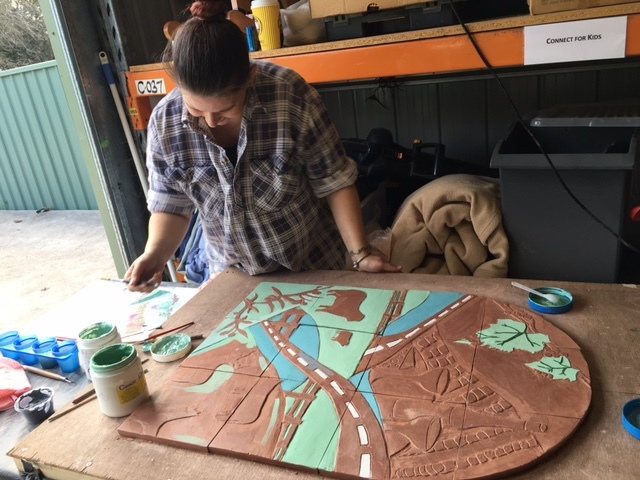 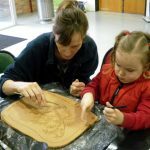 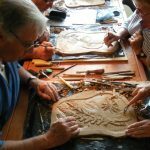 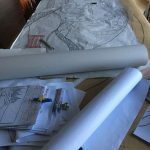 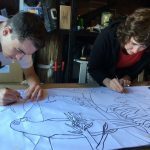 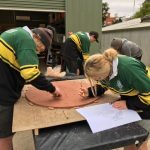 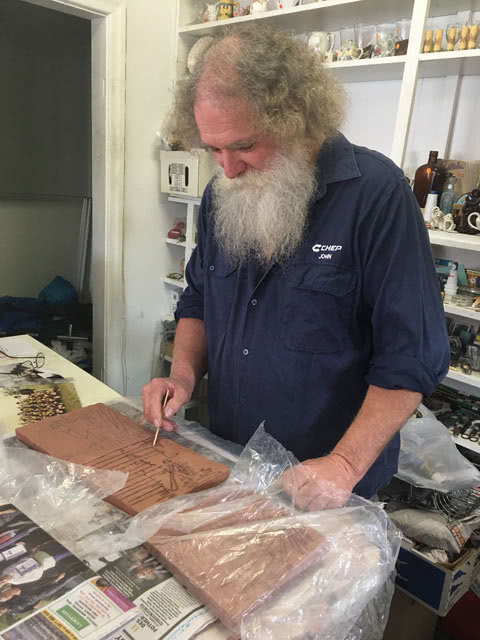 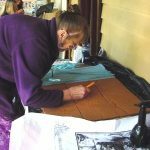 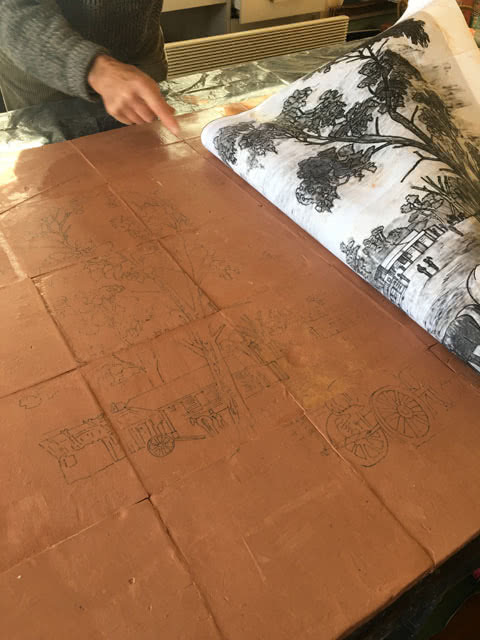 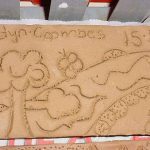 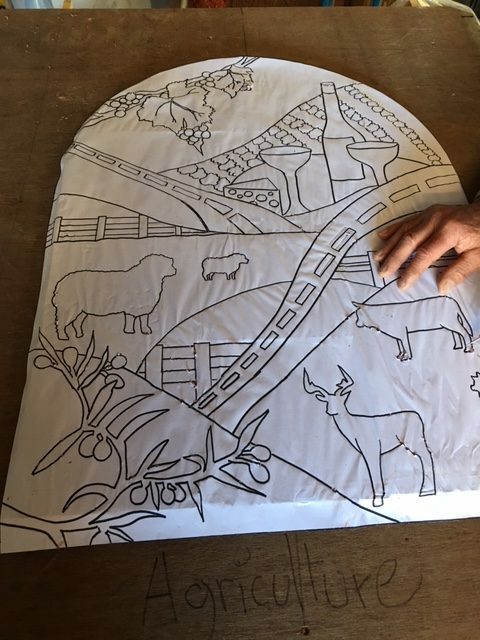 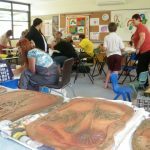 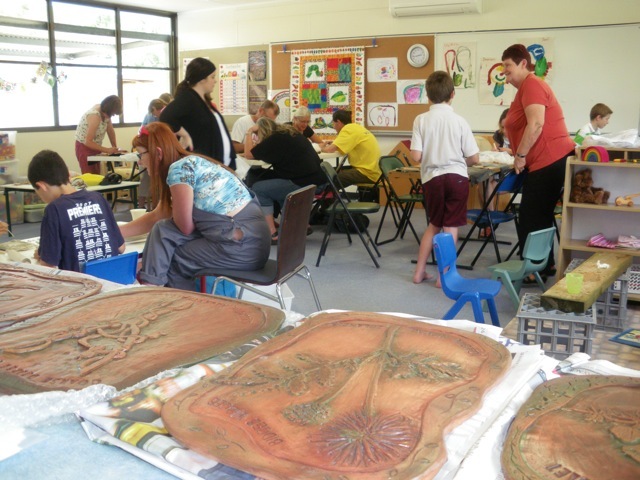 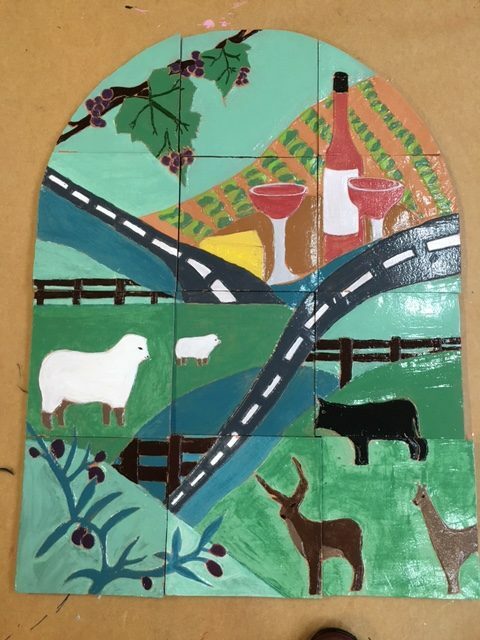 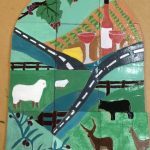 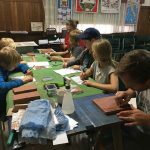 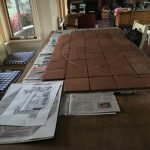 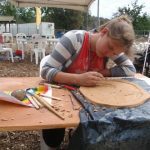 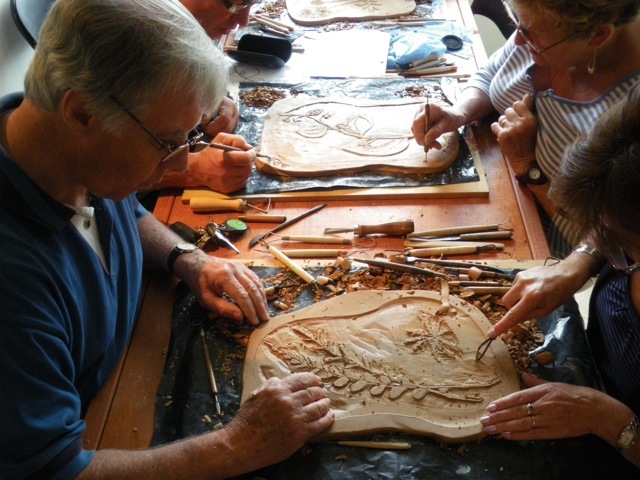 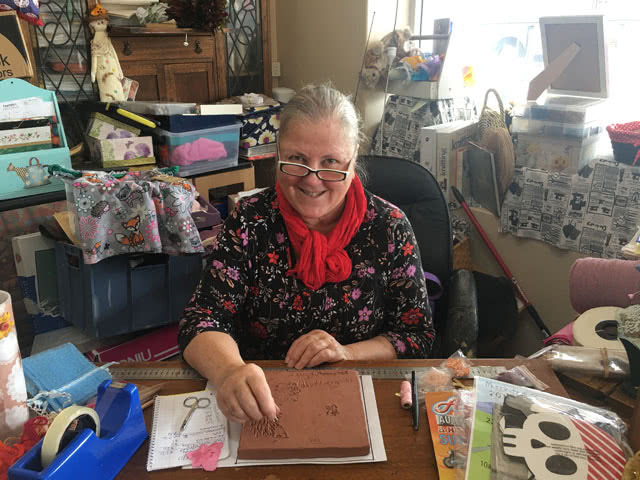 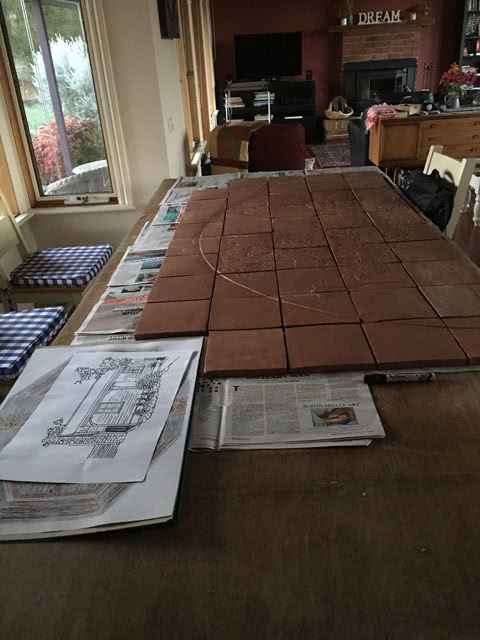 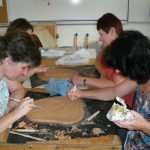 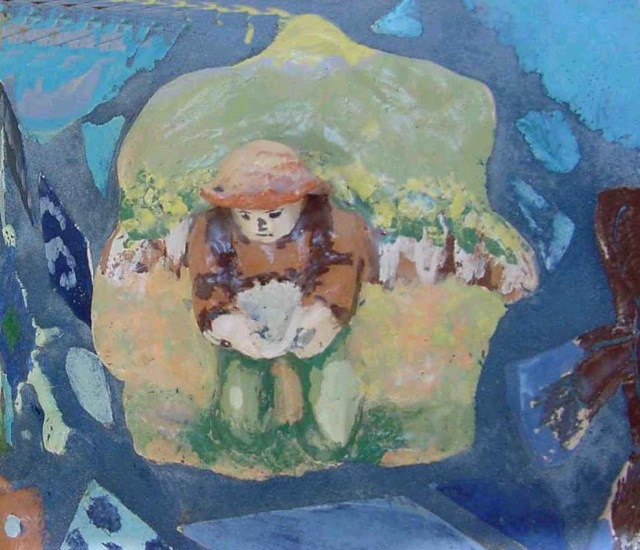 These illustrations have been transferred onto clay plaques and workshops have been held throughout the shire for residents and volunteers to be involved. 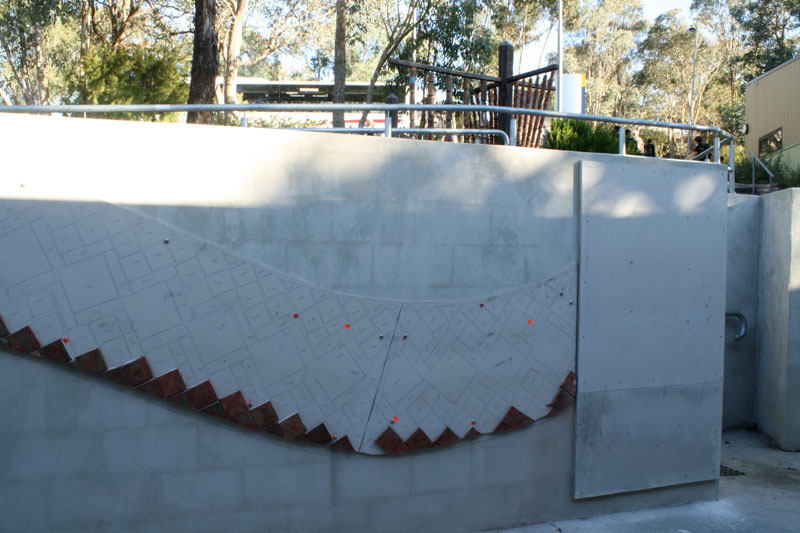 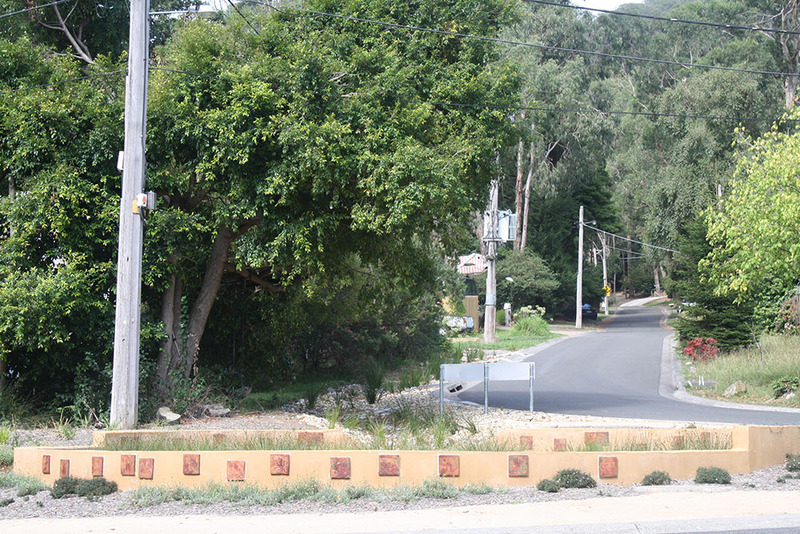 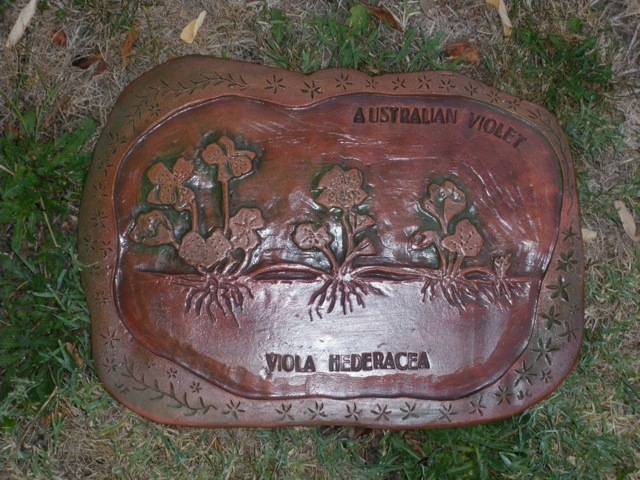 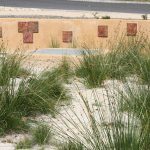 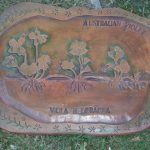 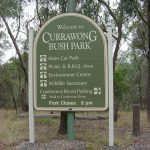 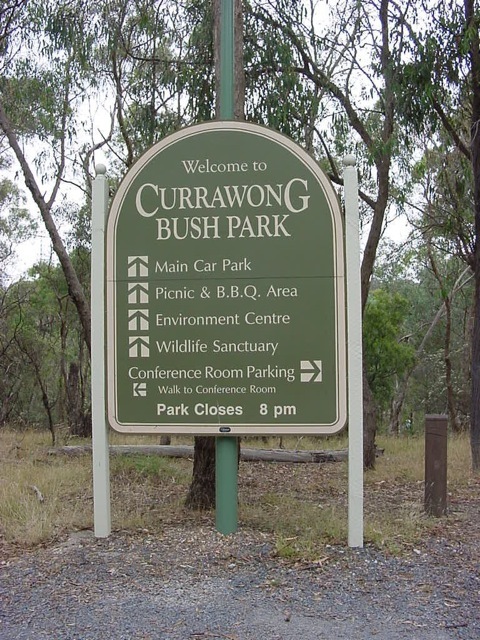 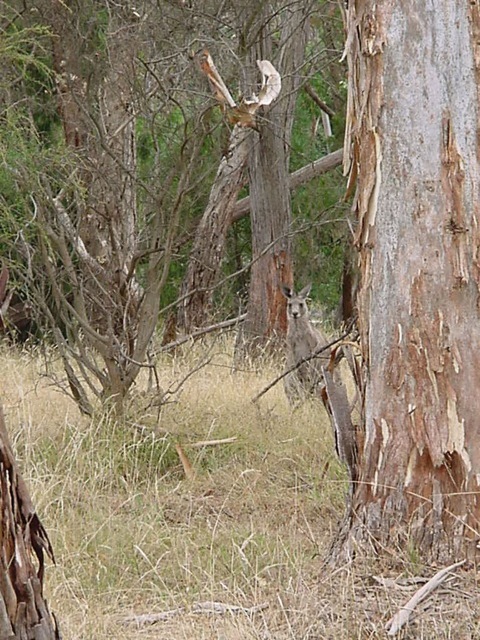 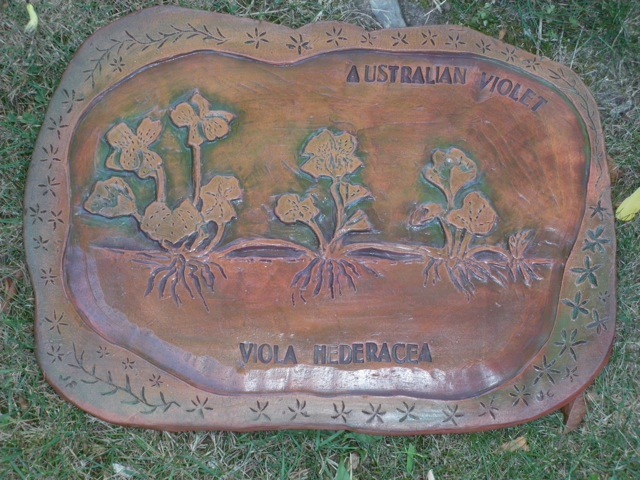 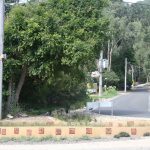 It is anticipated that the plaques will be placed along the walking trails and throughout the shire of Murrindindi. 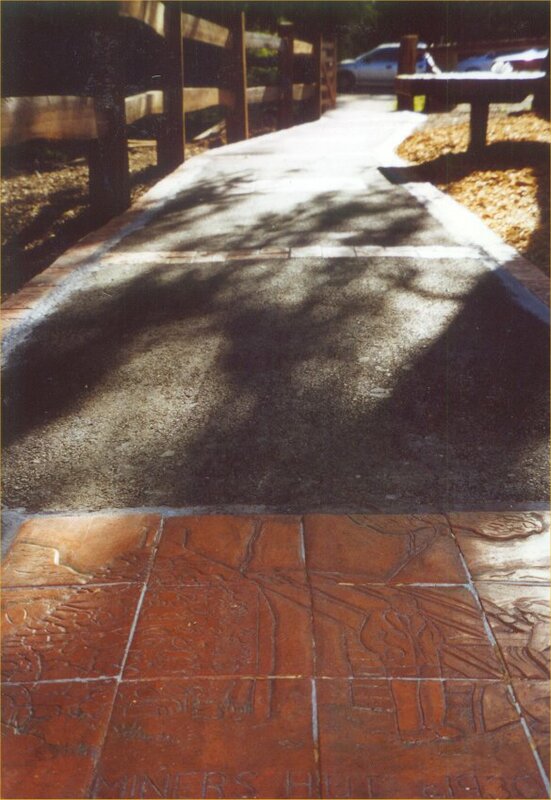 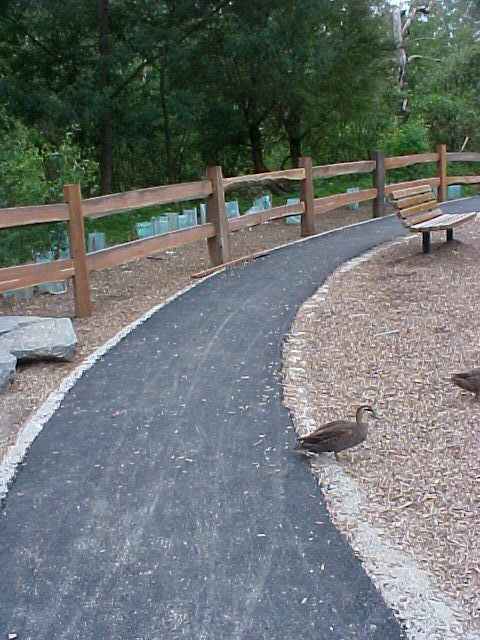 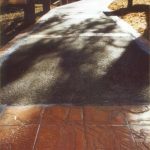 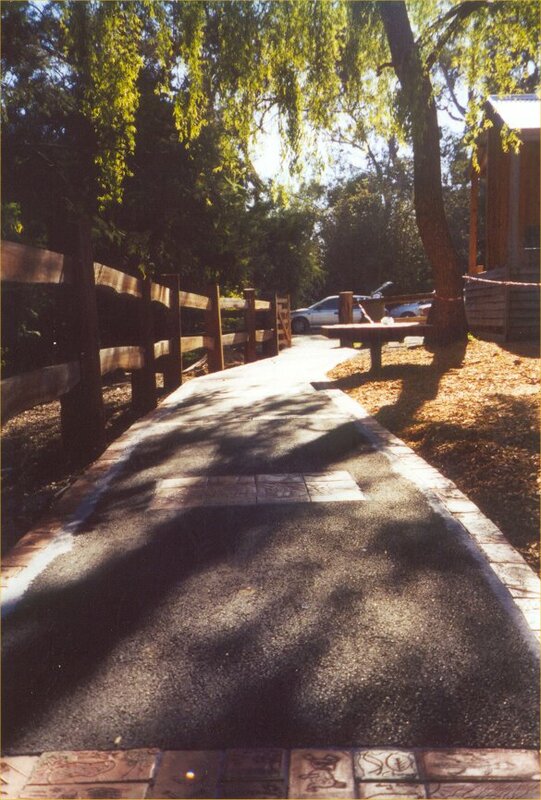 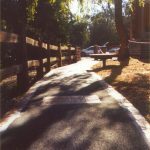 This Pathway was created to celebrate the Gold Rush Period in the area. 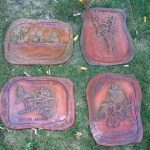 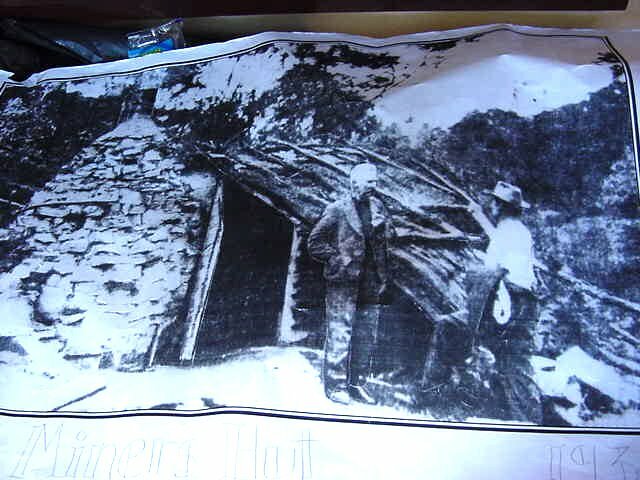 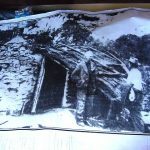 The images used were authenticated by the local Historical Society portrayed the landmarks, mine used, and local characters of the time. 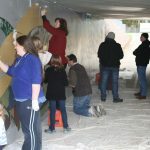 Approximately 1100 people worked on the project including local school children, community groups and local artisans. 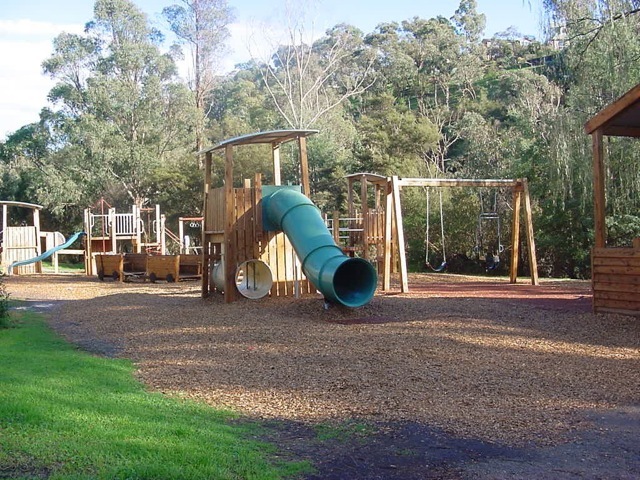 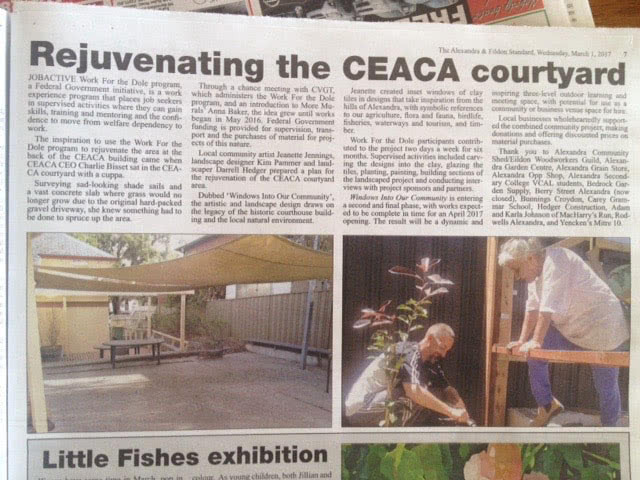 Our local government authority the City of Manningham funded the project through a community development grant. 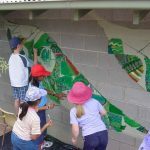 This was a local playground and the residents of the area were directly involved in the creation of the project through workshops held at our school. 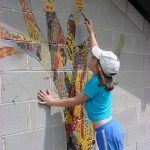 The residents who use the space now have ownership of the play ground and can enjoy their creative efforts for perpetuity. 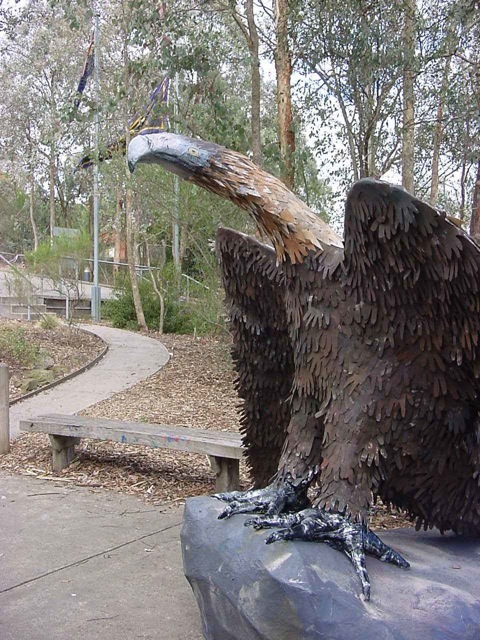 This sculpture was funded by the business group who were developing the local shopping centre. 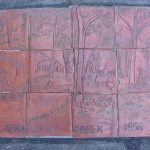 The name Pinorchen is based on the centre the Pines, the Orchards who were originally on the site and the surrounding Environment. 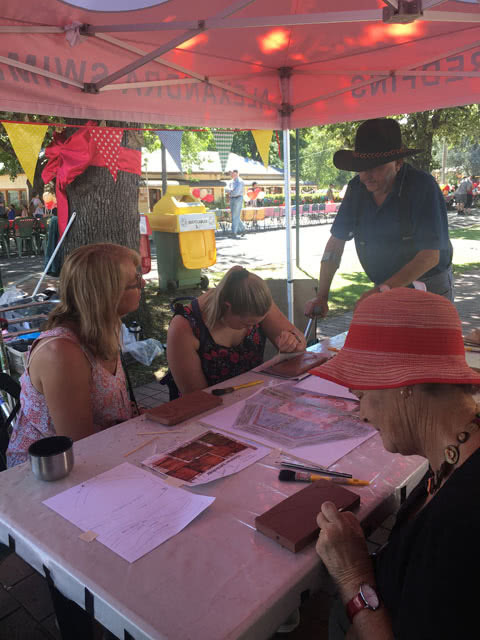 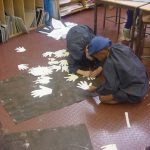 Over 650 people were involved in the construction of the work and shoppers and traders were able to participate through weekend workshops. 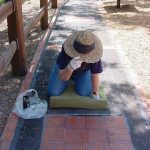 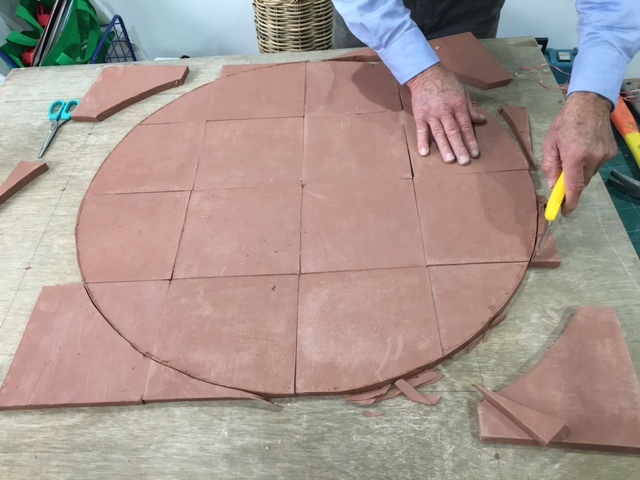 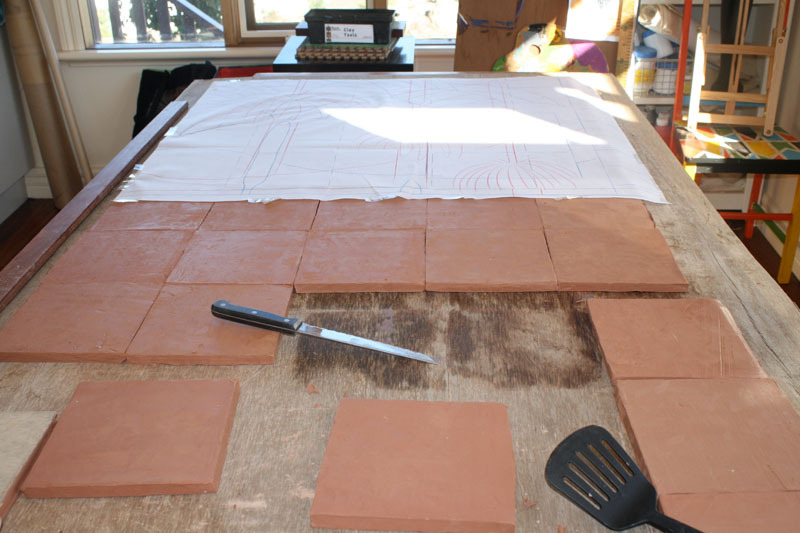 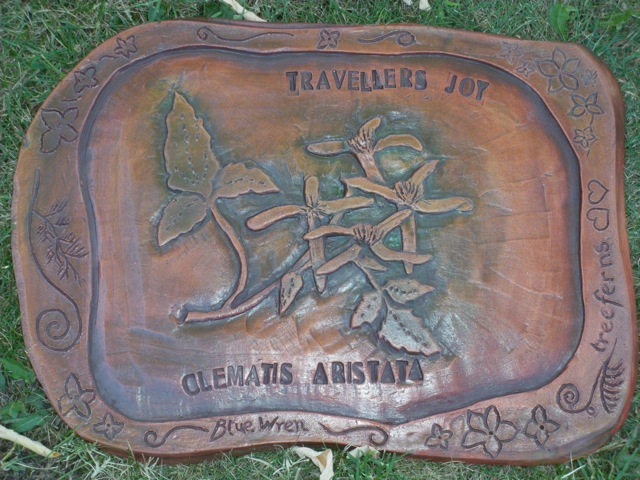 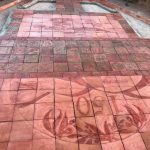 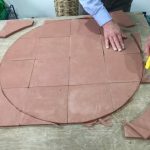 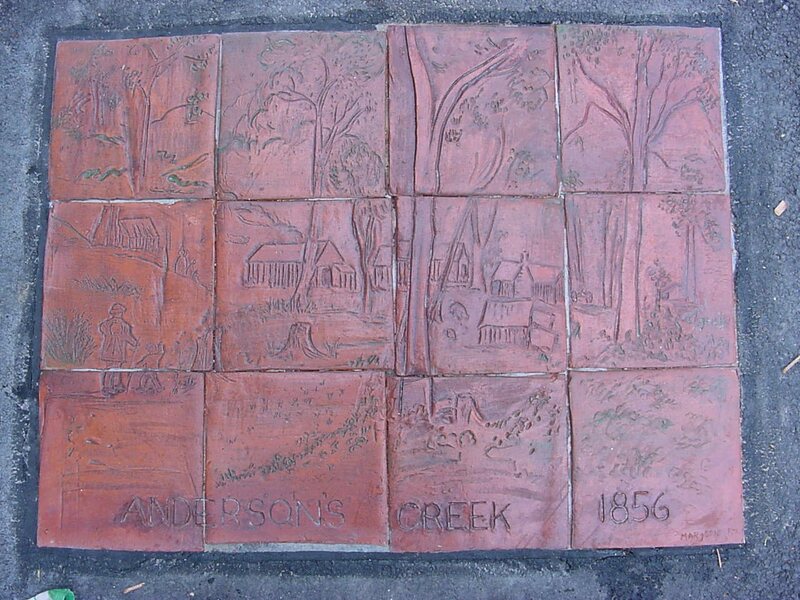 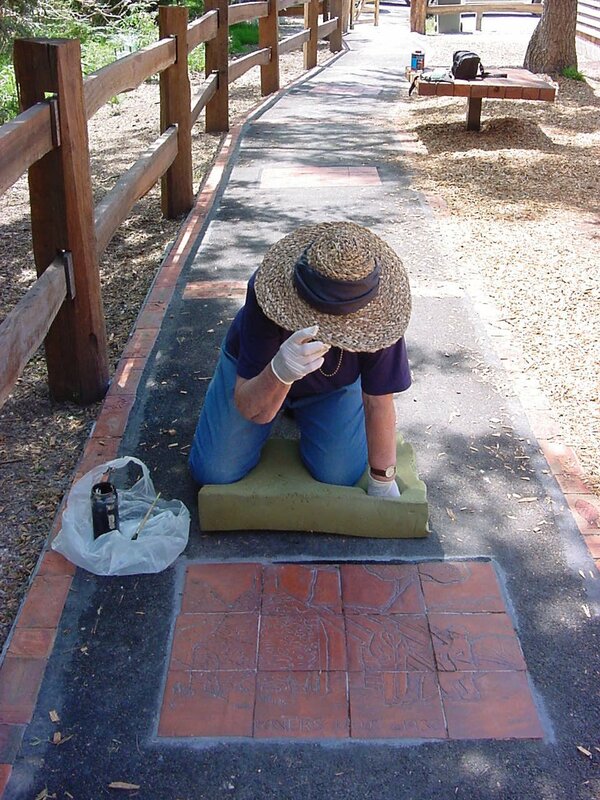 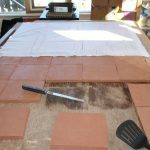 The original owner of the site also laid a clay tile to mark the earth that he had once owned.